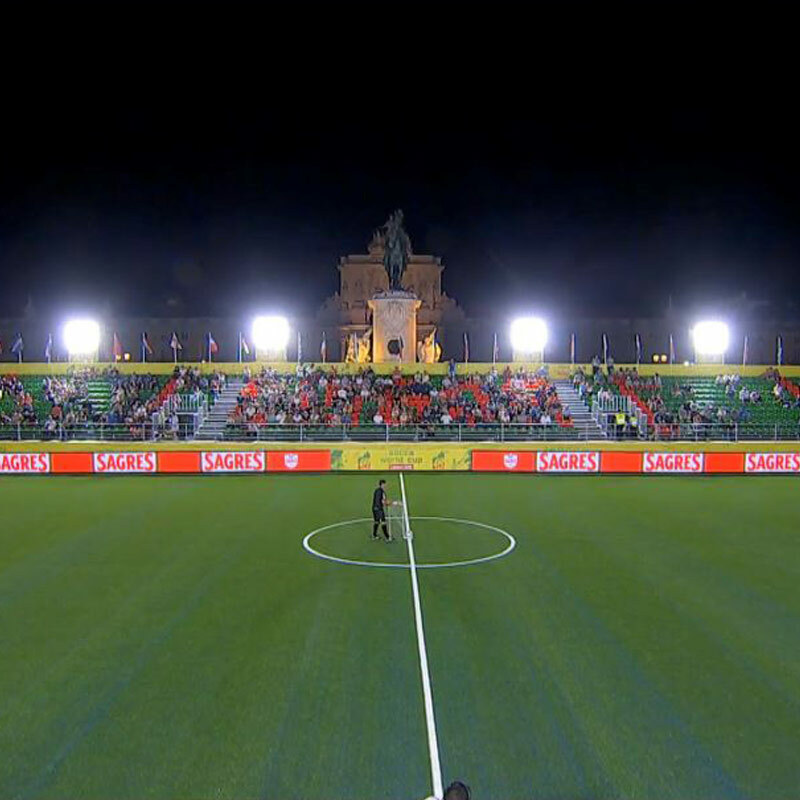 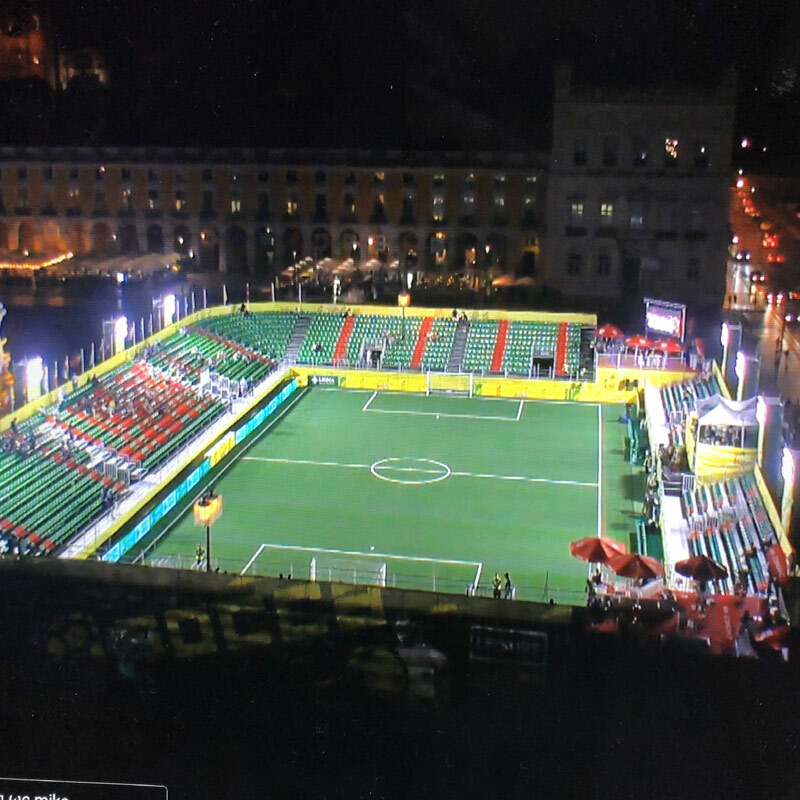 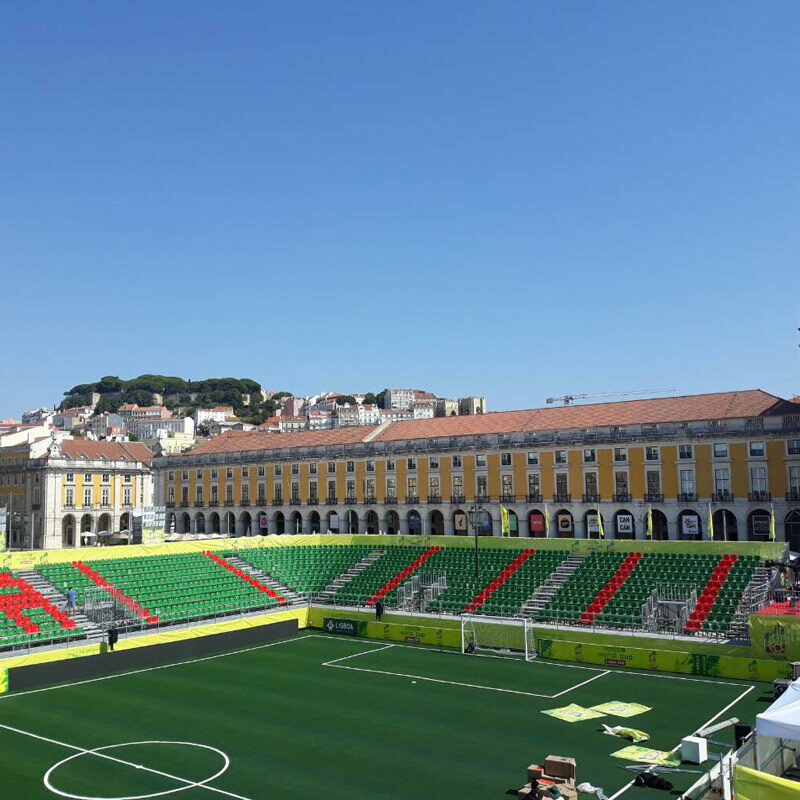 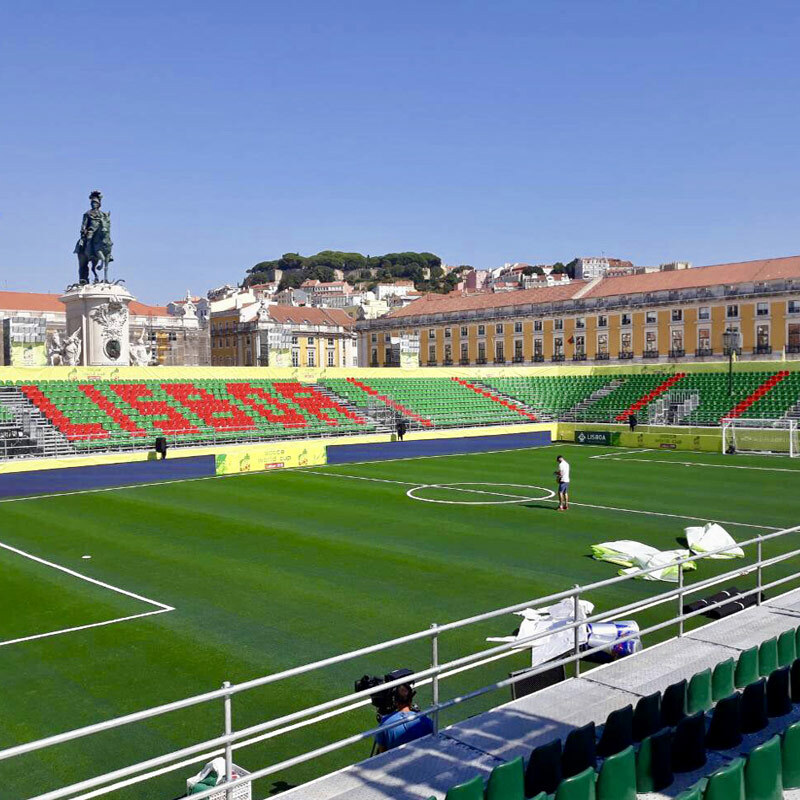 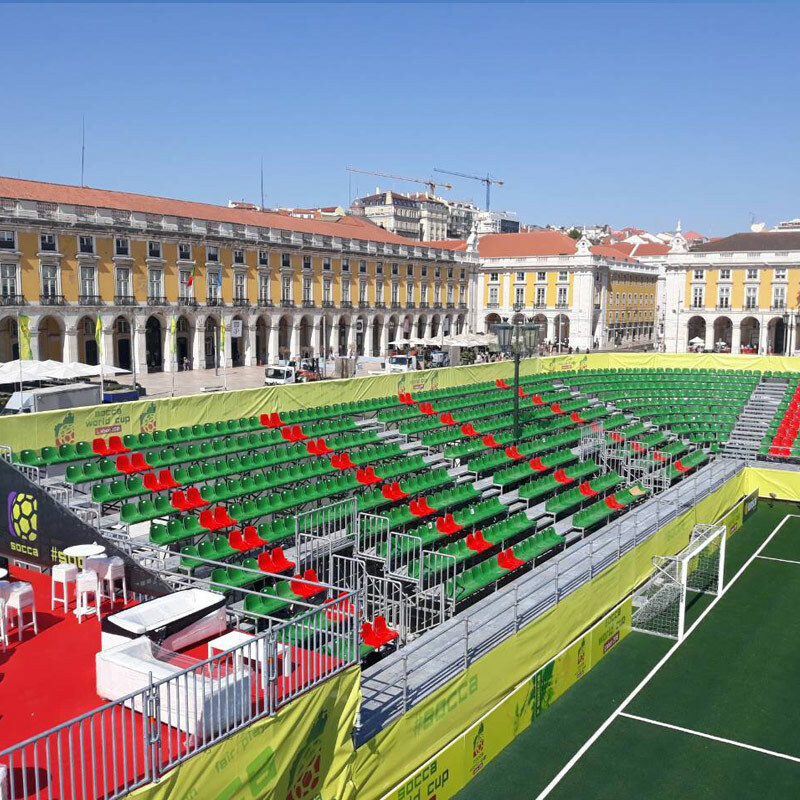 C. Hountoumadis S.A. was assigned the task of placing a grandstand with more than 3.000 seats of capacity for the Socca World Championship 2018, which was held in Lisboa, Portugal in September 2018. 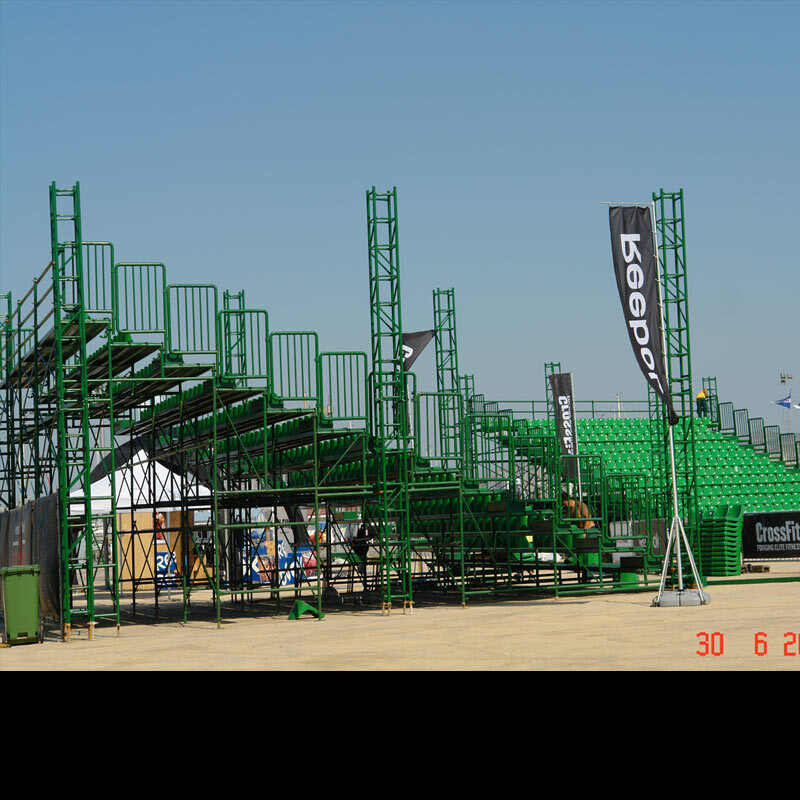 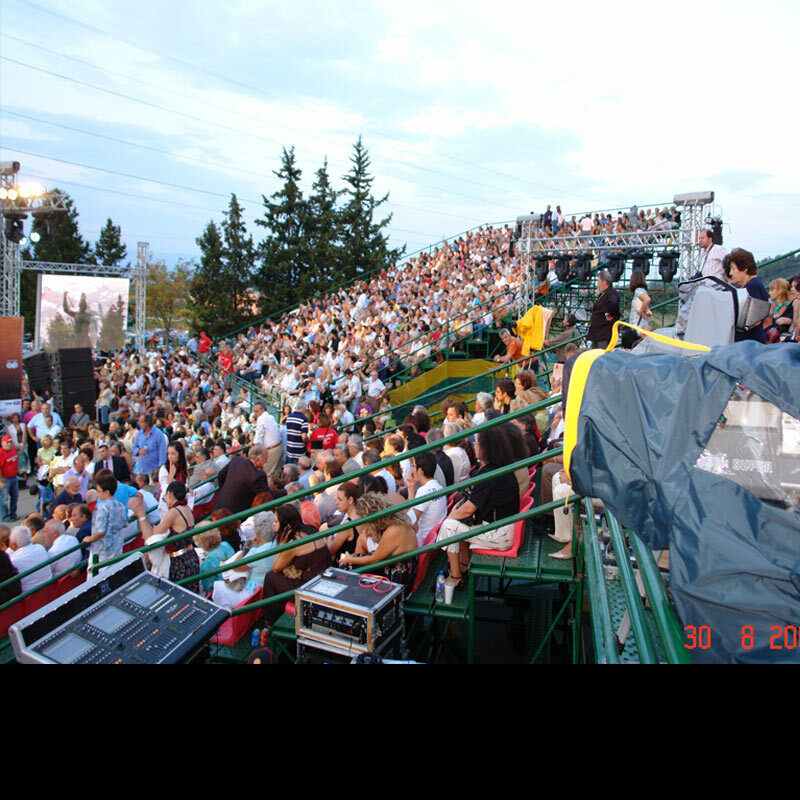 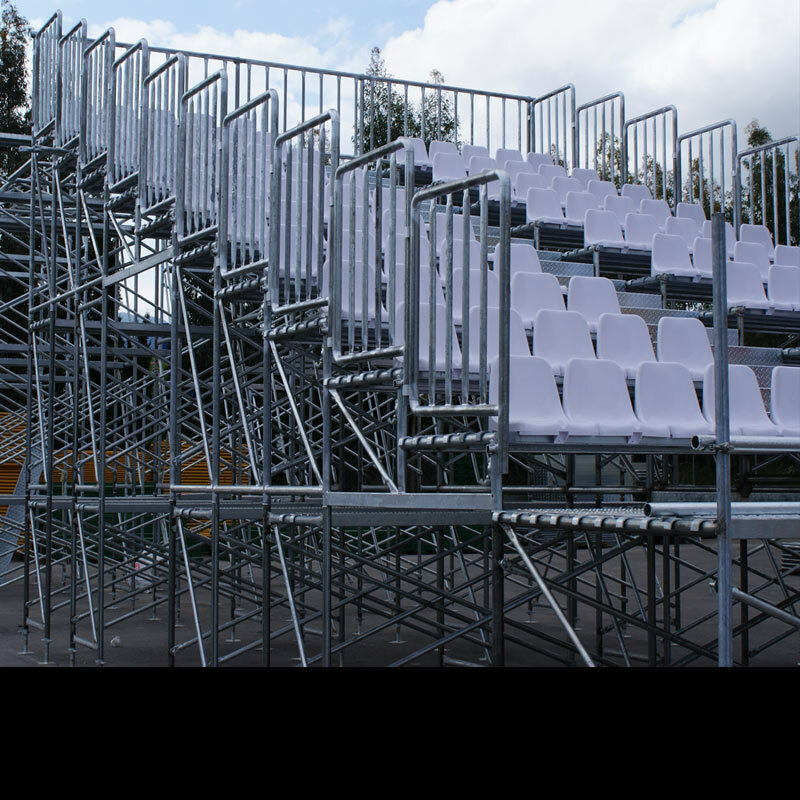 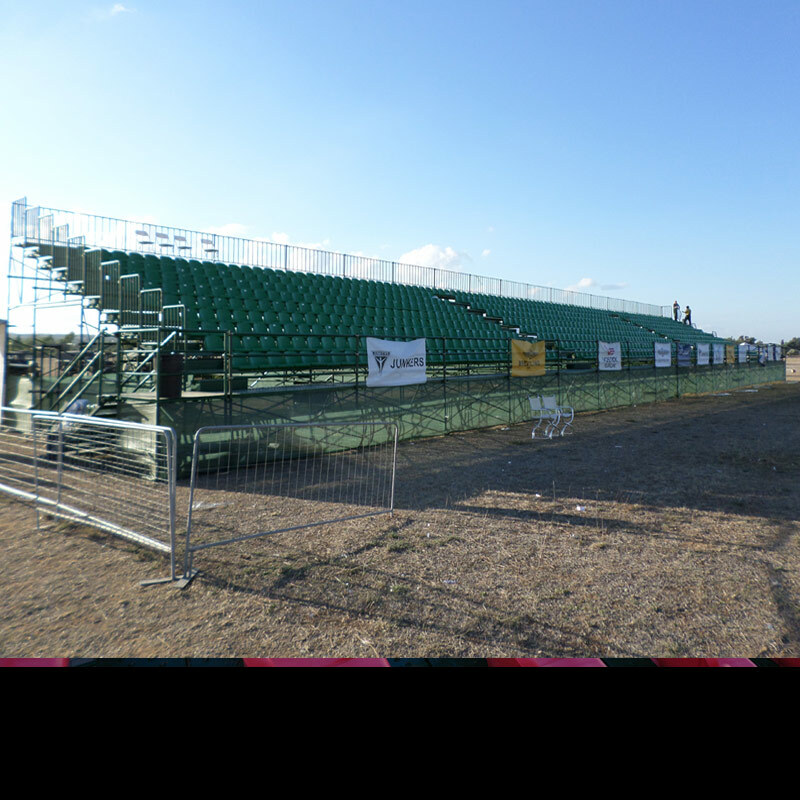 Apart from the initial rise of the grandstand our company built also the VIP guest area as well as the TV coverage platform. 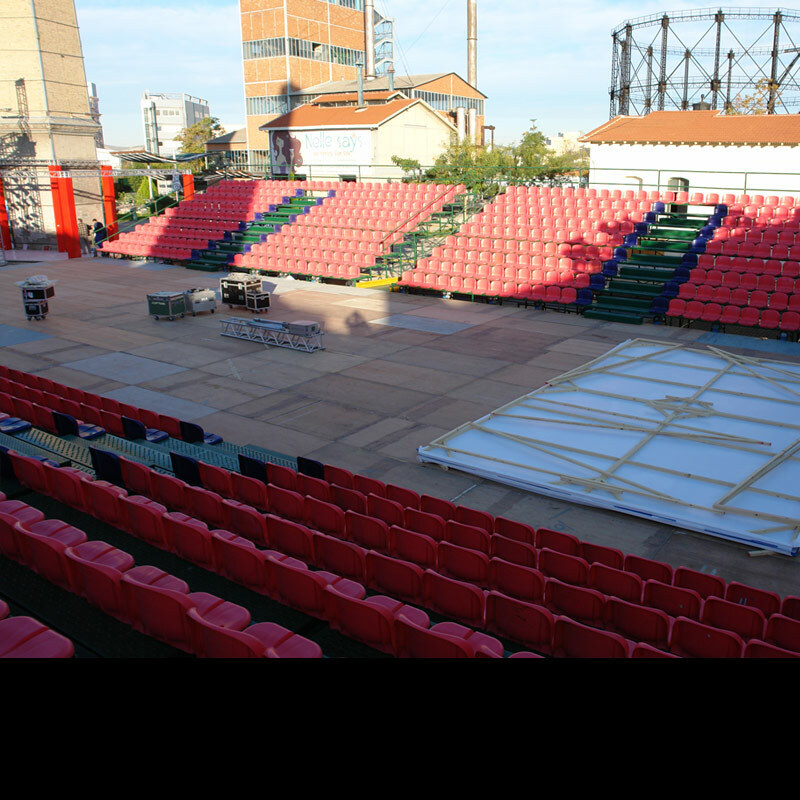 PROJECT: Settling, hiring and disassembling of two metallic tribunes with plastic seats for the Red-Bull X-Fighters Athens 2015 Games. 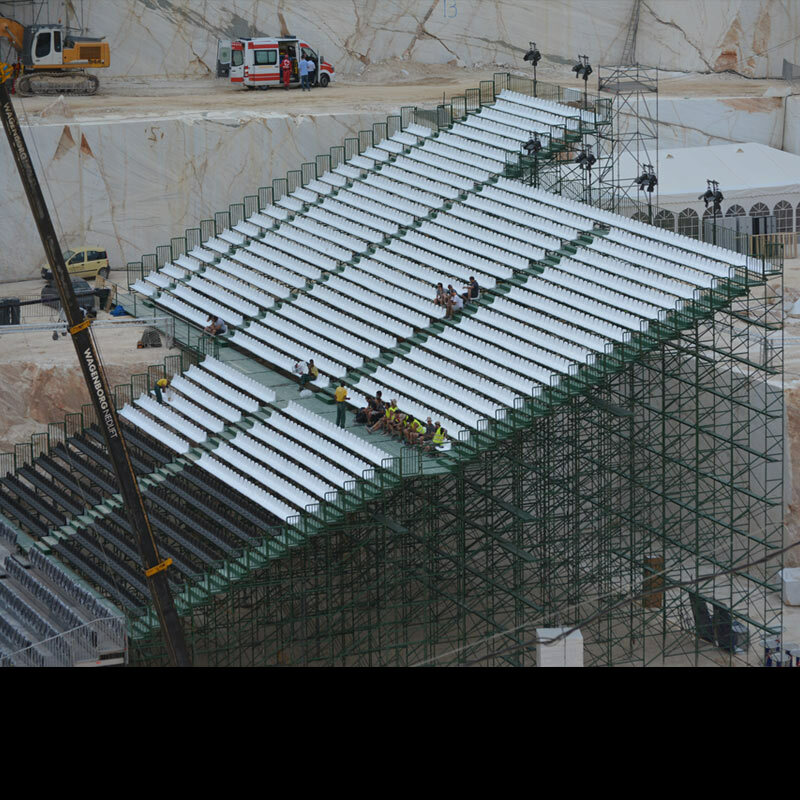 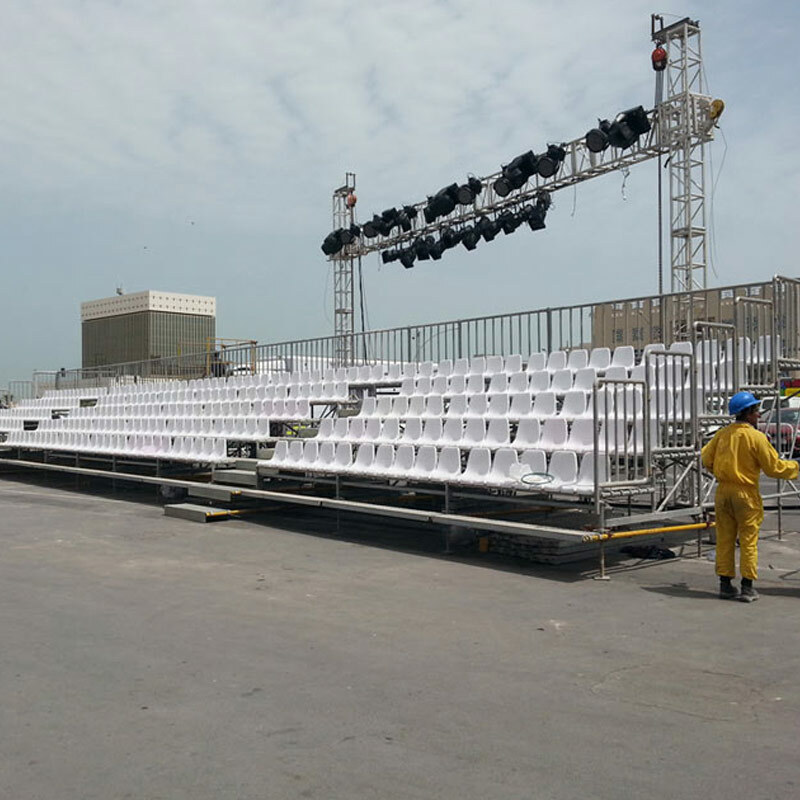 PROJECT: Placement of a metallic tribune with plastic seats at Doha. 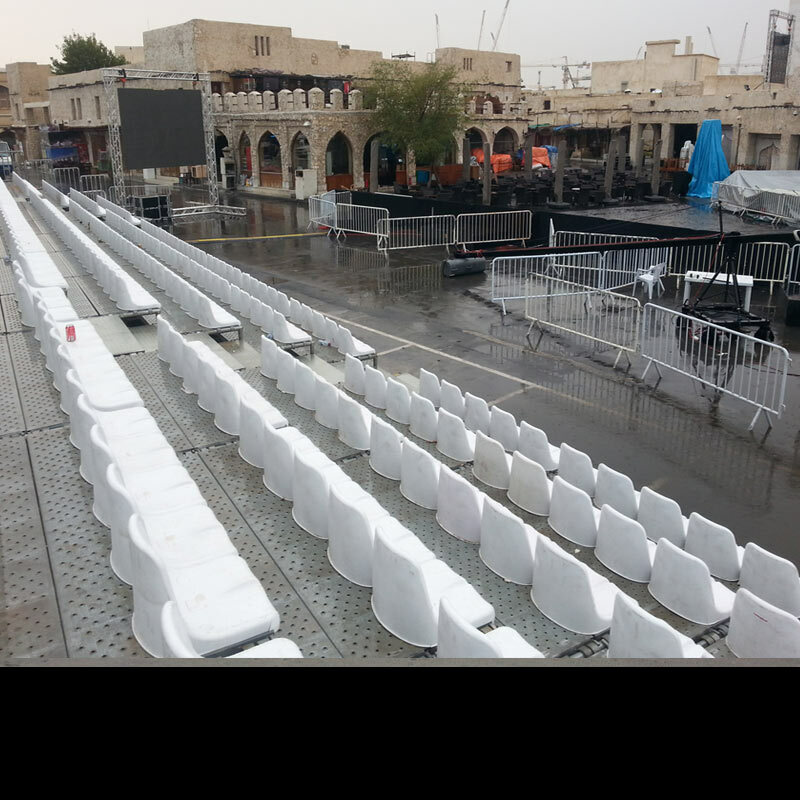 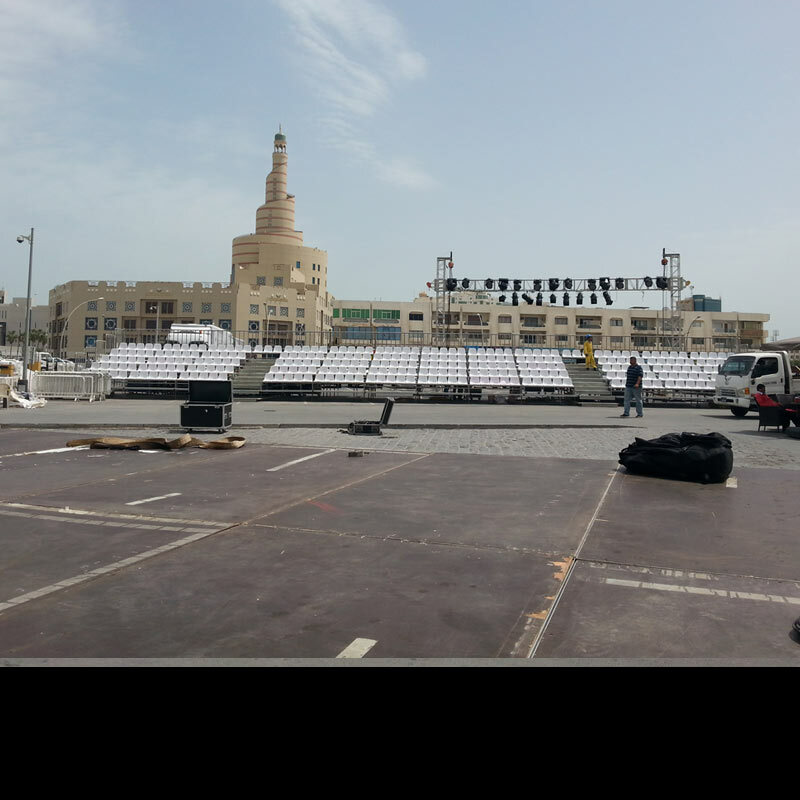 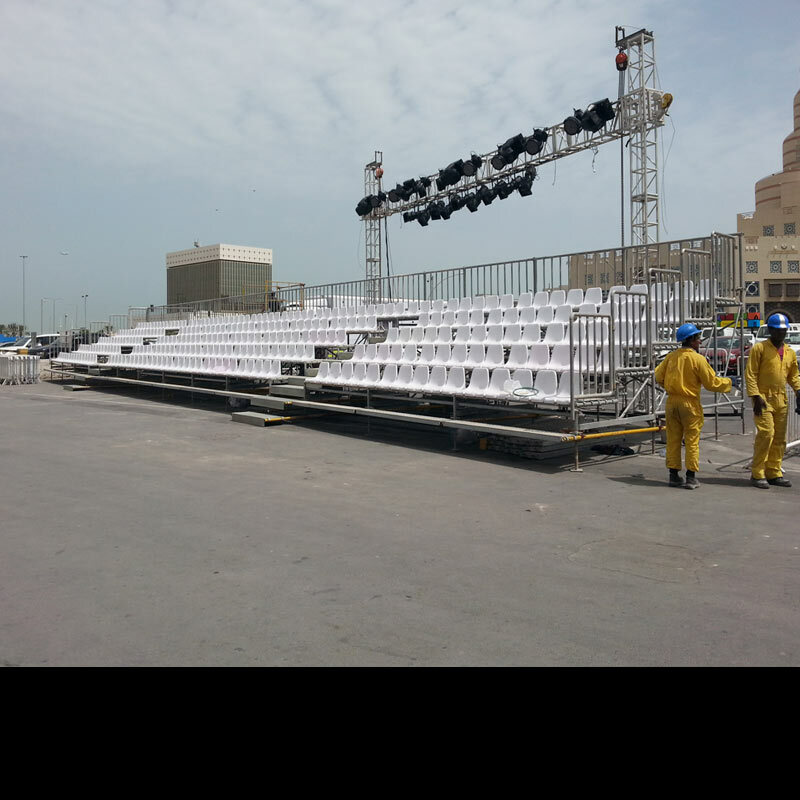 PROJECT: For several exhibitions, shows and celebrations in Doha, our company built a galvanized tribune. 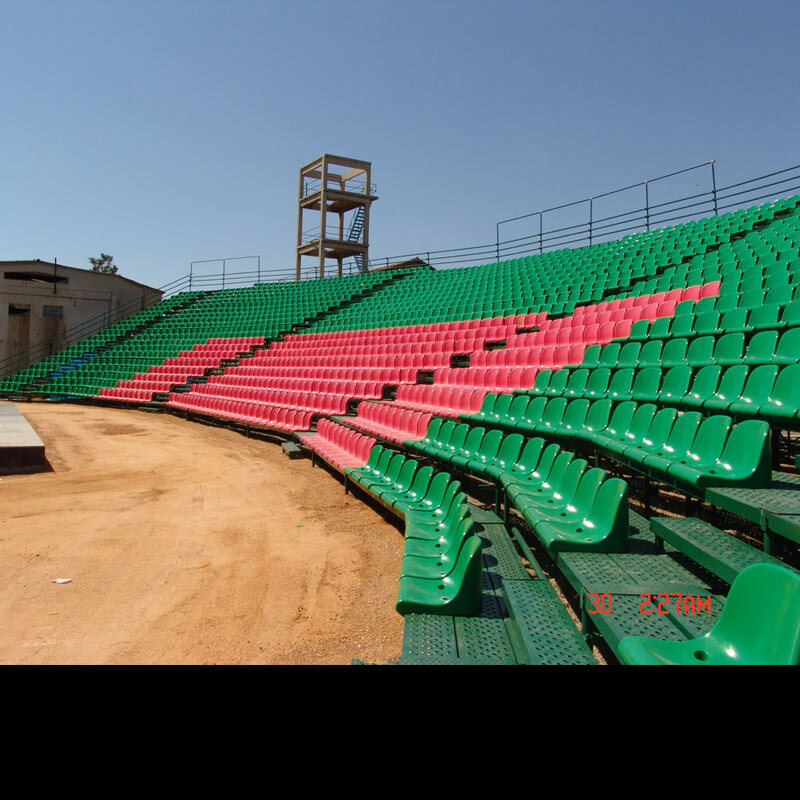 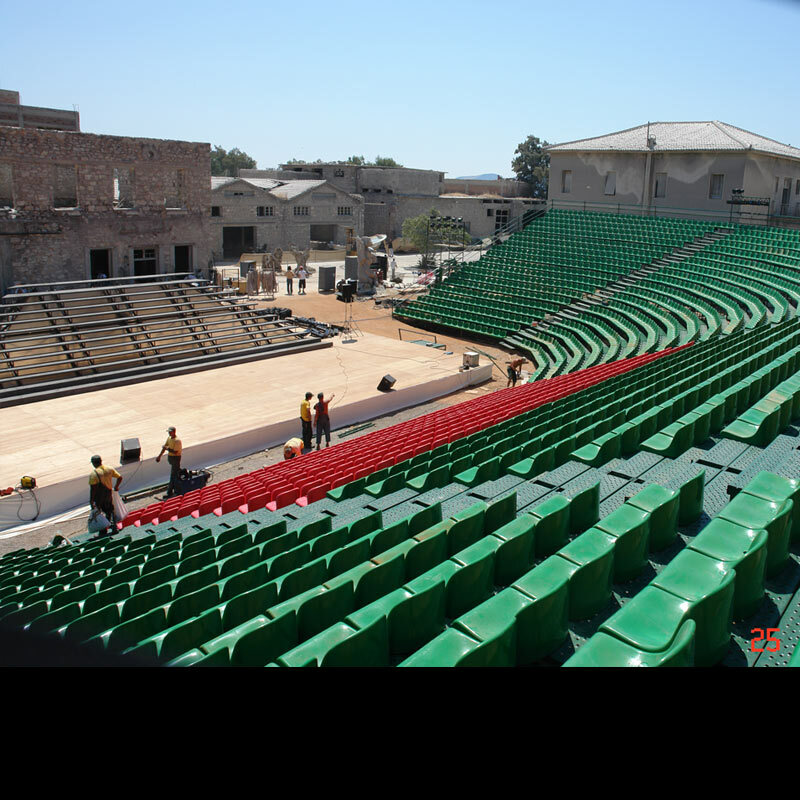 PROJECT: Settling, hiring and disassembling of a metallic tribune with plastic seats and stage of 500m2 for the Festival of Elefsina. 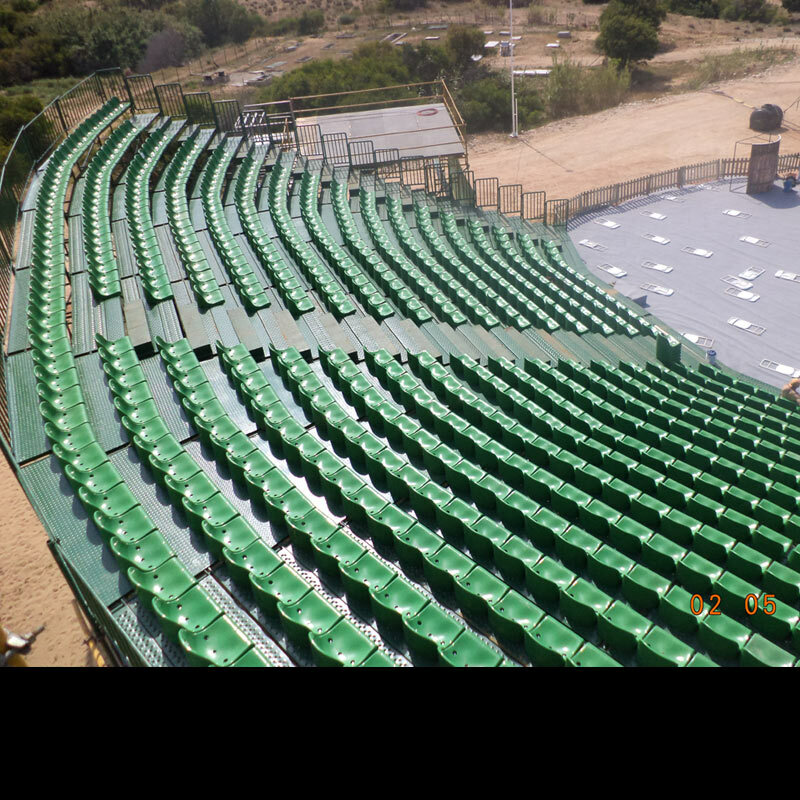 PROJECT: Settling, hiring and disassembling of a metallic tribune with plastic seats for the Festival of Elefsina. 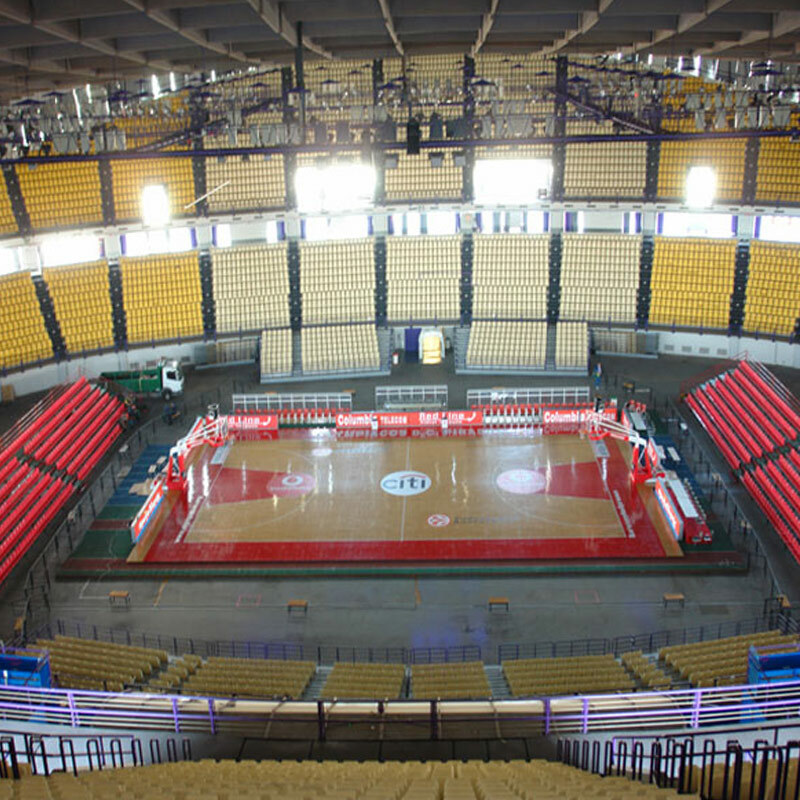 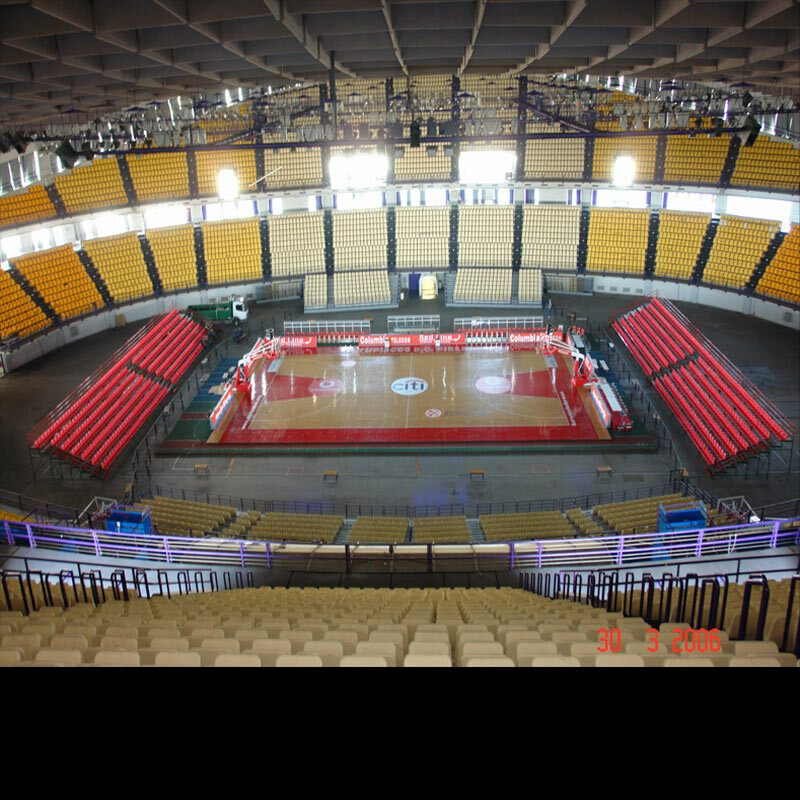 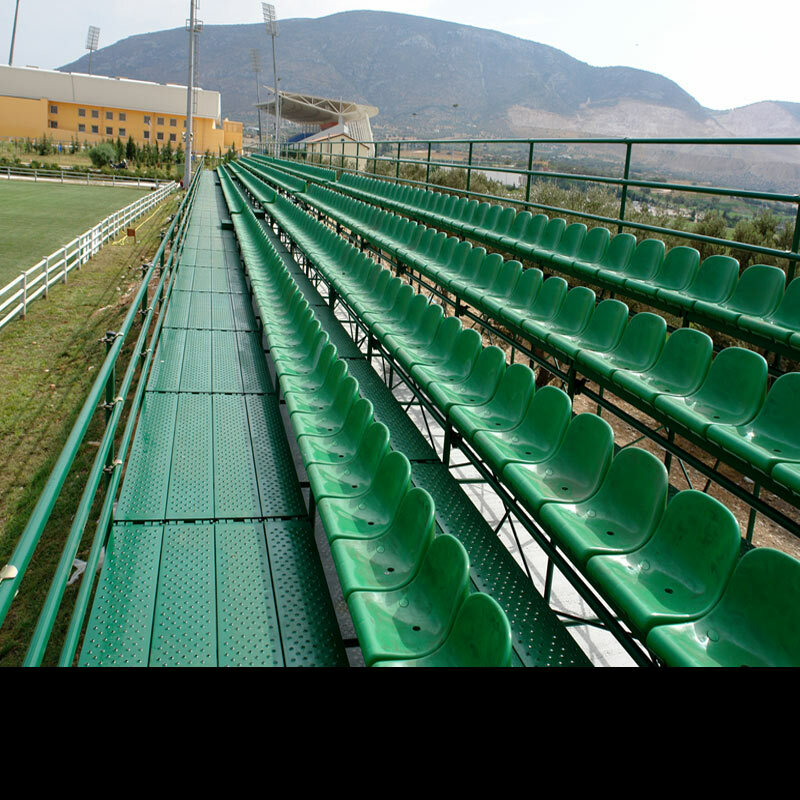 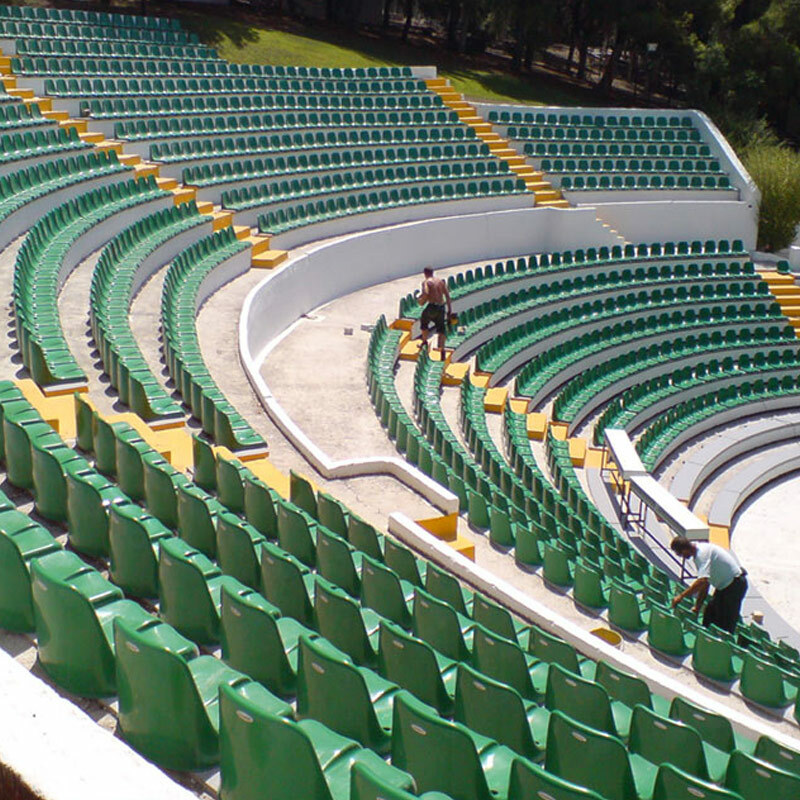 PROJECT: Settling, hiring and disassembling of two straight metallic tribunes with plastic seats inside the Peace and Friendship Stadium. 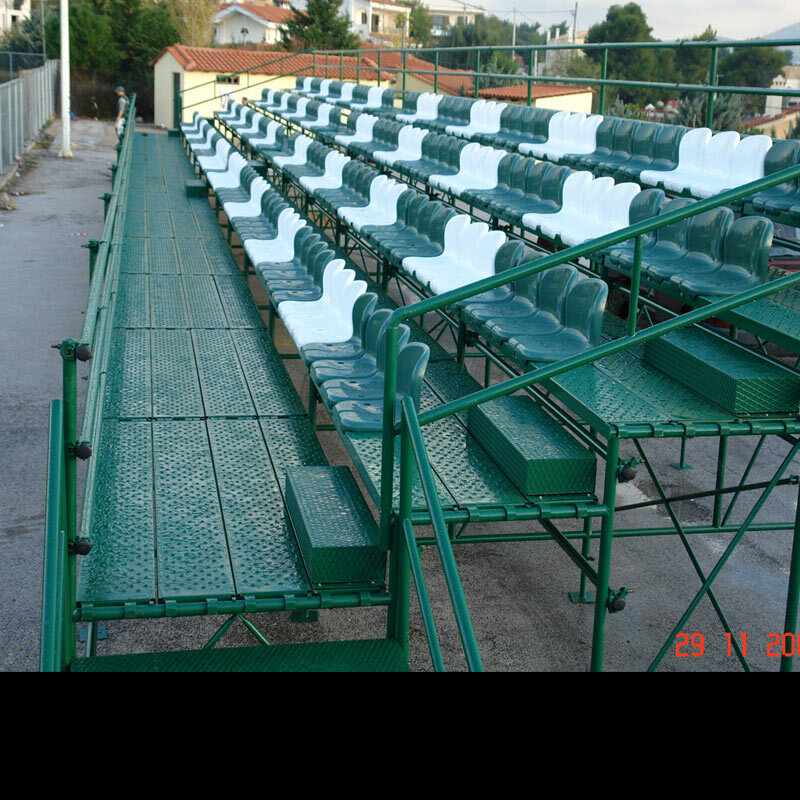 PROJECT: Settling, hiring and disassembling of two metallic tribunes with plastic seats inside the Peace and Friendship Stadium. 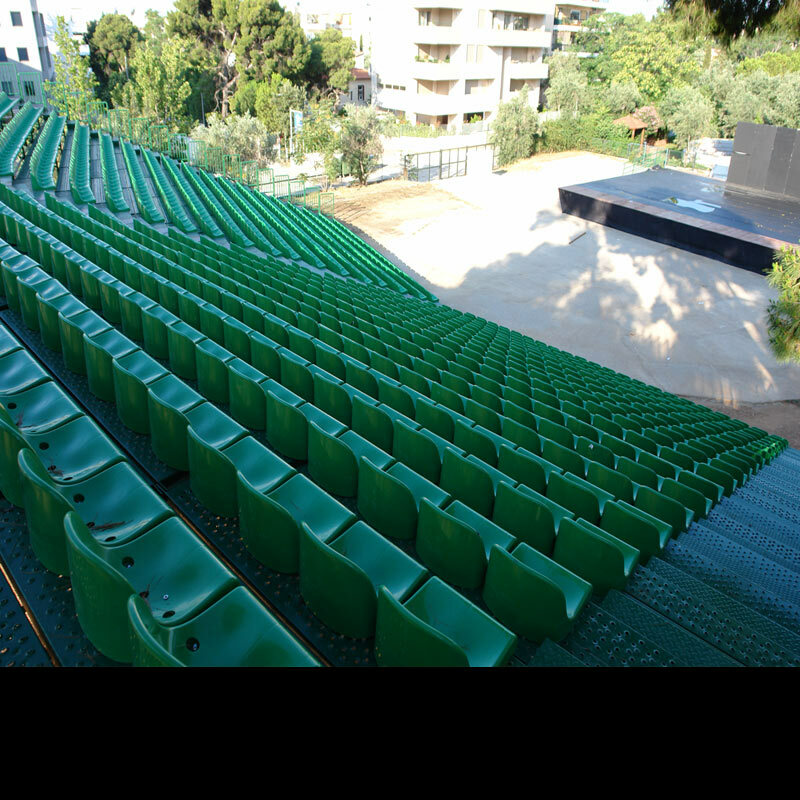 PROJECT: Settling, hiring and disassembling of a metallic tribune with plastic seats and stage of 150m2 at the Amaliio Theatre of Marousi. 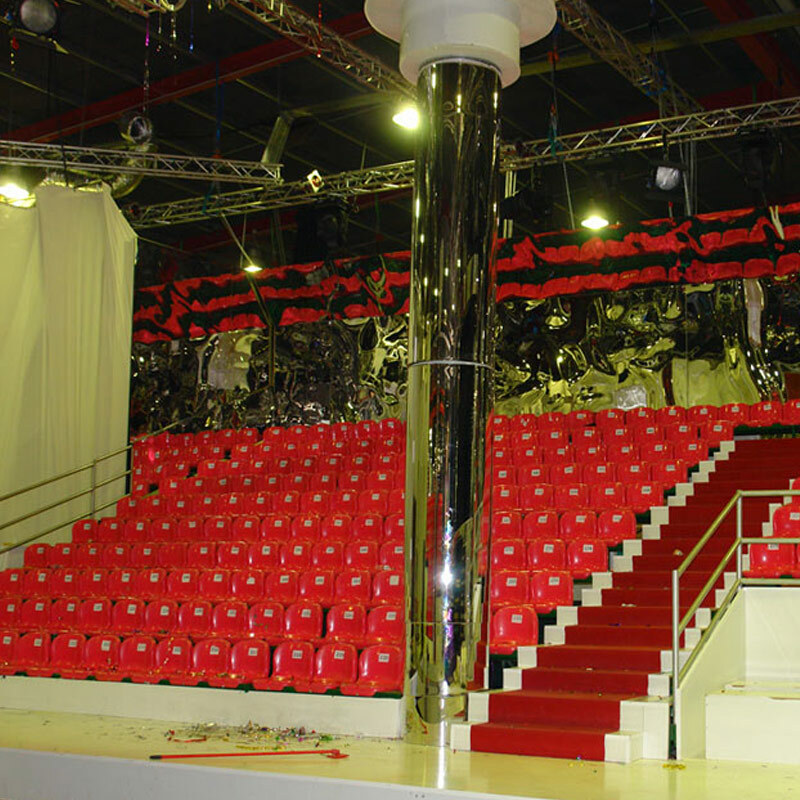 PROJECT: Settling, hiring and disassembling of a metallic tribune with plastic seats metal decks for sound, cameras and lights for a Russian Production in Killini. 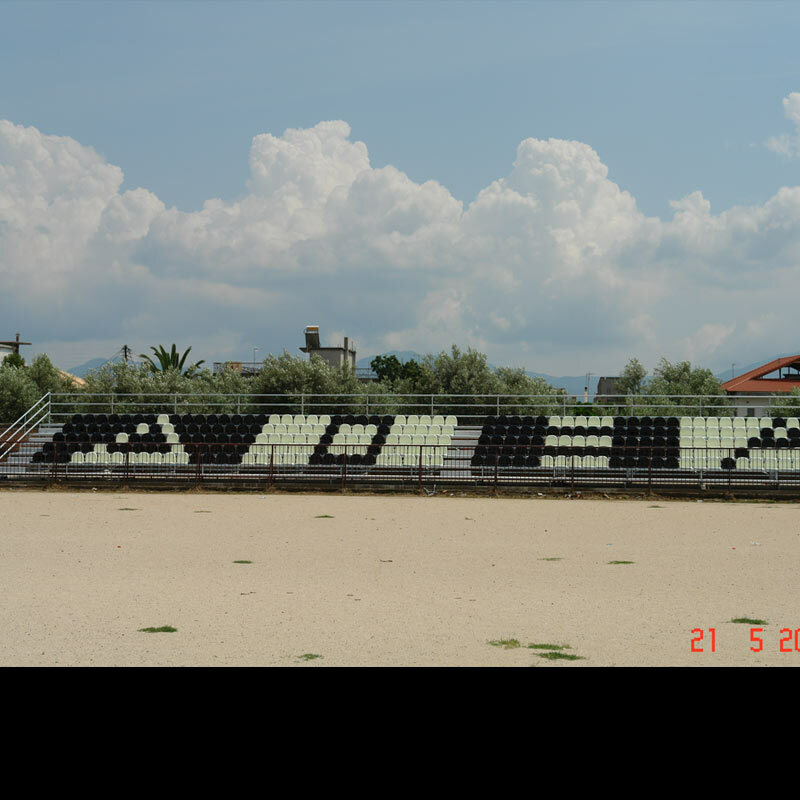 PROJECT: Settling, hiring and disassembling of a metallic tribune with plastic at Agia Paraskevi. 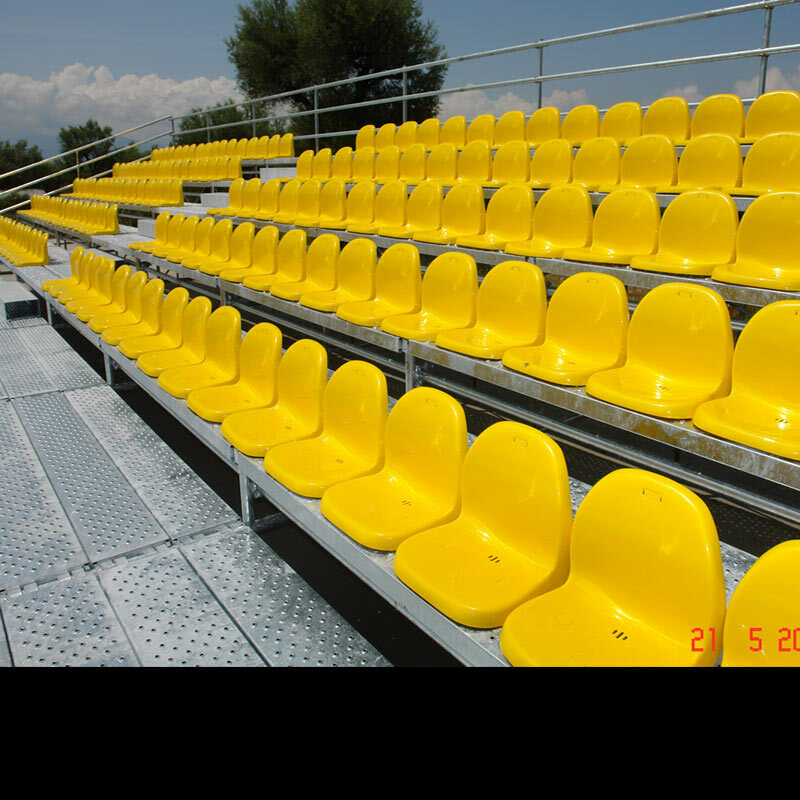 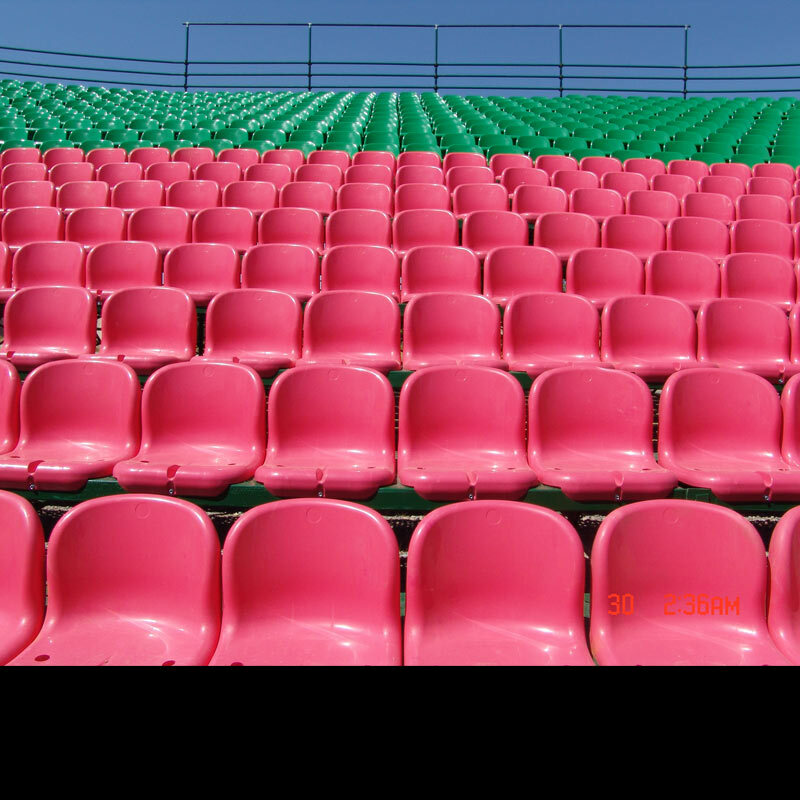 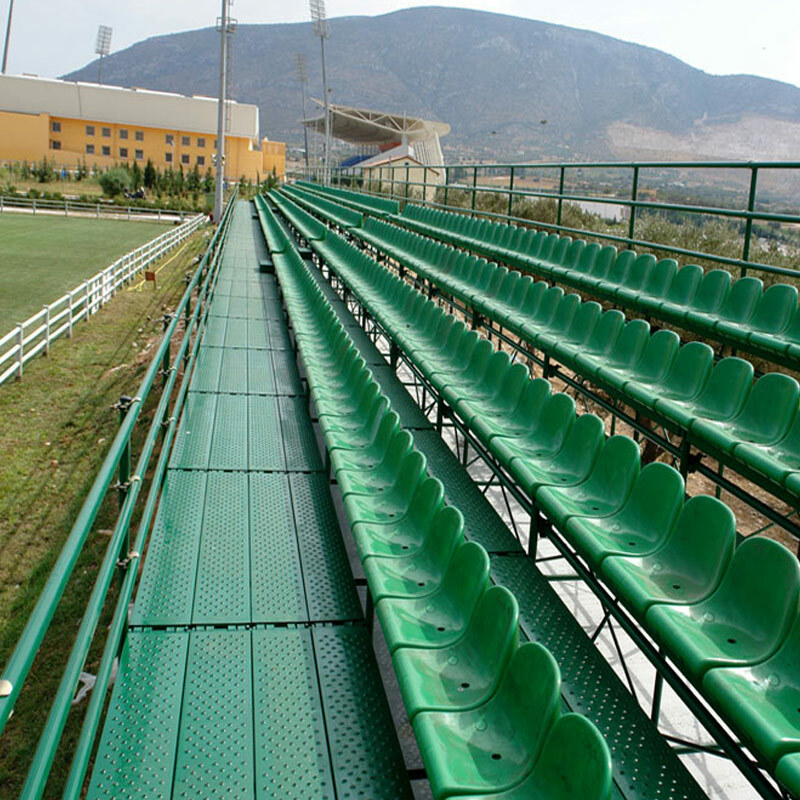 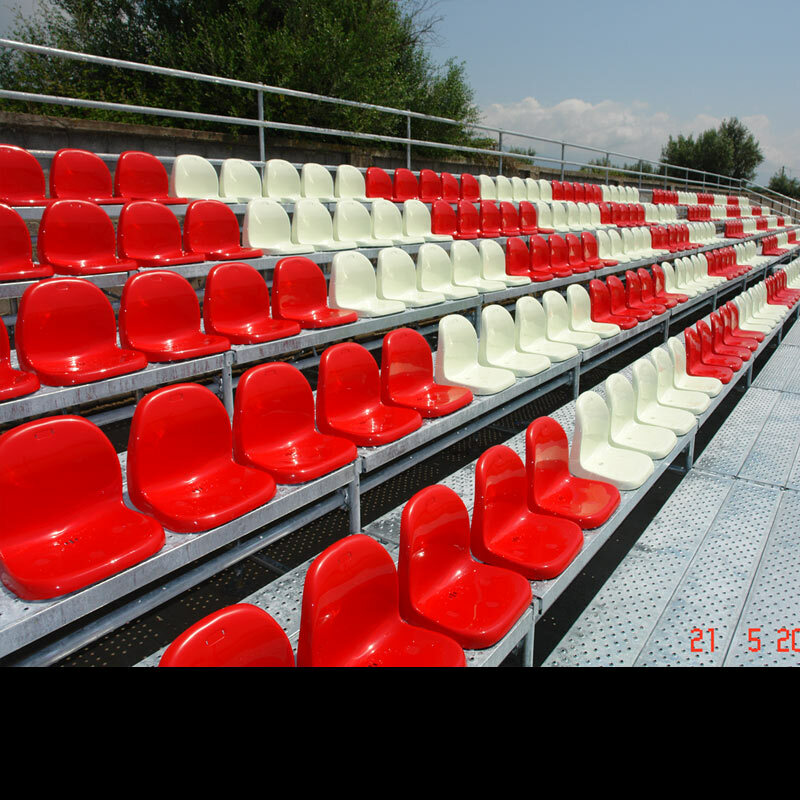 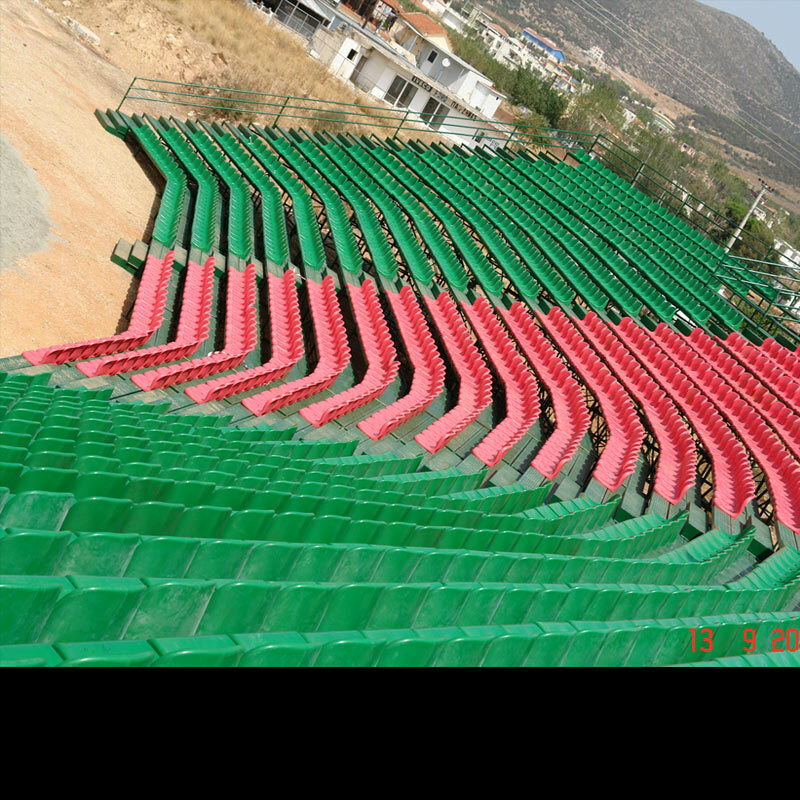 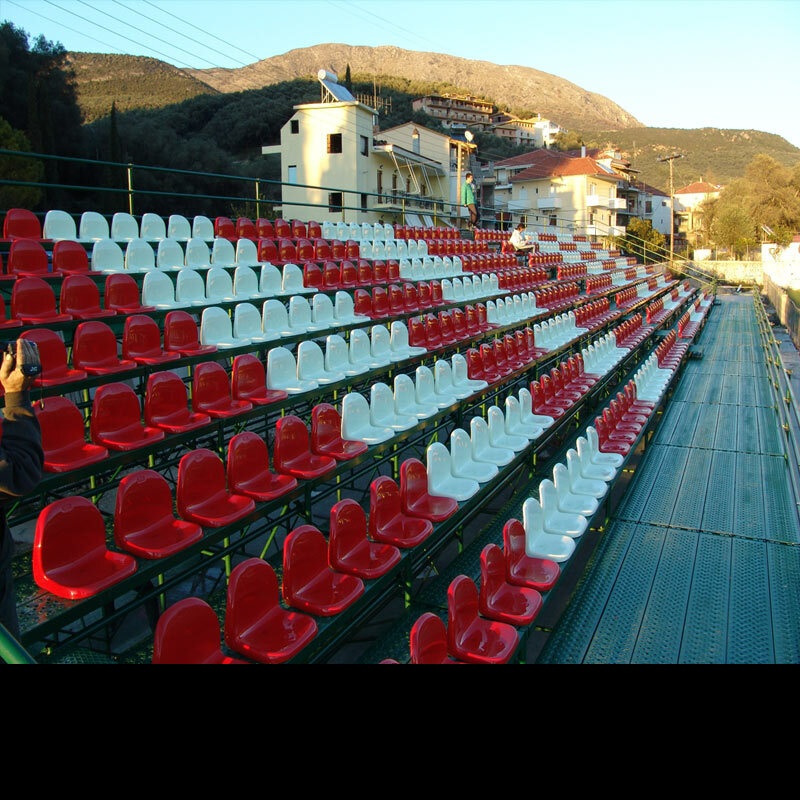 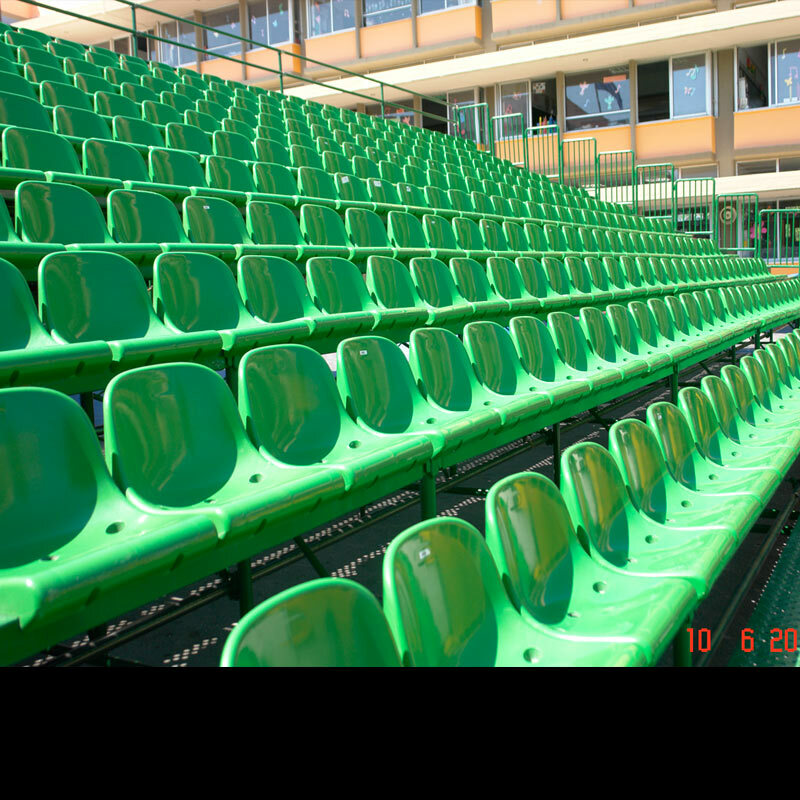 PROJECT: Settling, hiring and disassembling of a metallic tribune with plastic seats at Aigira of Achaia County. 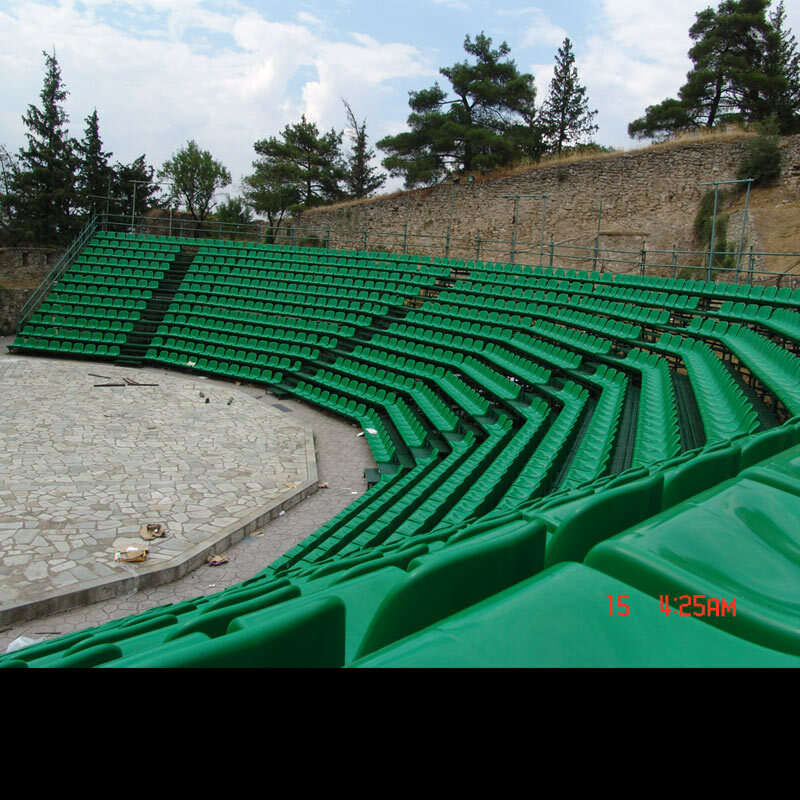 PROJECT: Settling, hiring and disassembling of a metallic tribune with wooden seats at Platonos Academy. 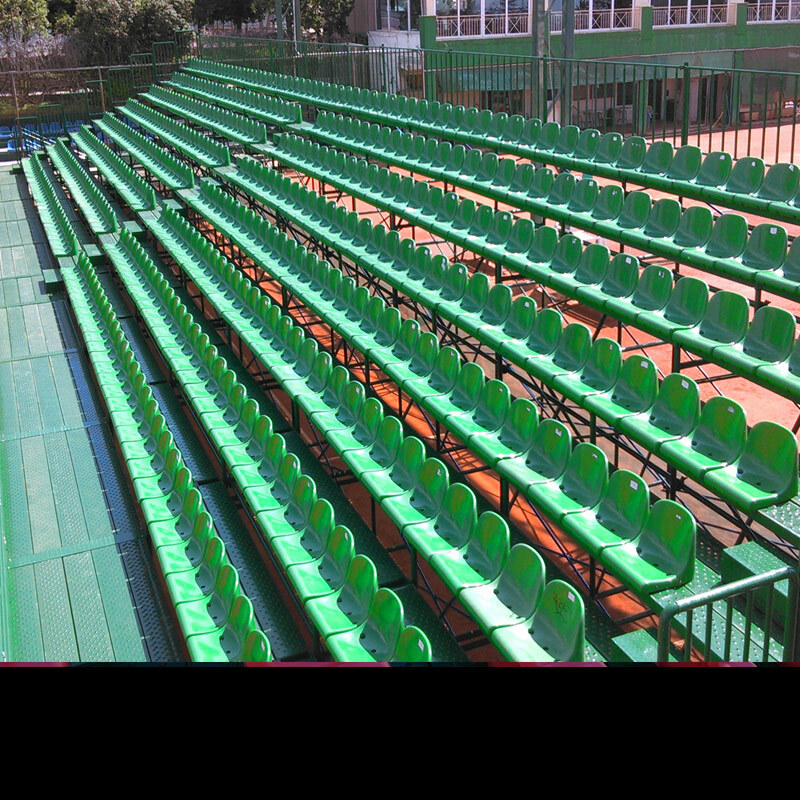 PROJECT: Placement of a metallic tribune with plastic seats at the Arsakio School of Anixi. 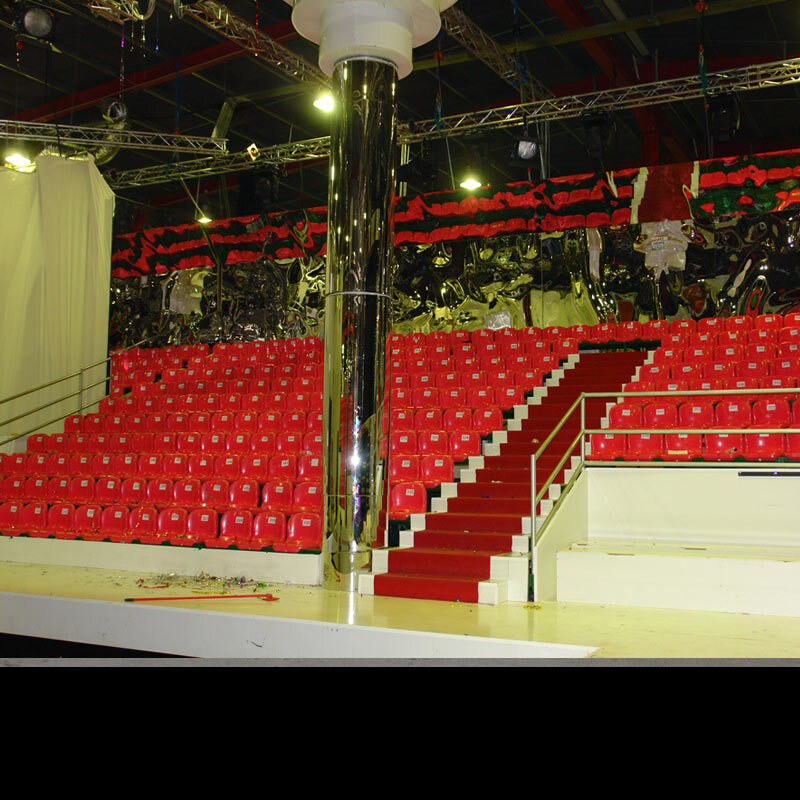 PROJECT: Settling, hiring and disassembling of a metallic tribune with plastic for the Athens Fashion Week Show, at Technopolis in Gazi. 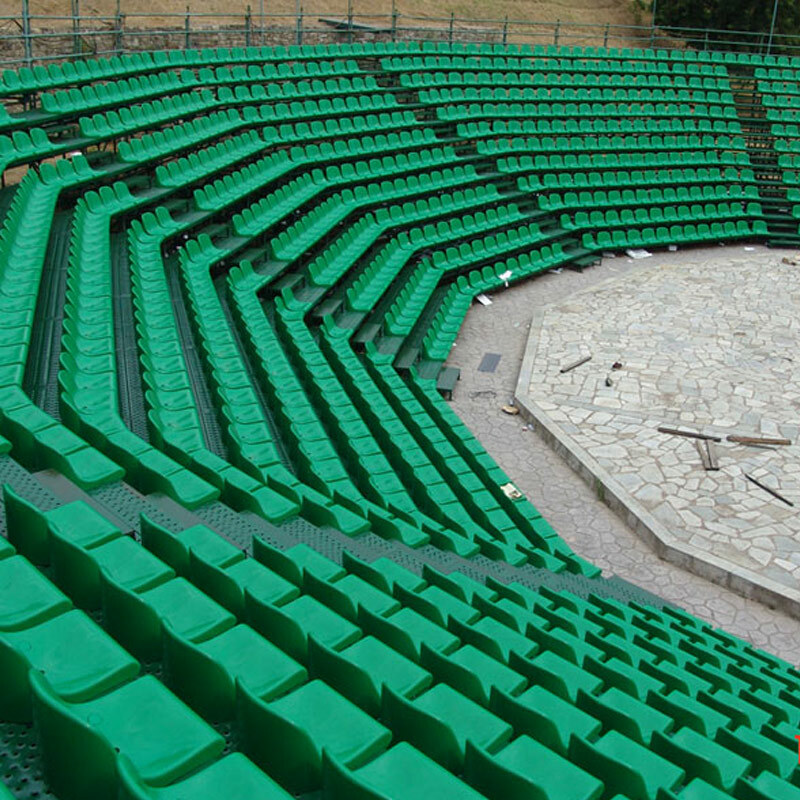 PROJECT: Settling, hiring and disassembling of a metallic tribune with plastic seats for the Athens Flying Week 2014 Show at Tatoi. 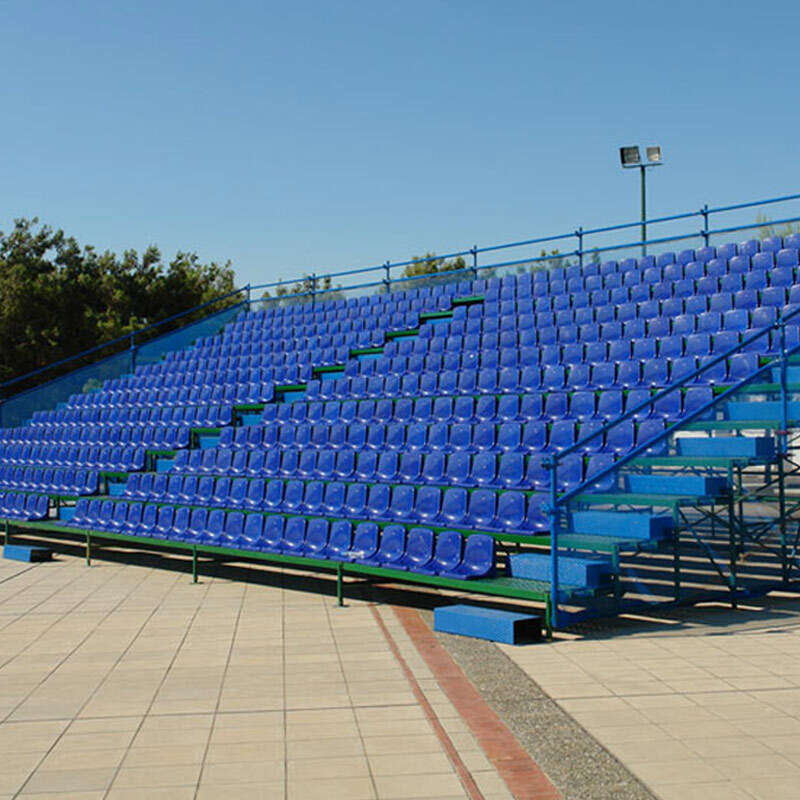 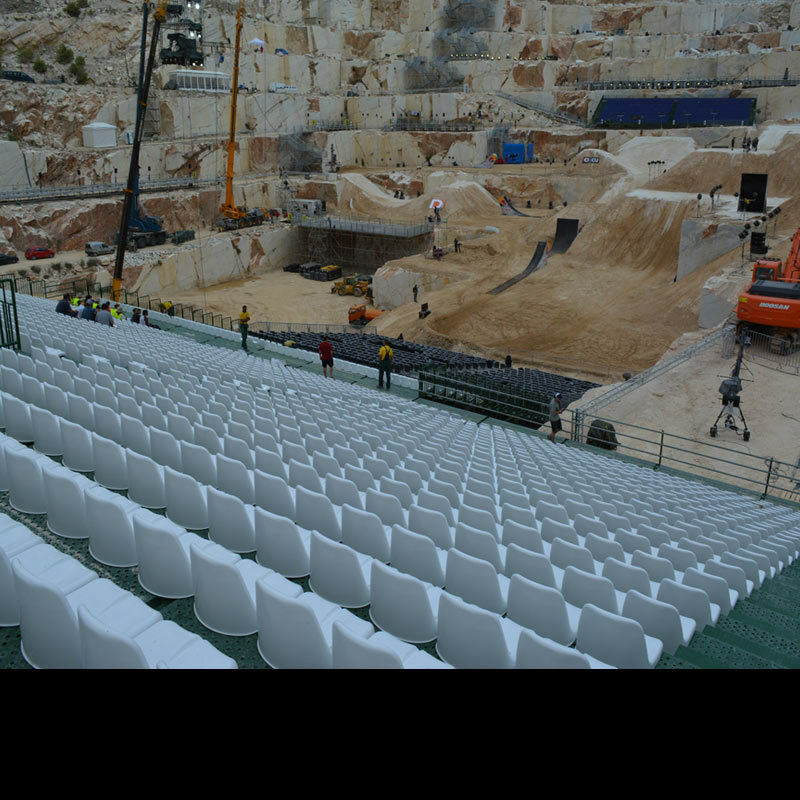 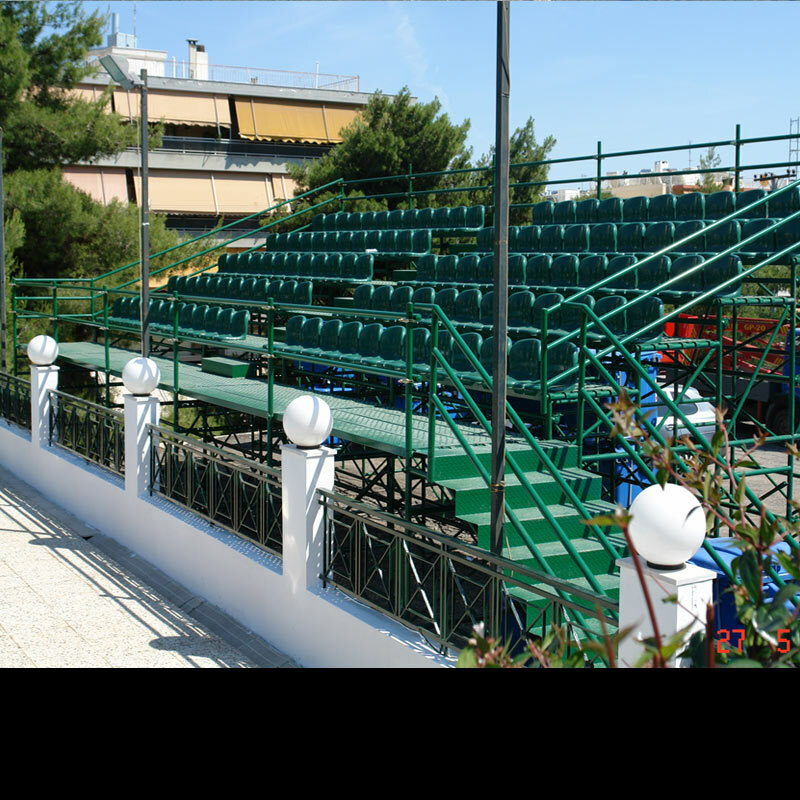 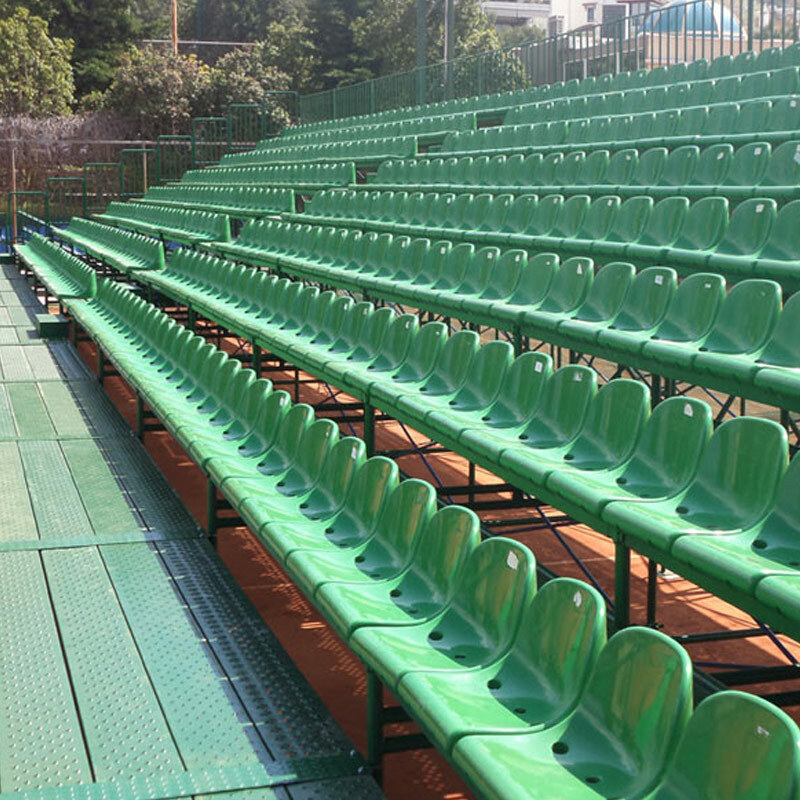 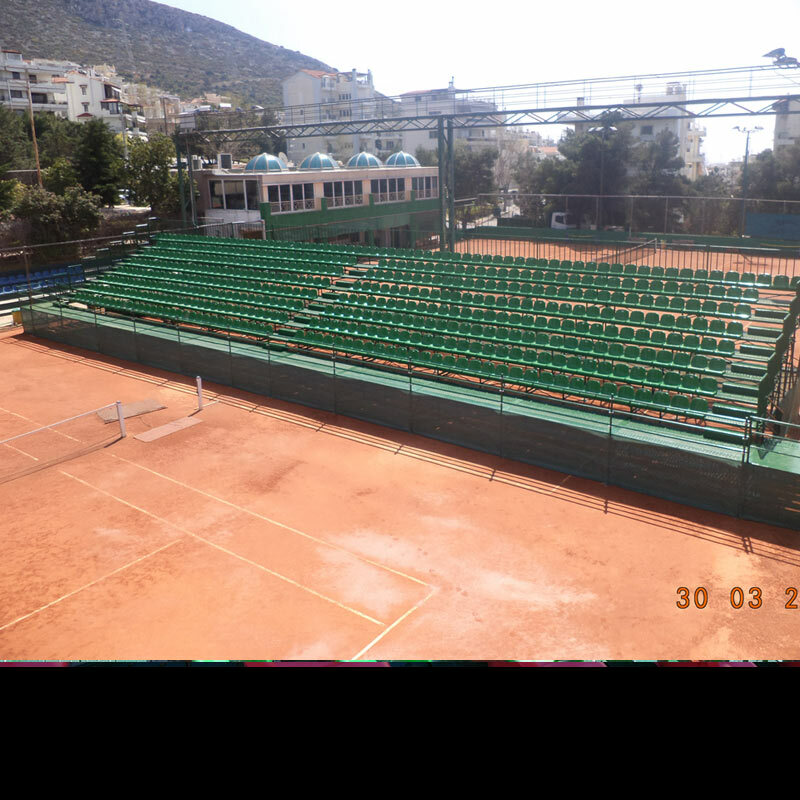 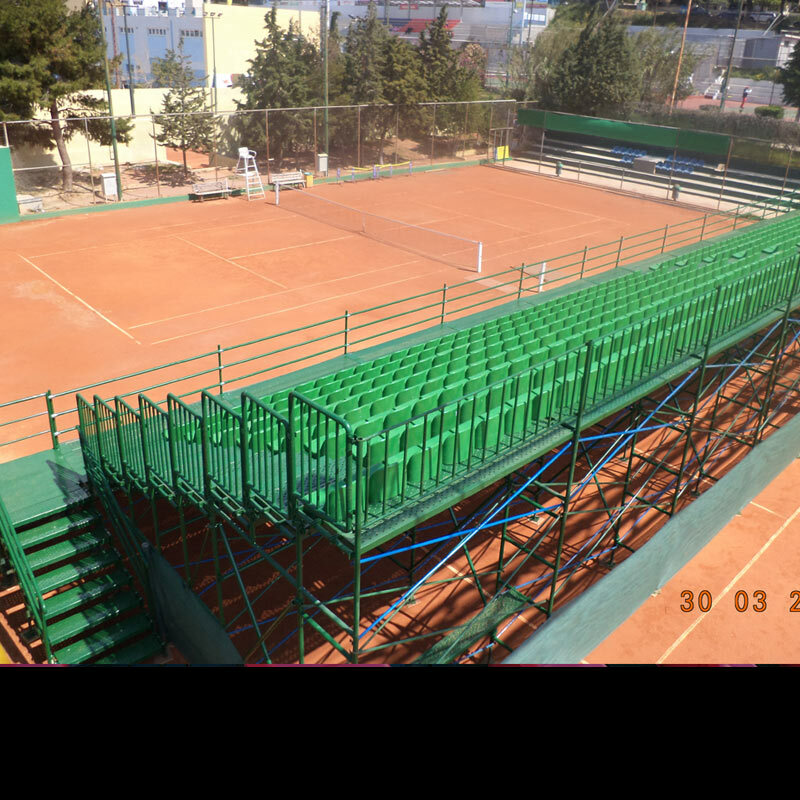 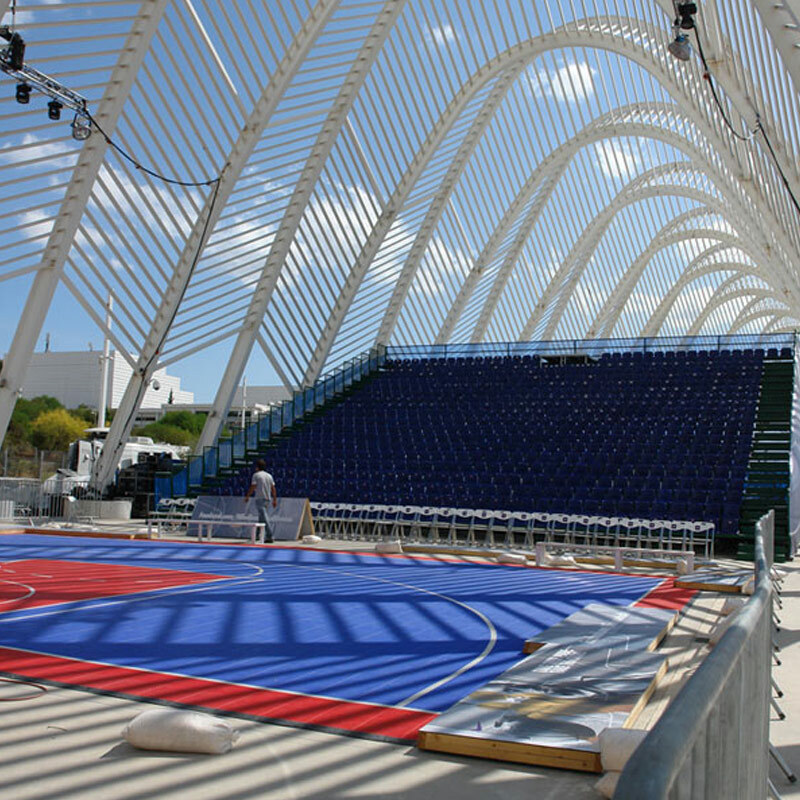 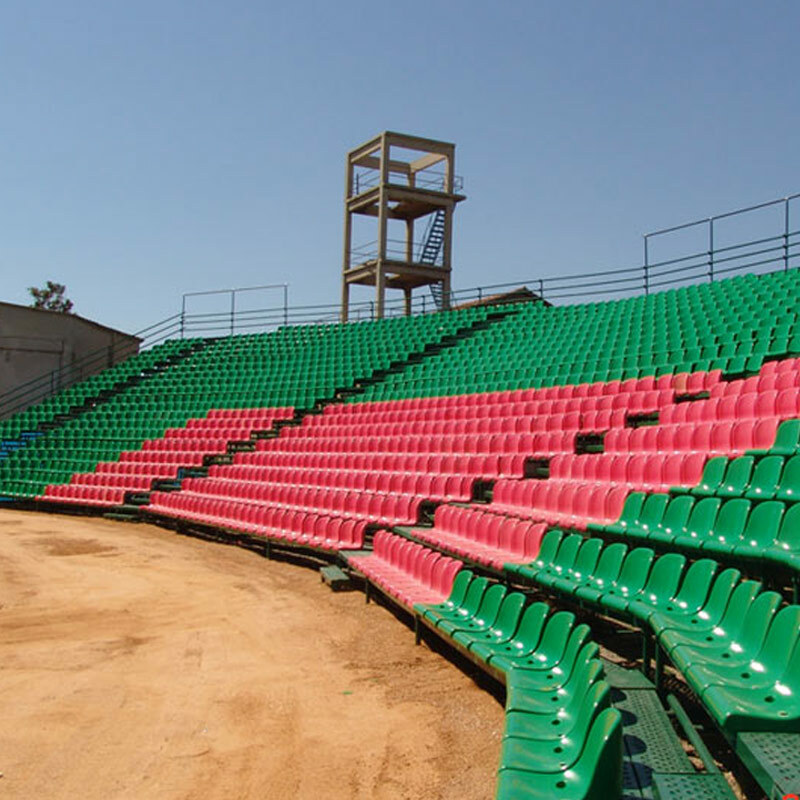 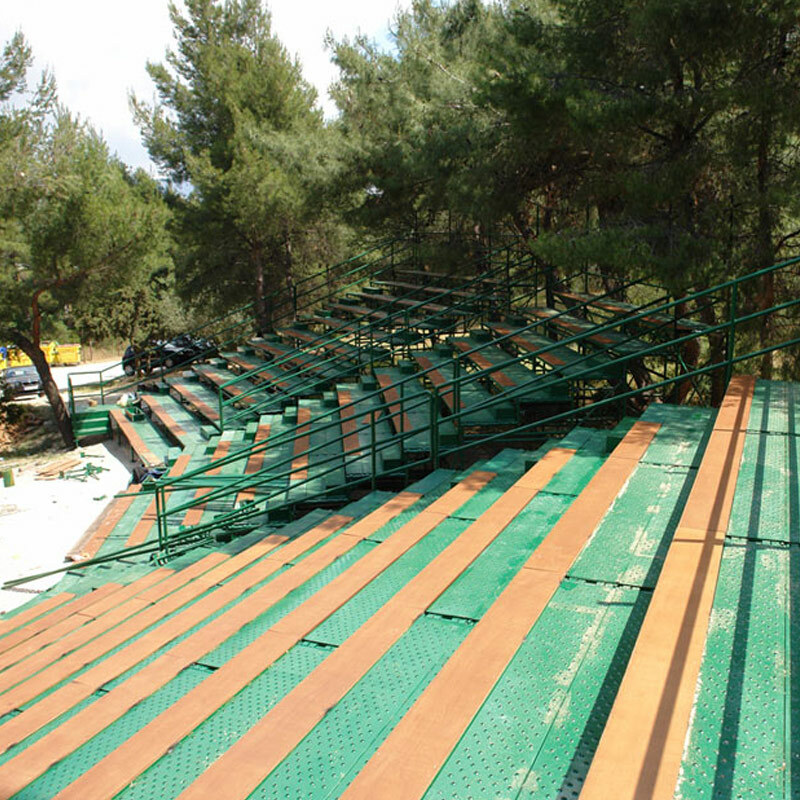 PROJECT: Settling, hiring and disassembling of a metallic tribune with plastic seats for the Davis Cup 2014 Tennis Matches between Greece and Bulgary at the Tennis Sports Center of Ilioupoli. 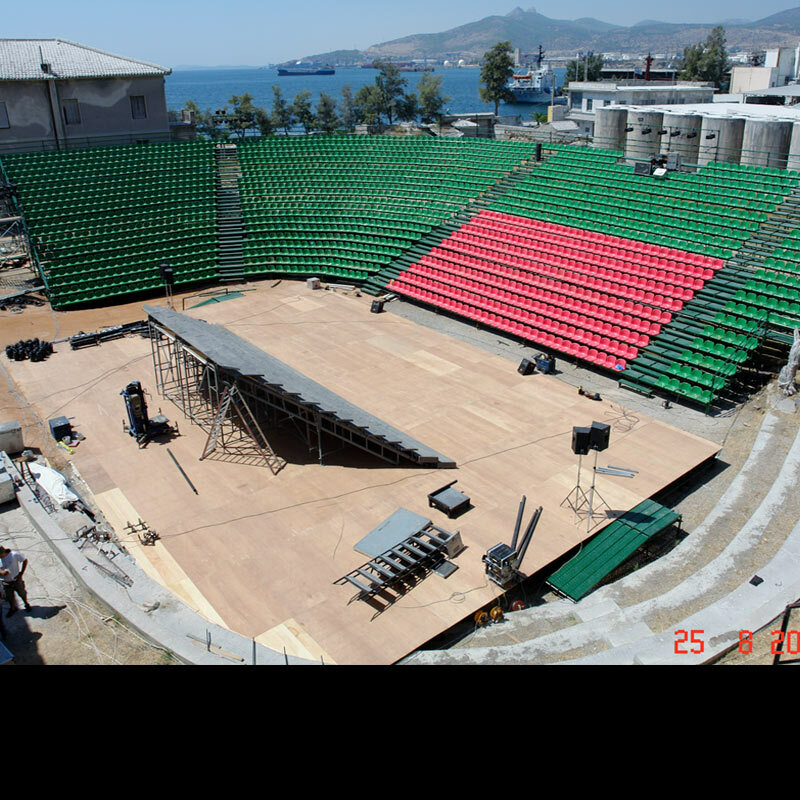 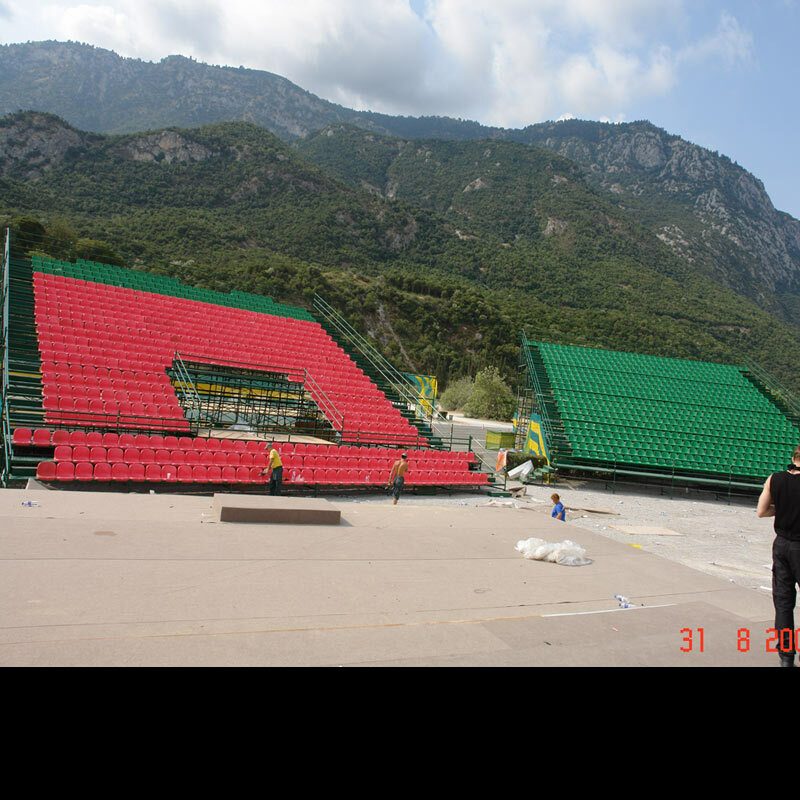 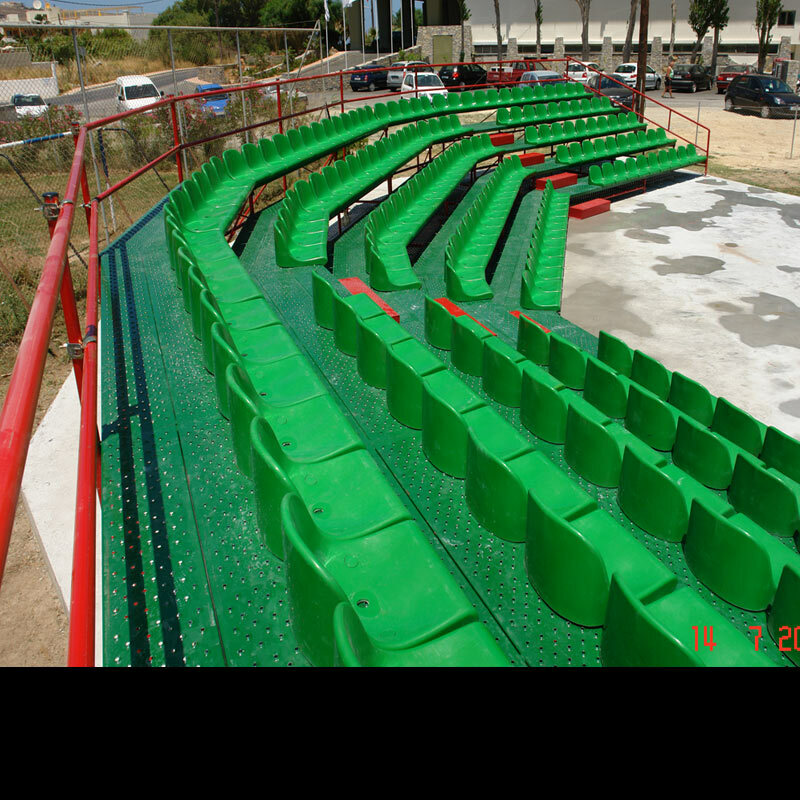 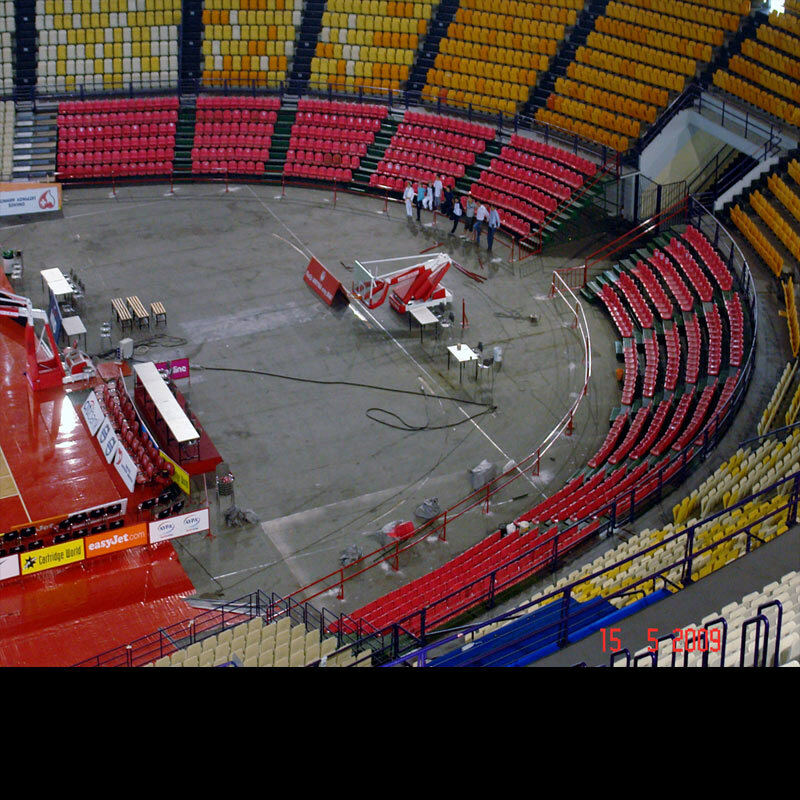 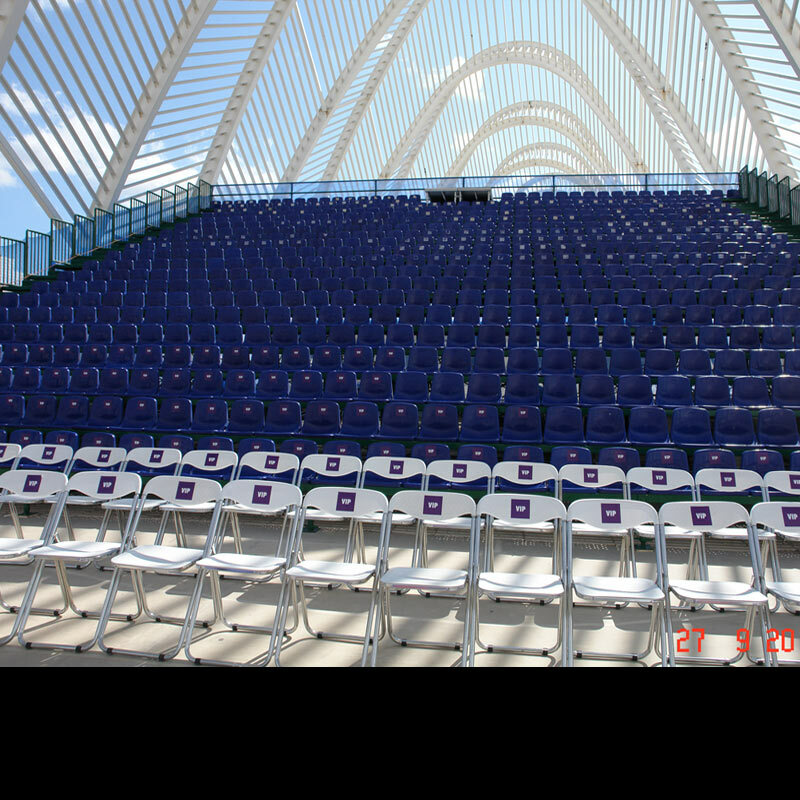 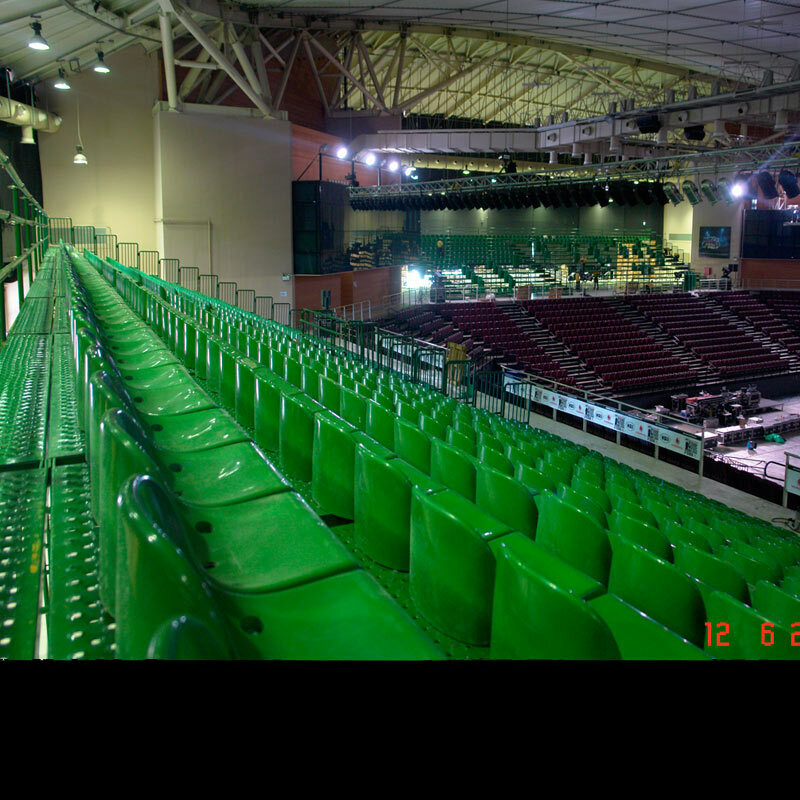 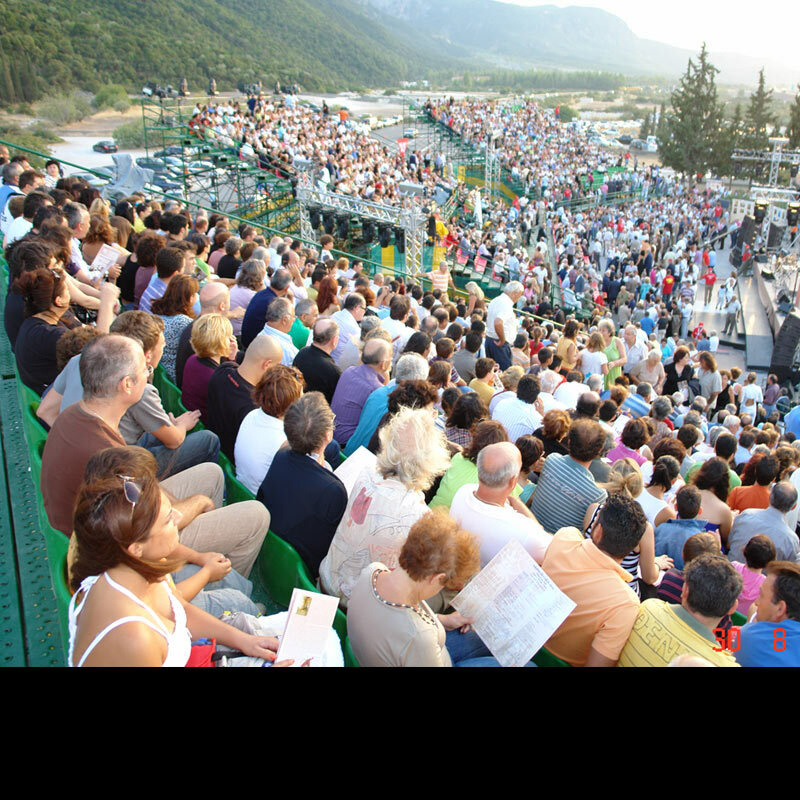 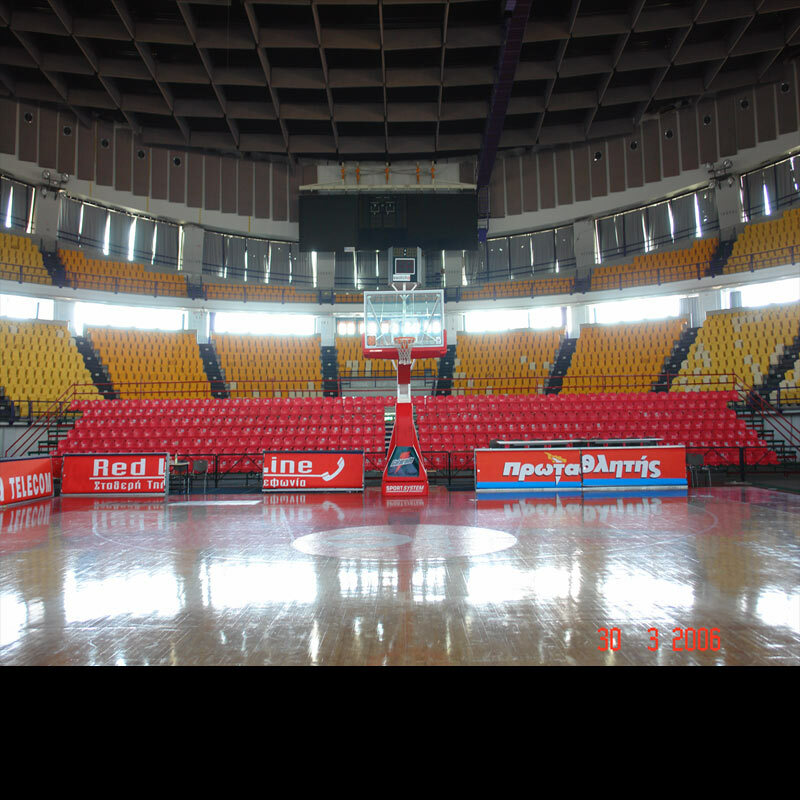 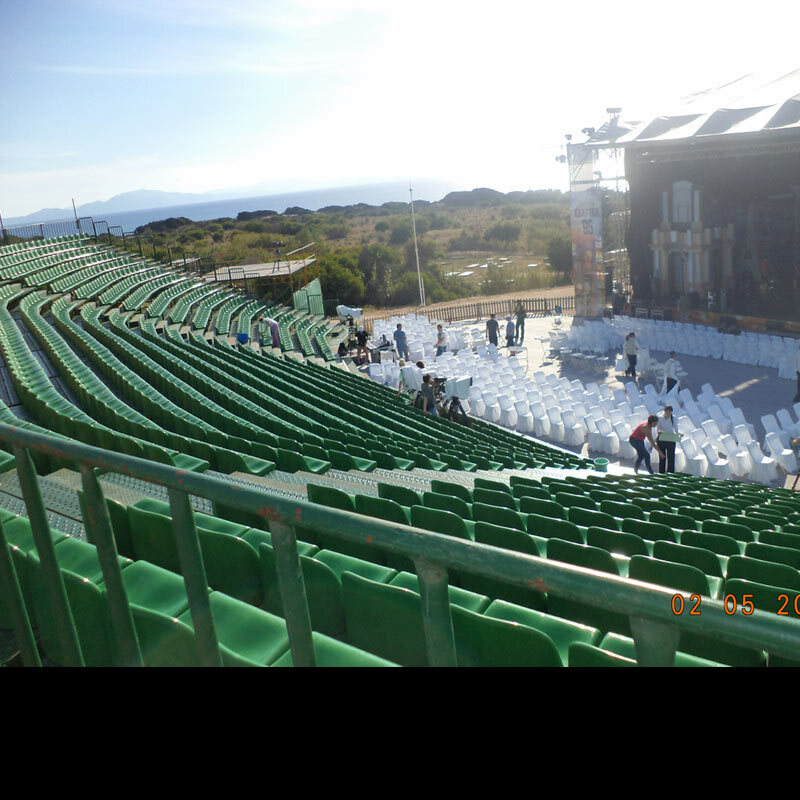 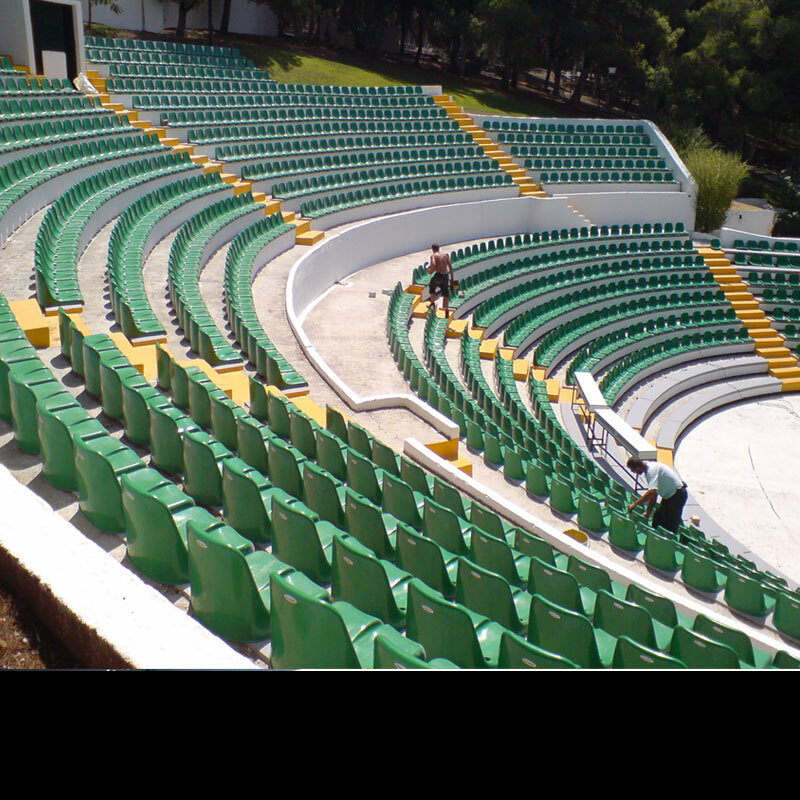 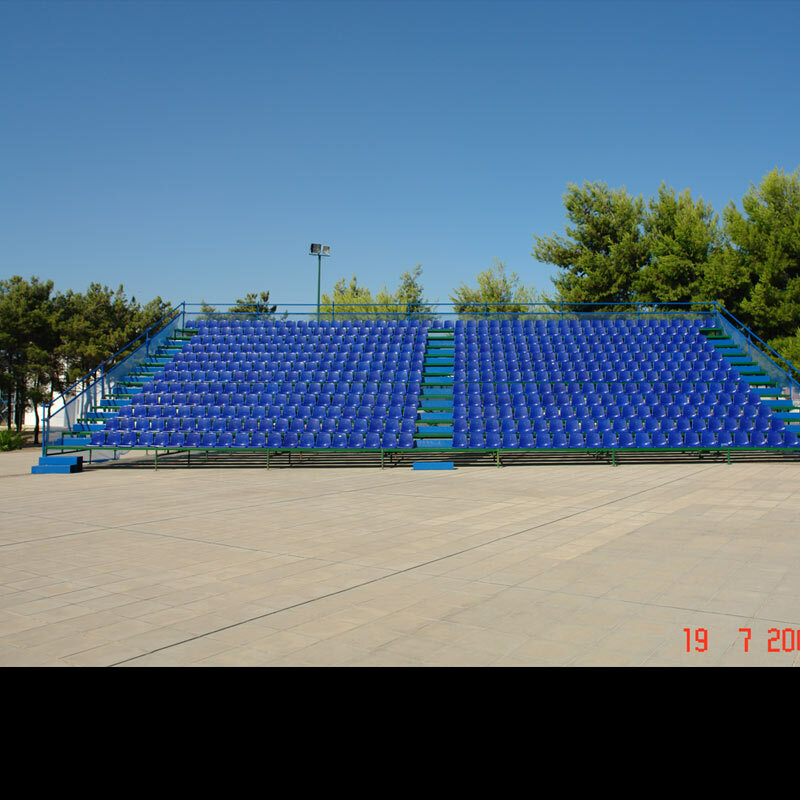 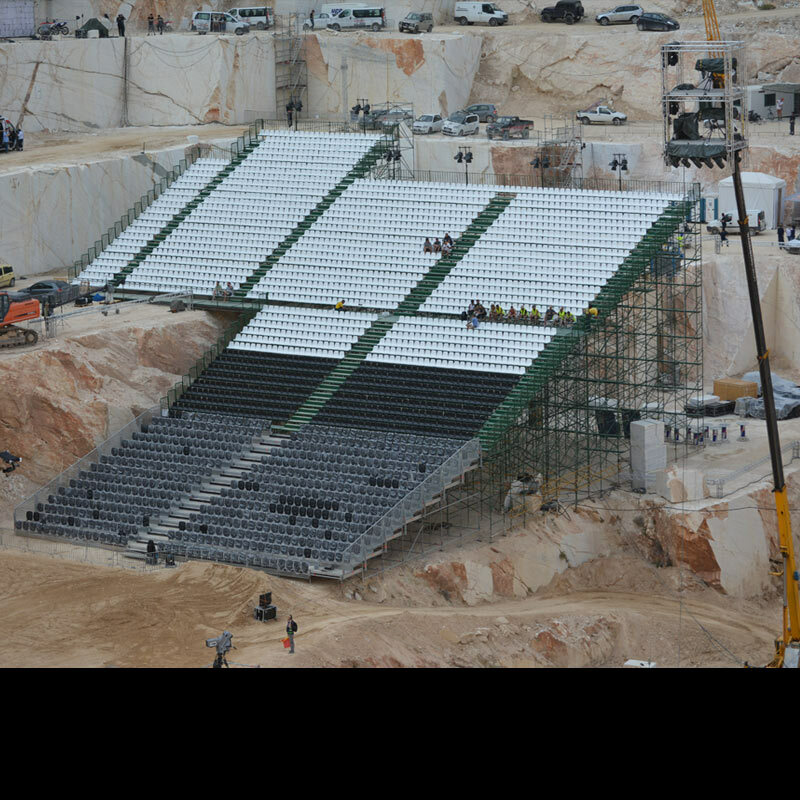 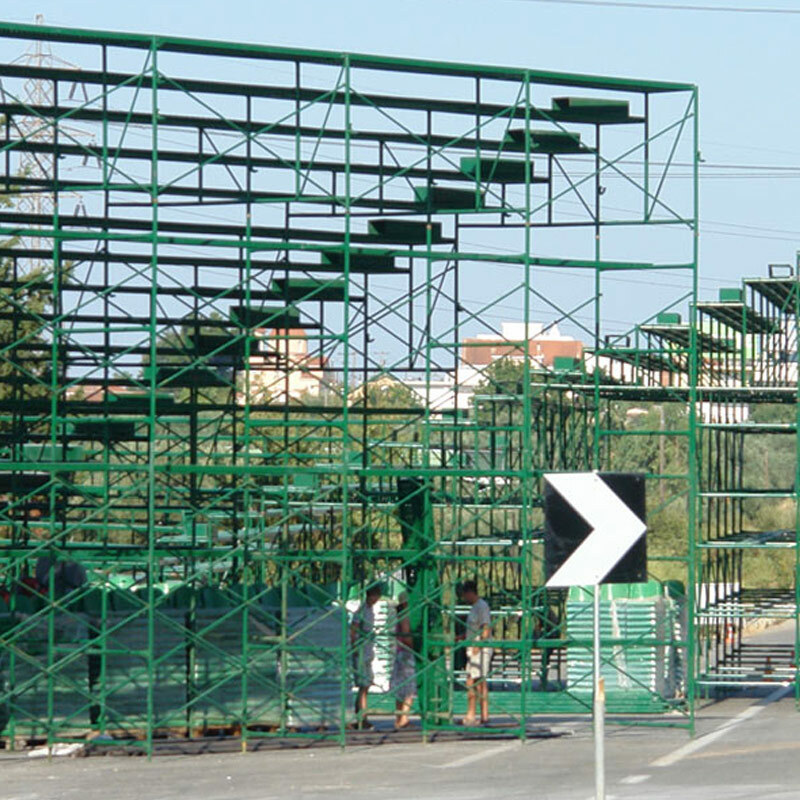 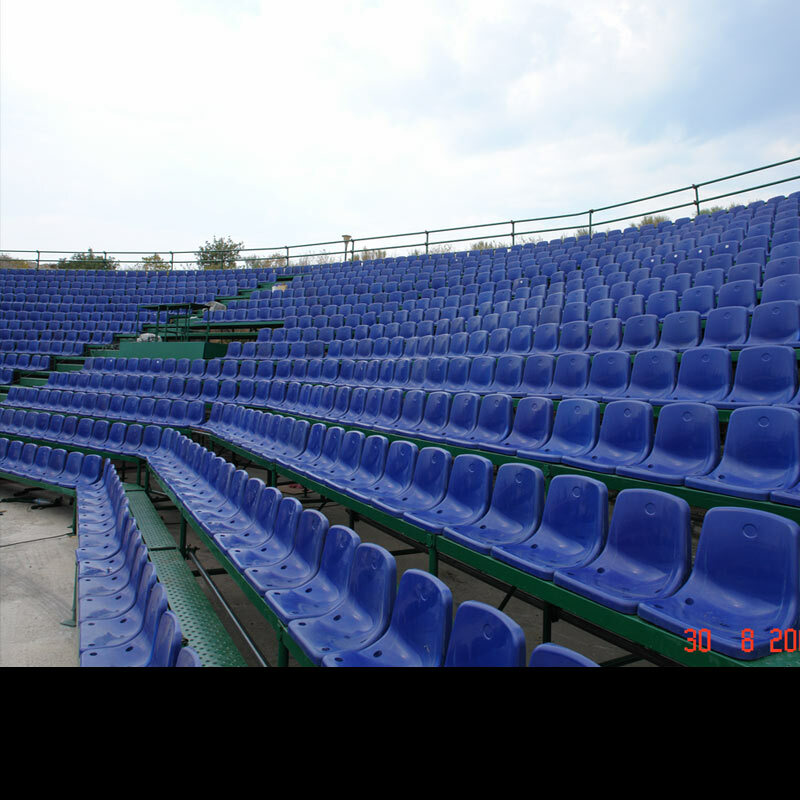 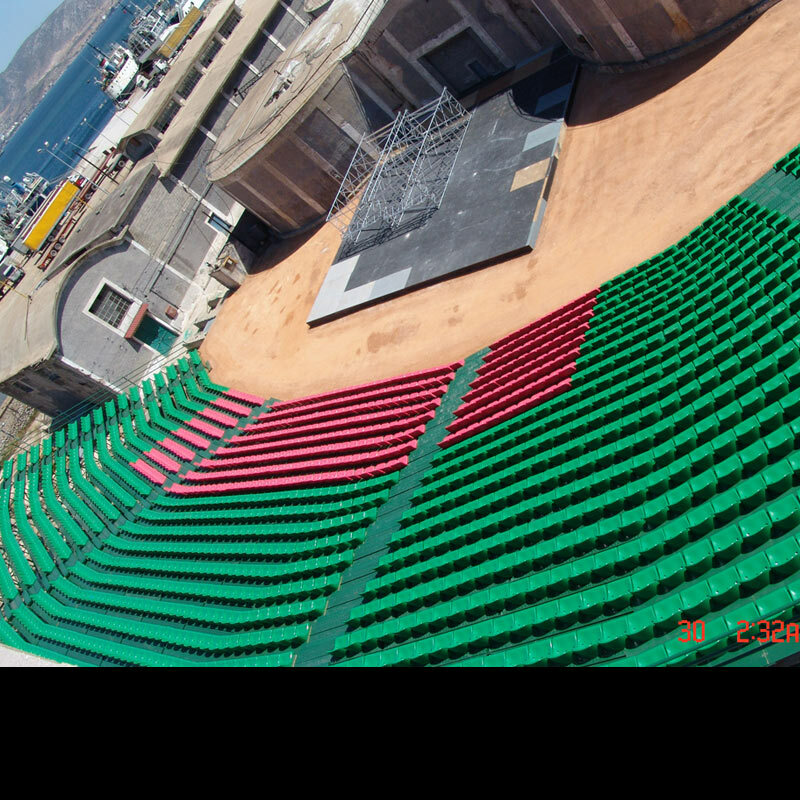 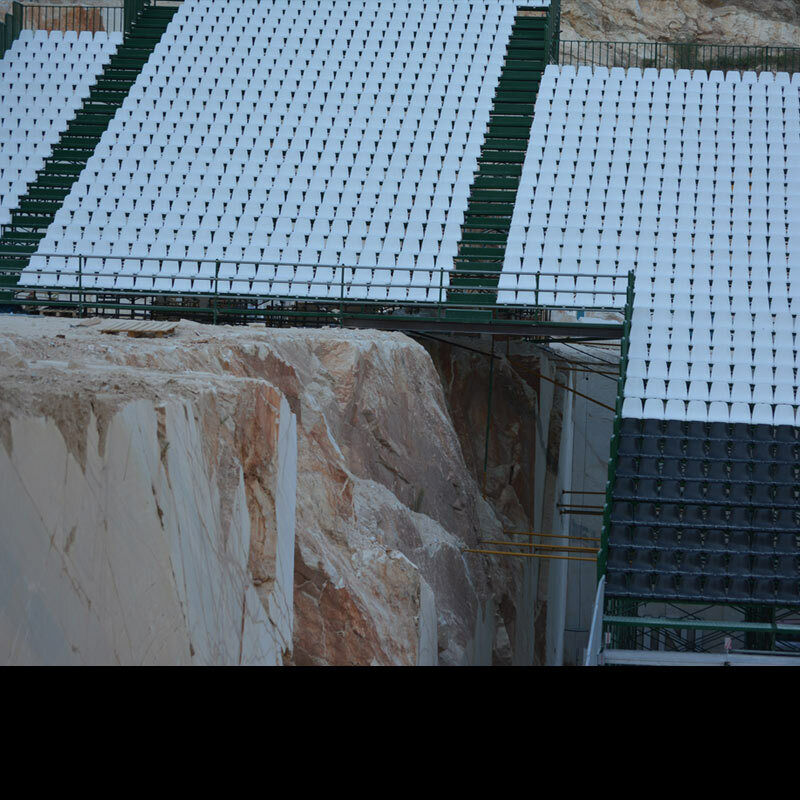 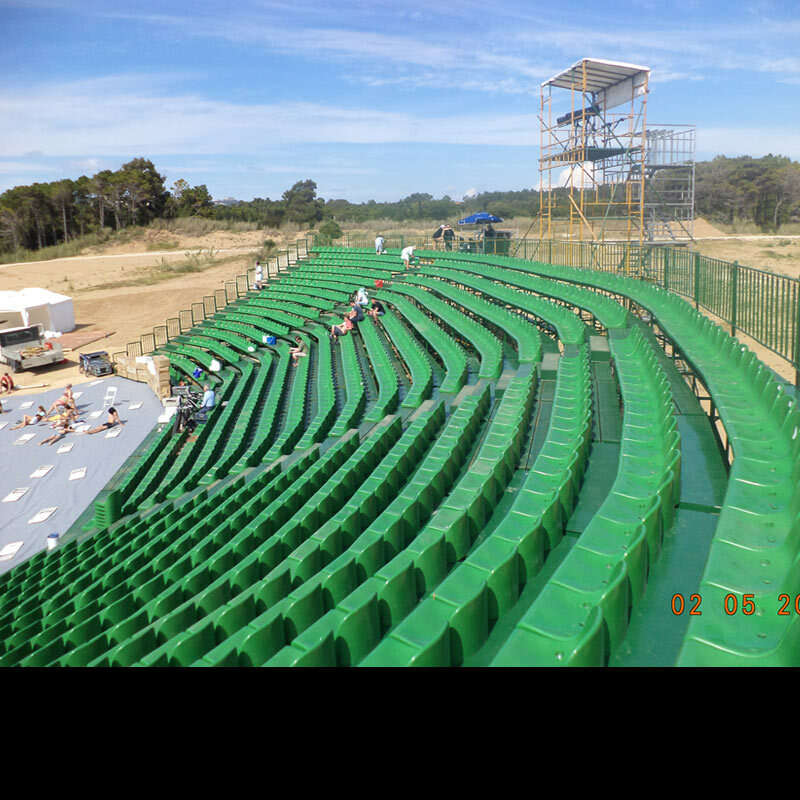 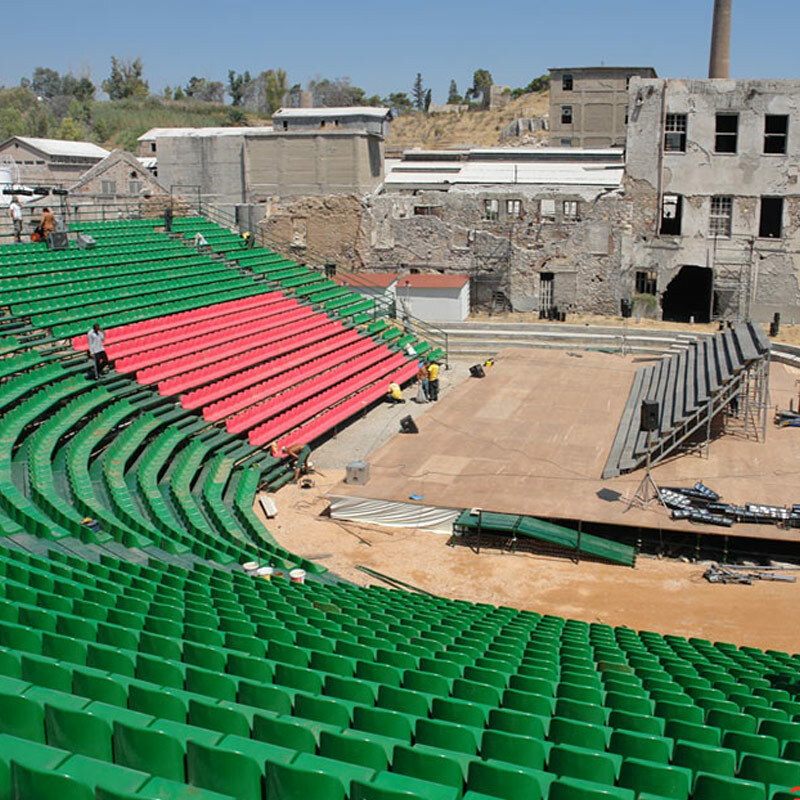 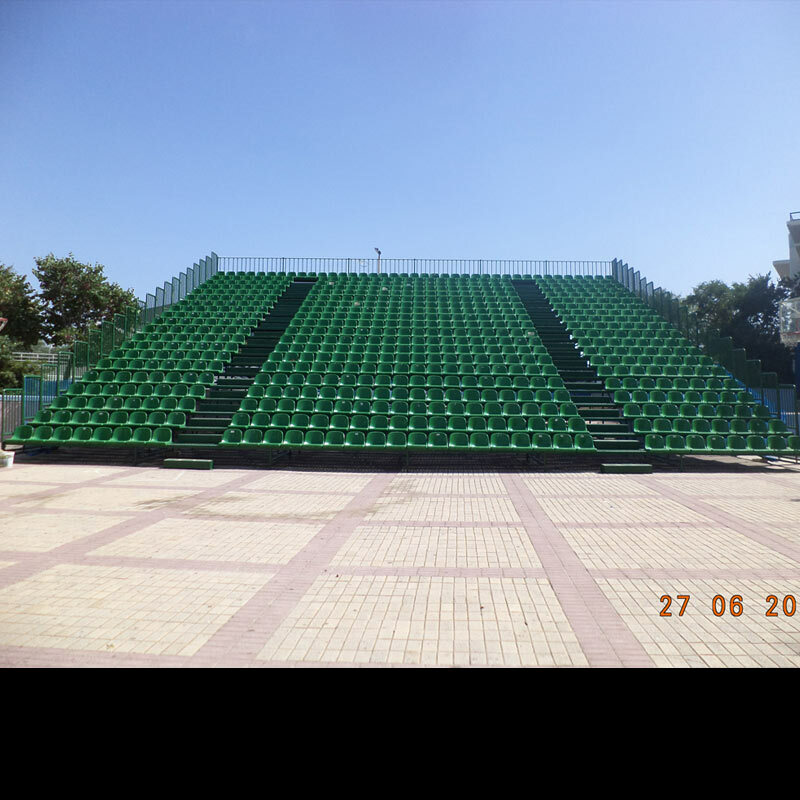 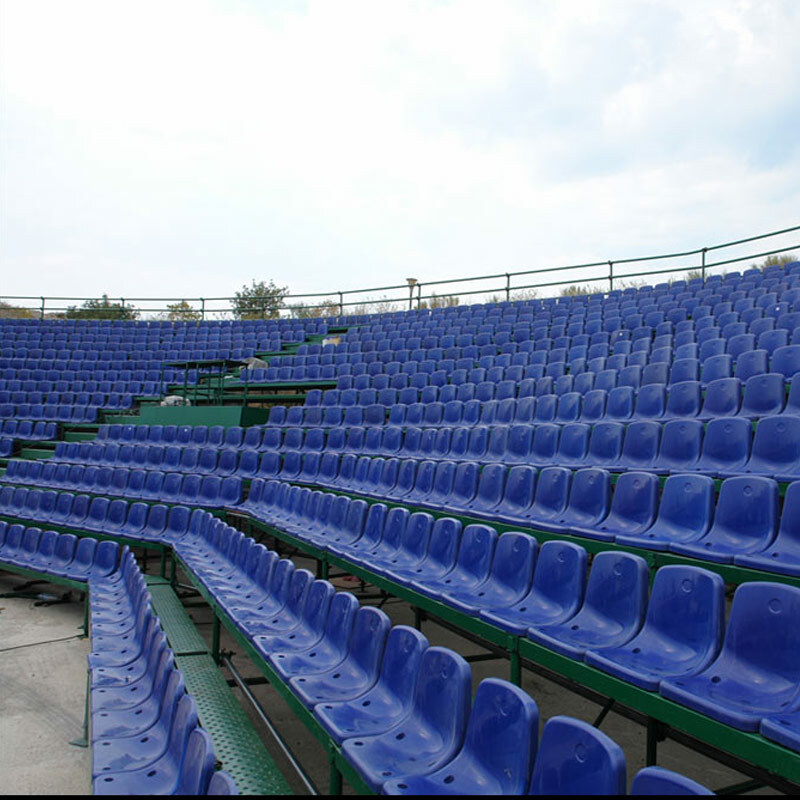 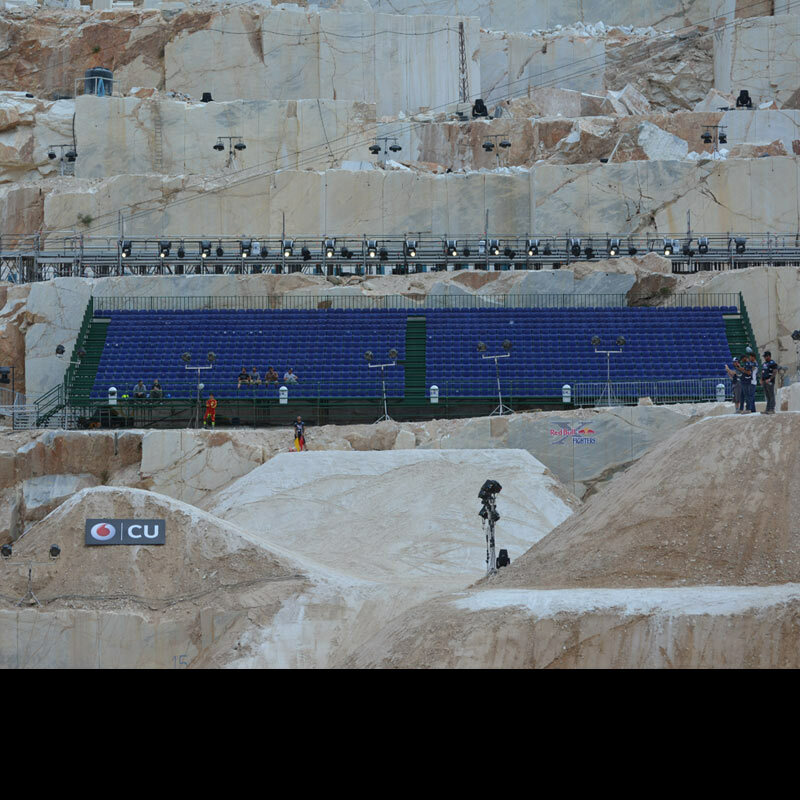 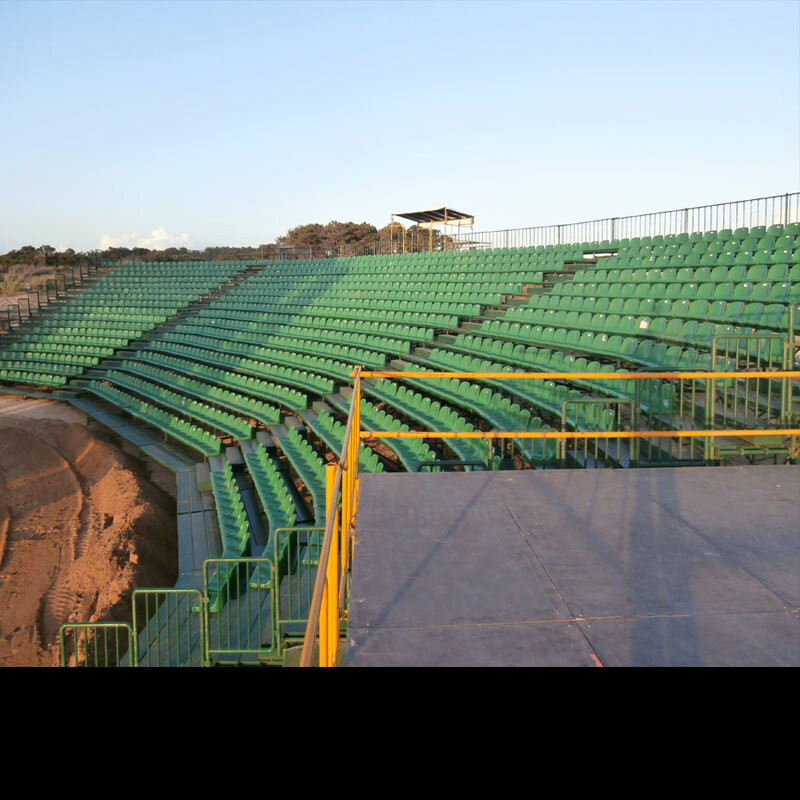 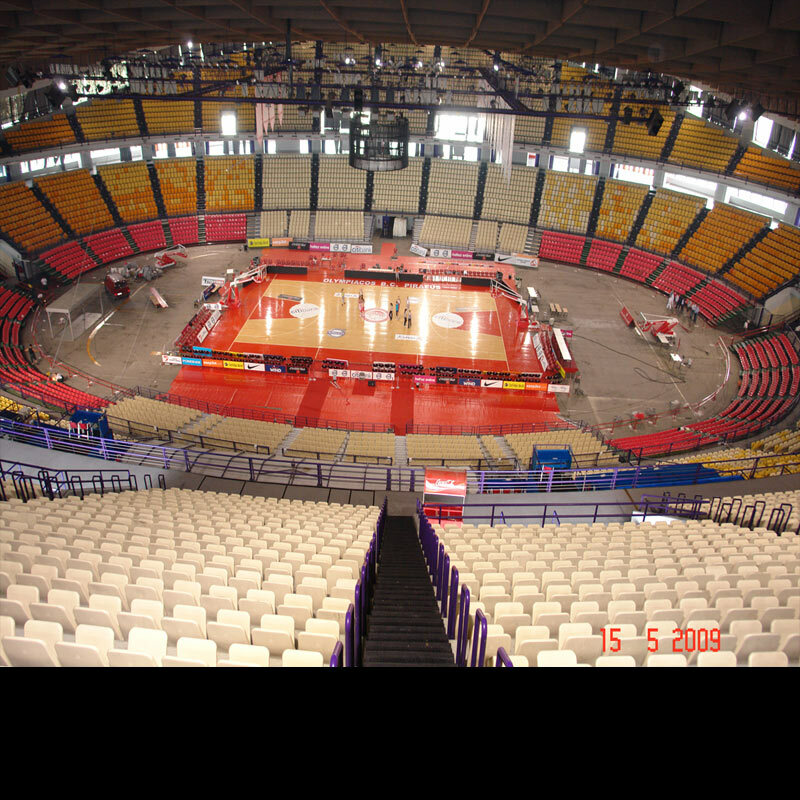 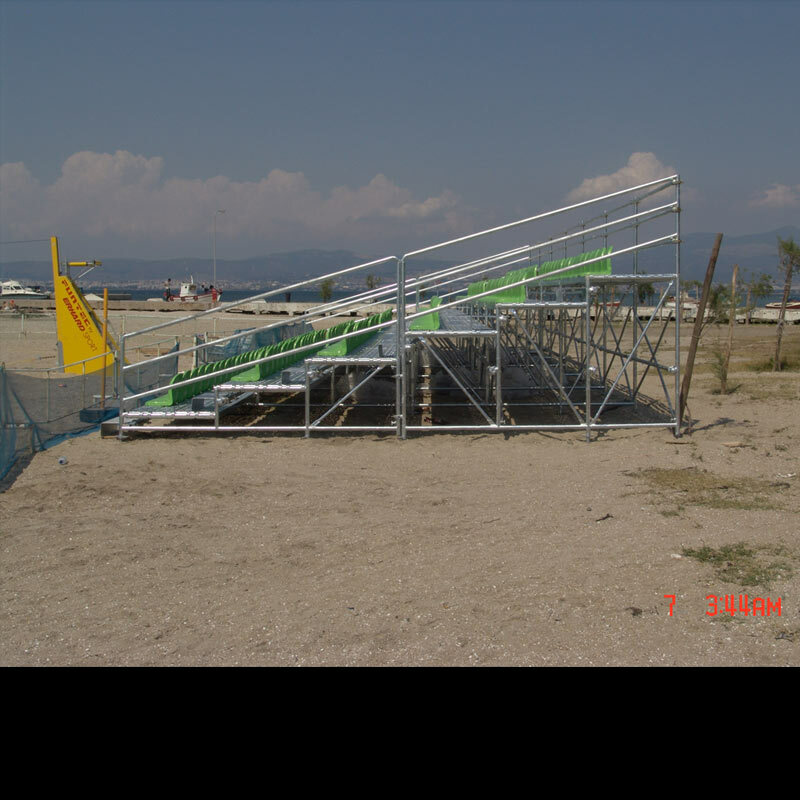 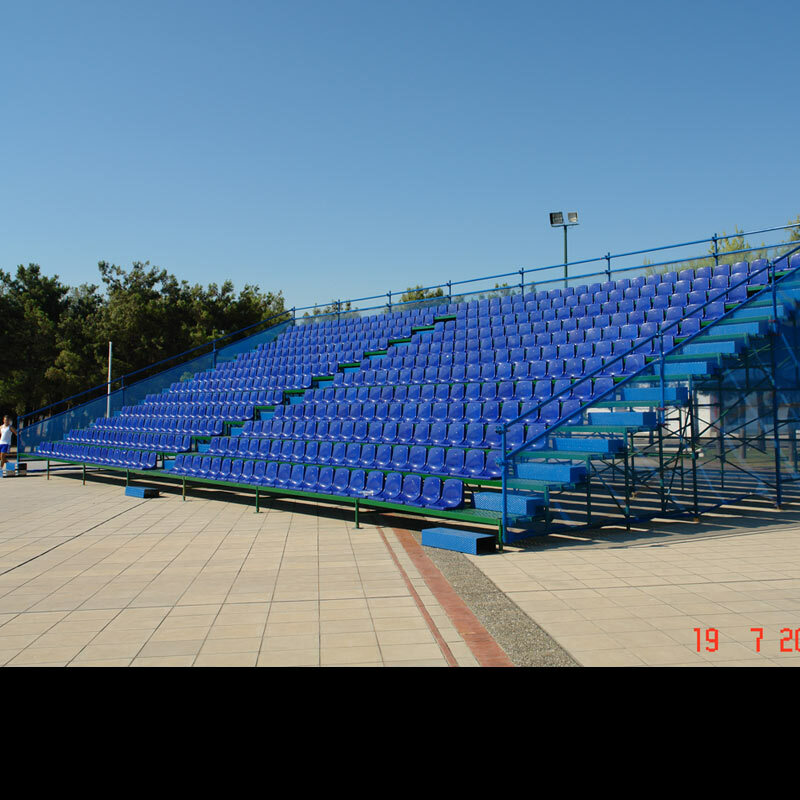 PROJECT: Settling, hiring and disassembling of a metallic tribune with plastic seats and stage of 100m2 at Alimos. 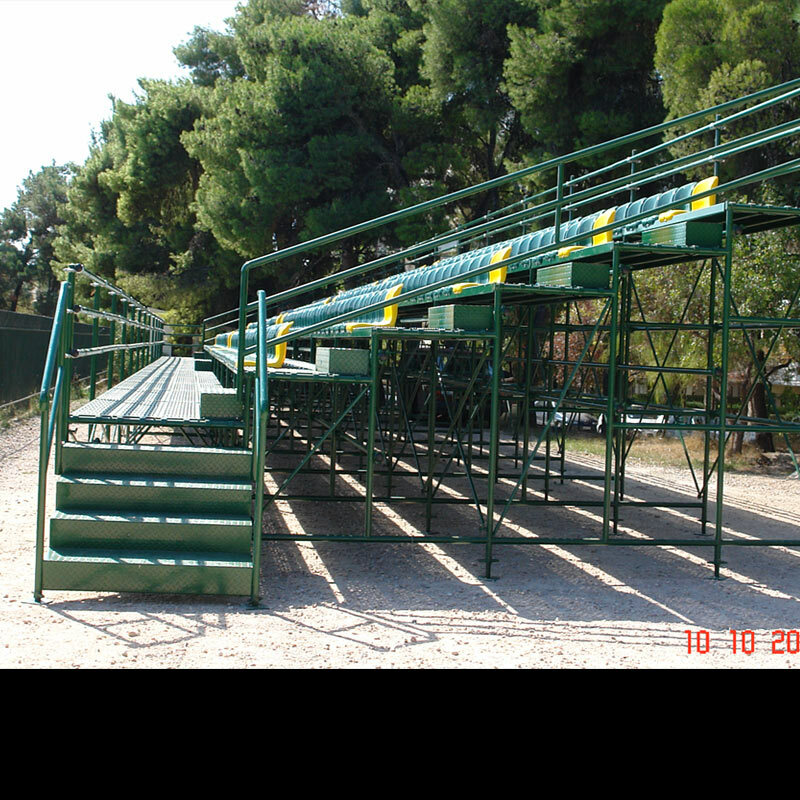 PROJECT:Τοποθέτηση μεταλλικής κερκίδας με πλαστικό κάθισμα στο Δήμο Πεύκης. 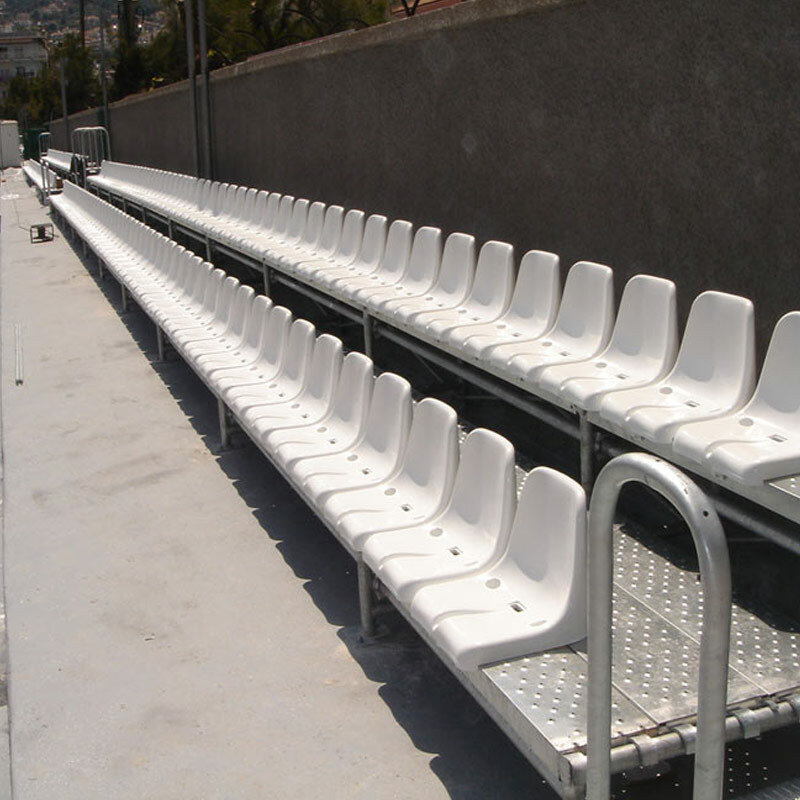 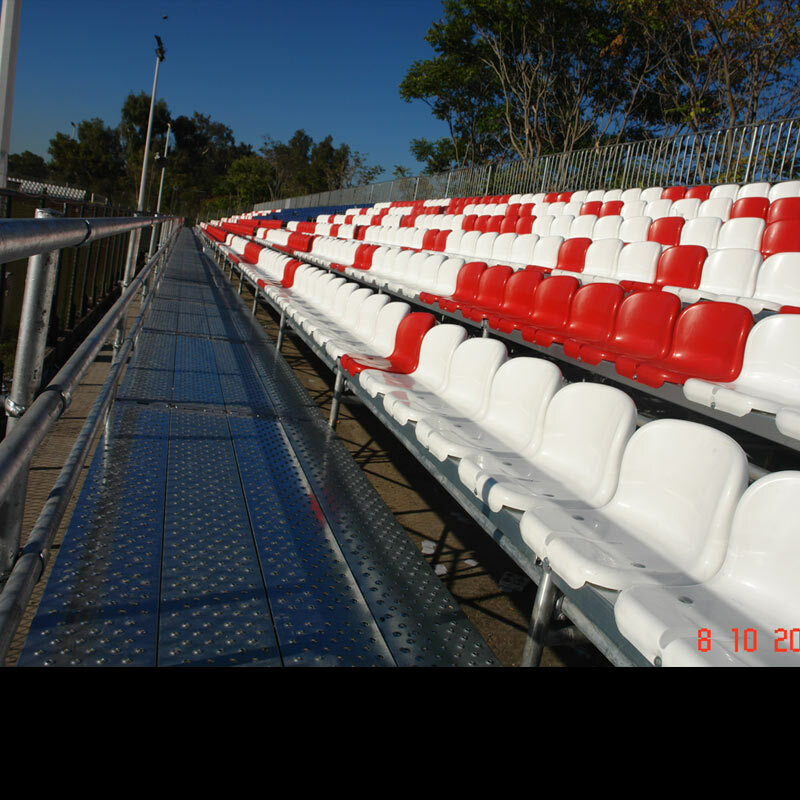 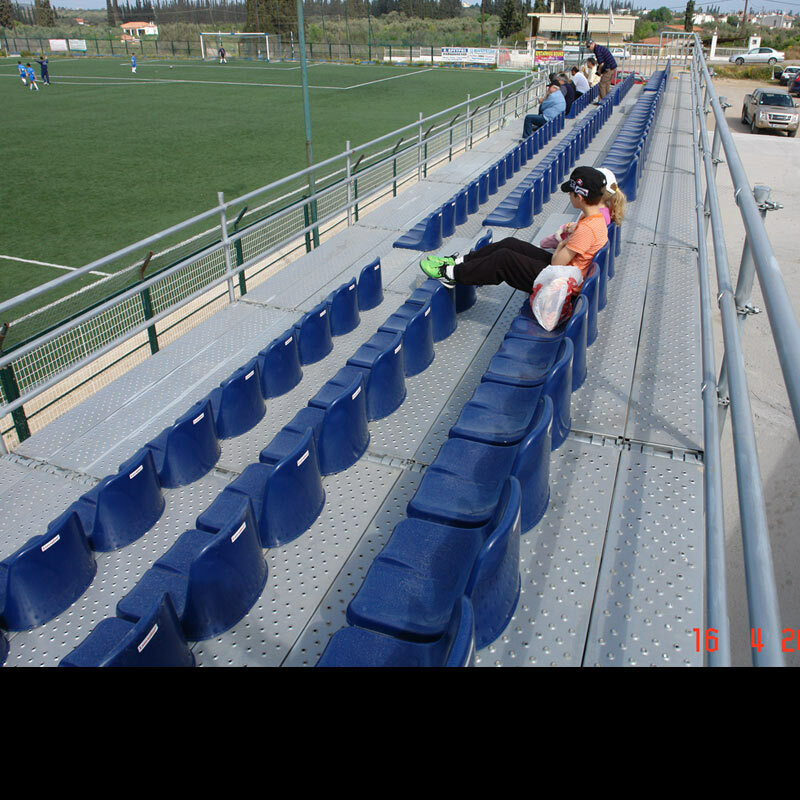 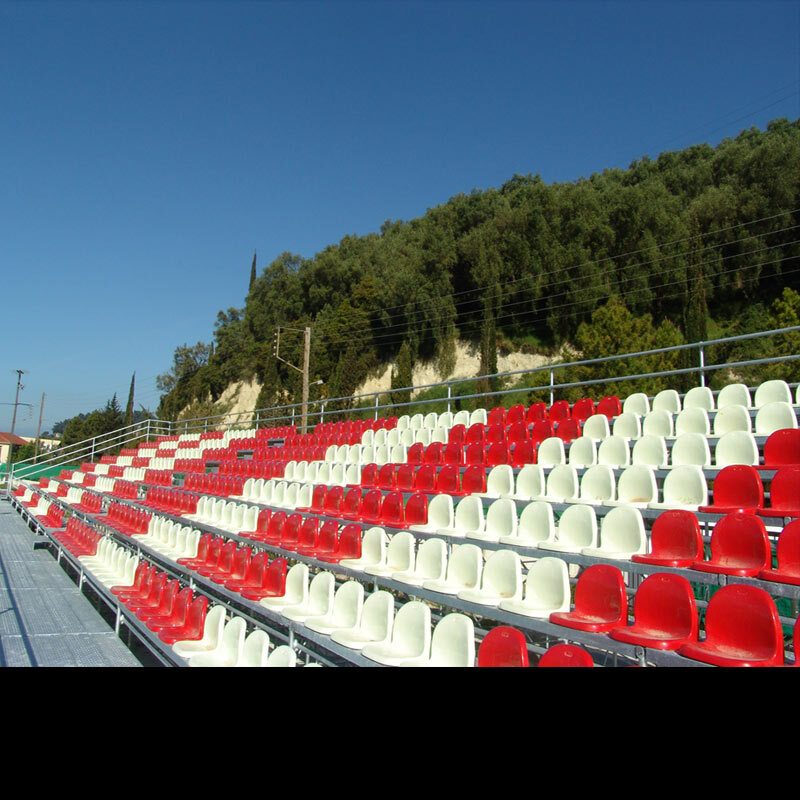 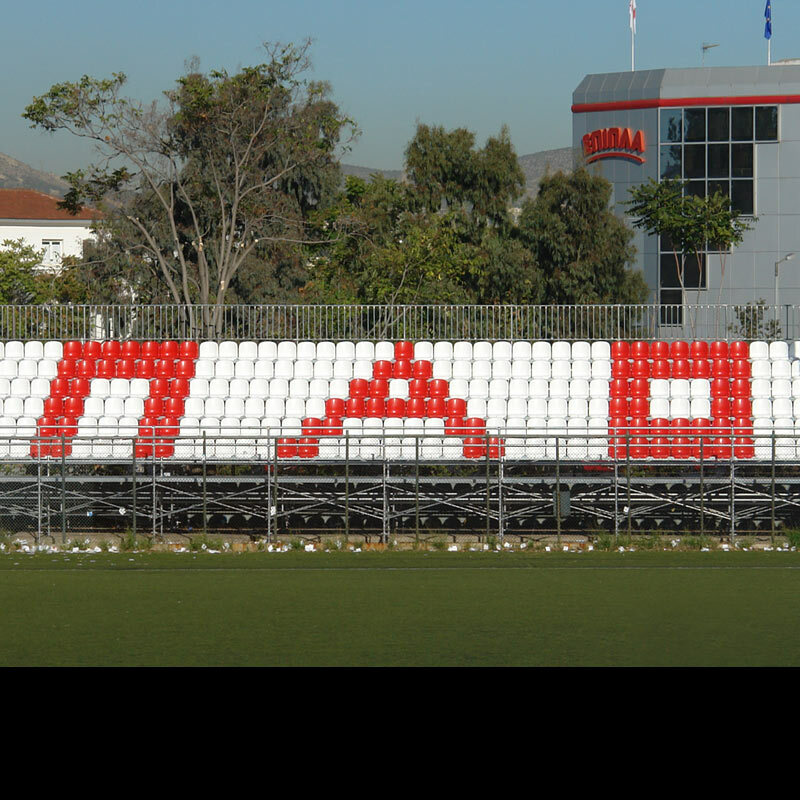 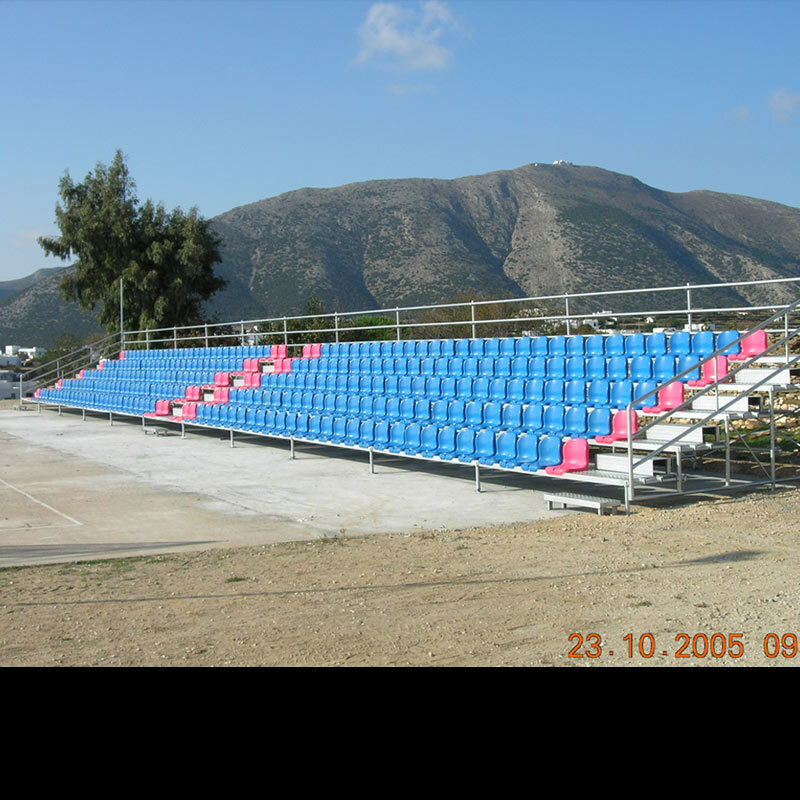 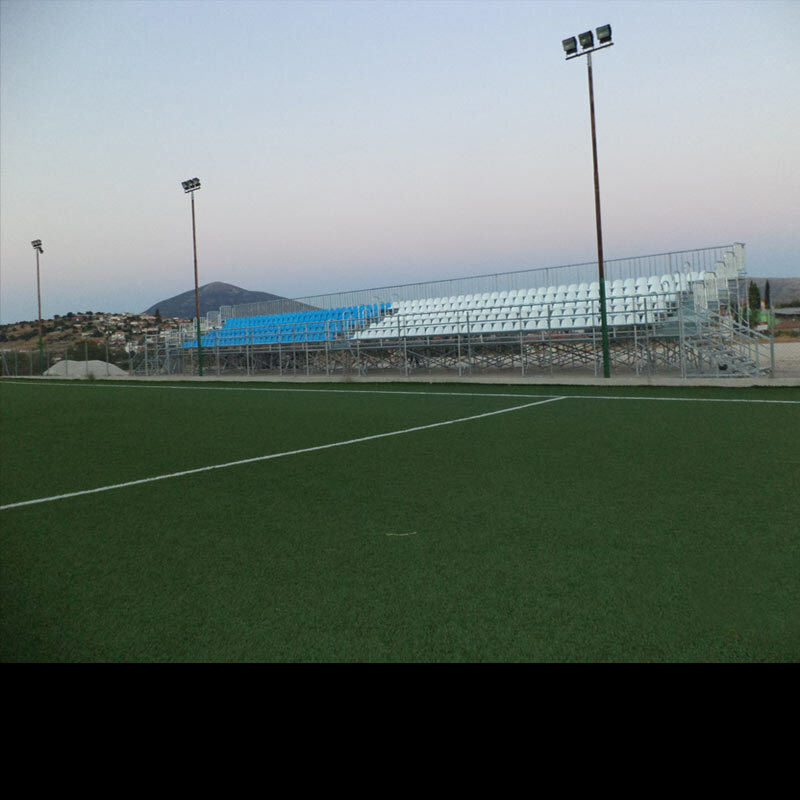 PROJECT: Placement of a metallic tribune with plastic seats at Drosia, Halkida. 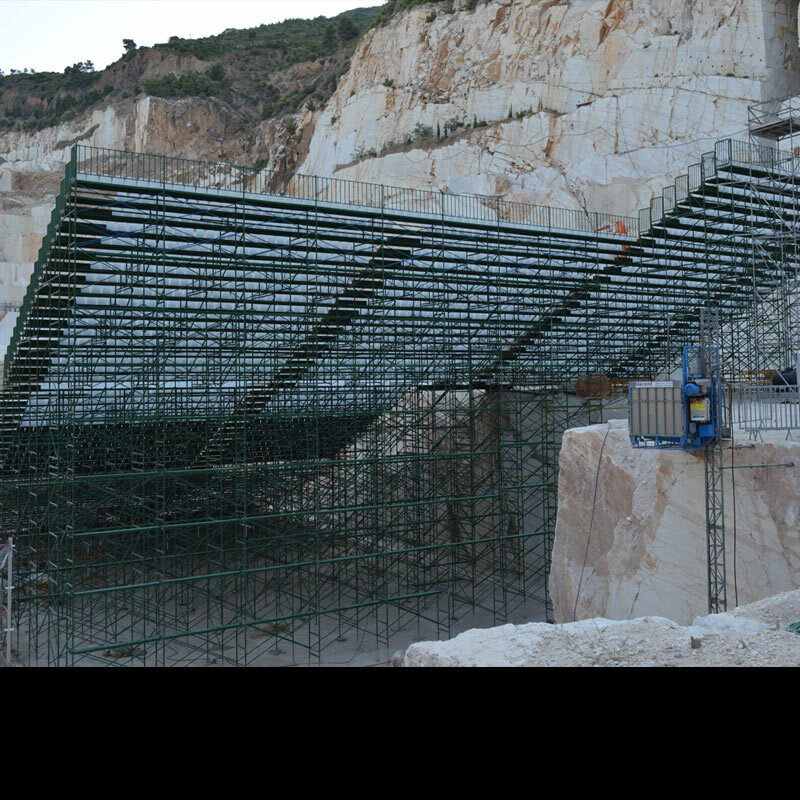 PROJECT: Placement of a metallic tribune at a village near Epidavros. 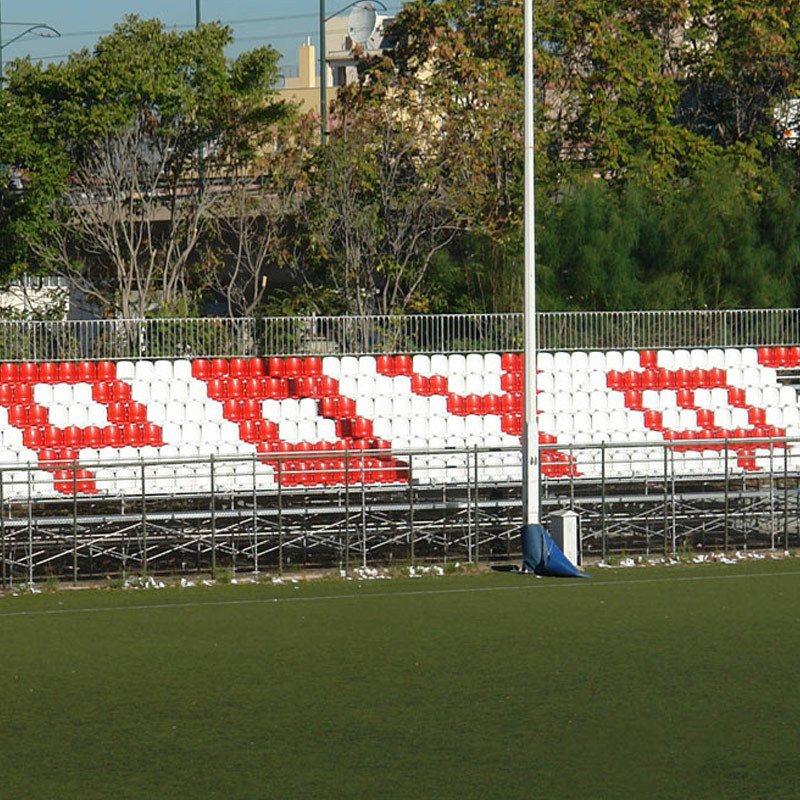 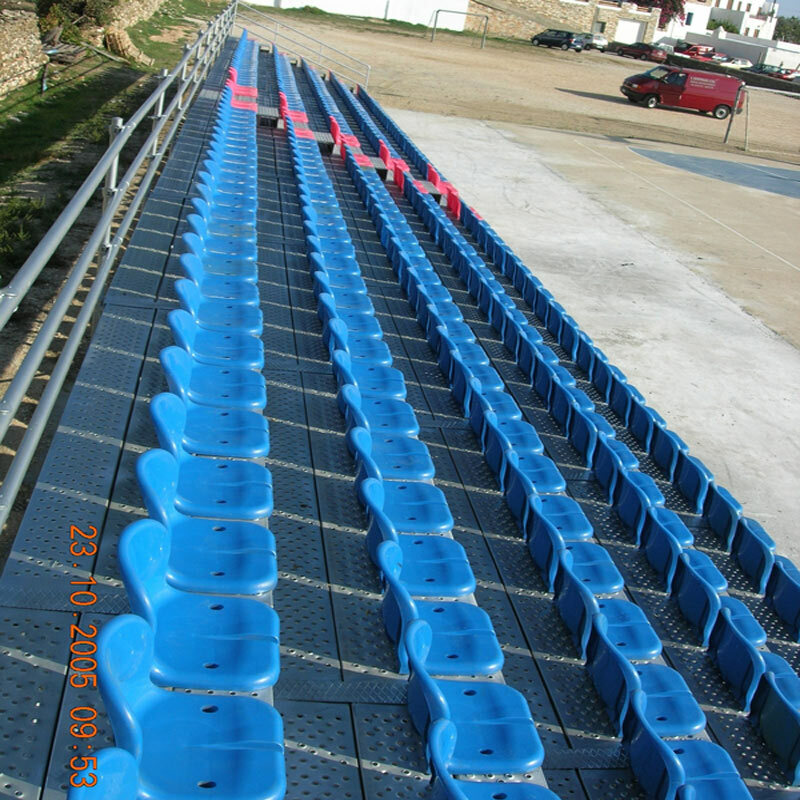 The plastic seats were placed by the Contractor. 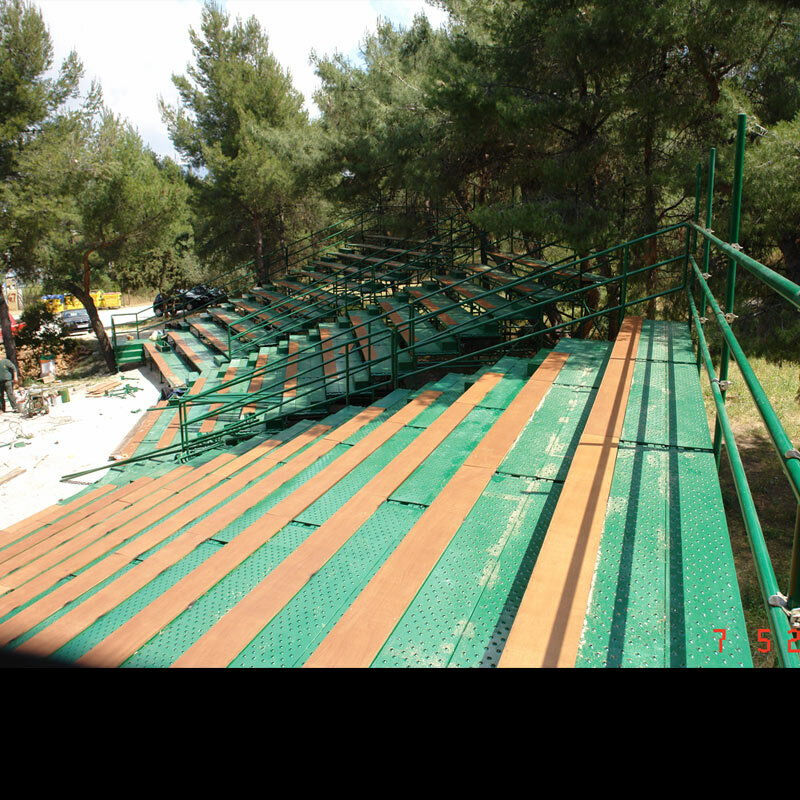 PROJECT: Settling, hiring and disassembling of a metallic tribune with plastic seats for the year end celebrations at the Erasmios School. 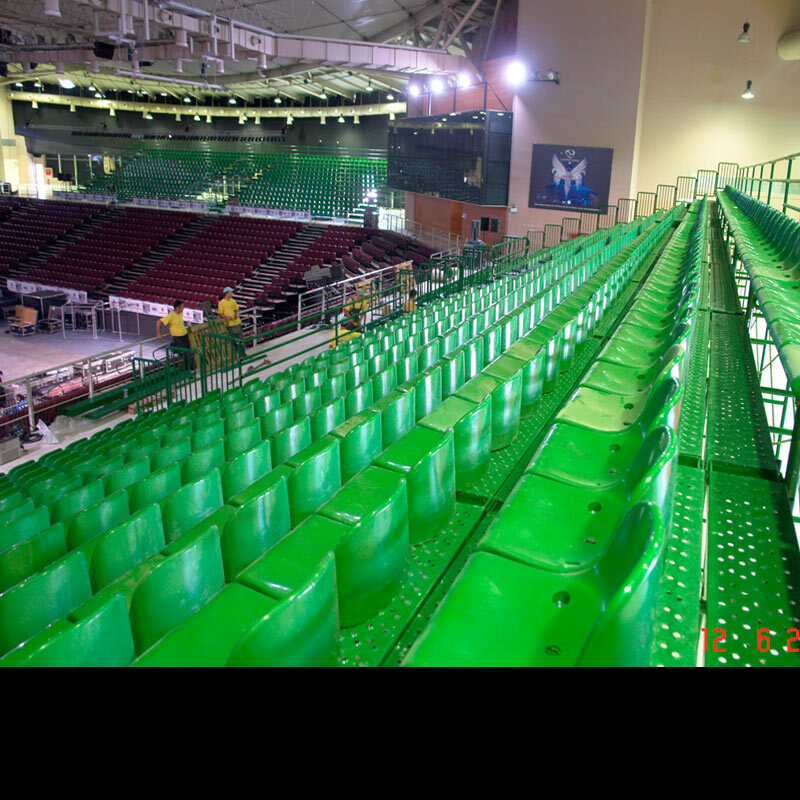 PROJECT: Settling, hiring and disassembling of a metallic tribune with plastic seats for the Fame Story Show. 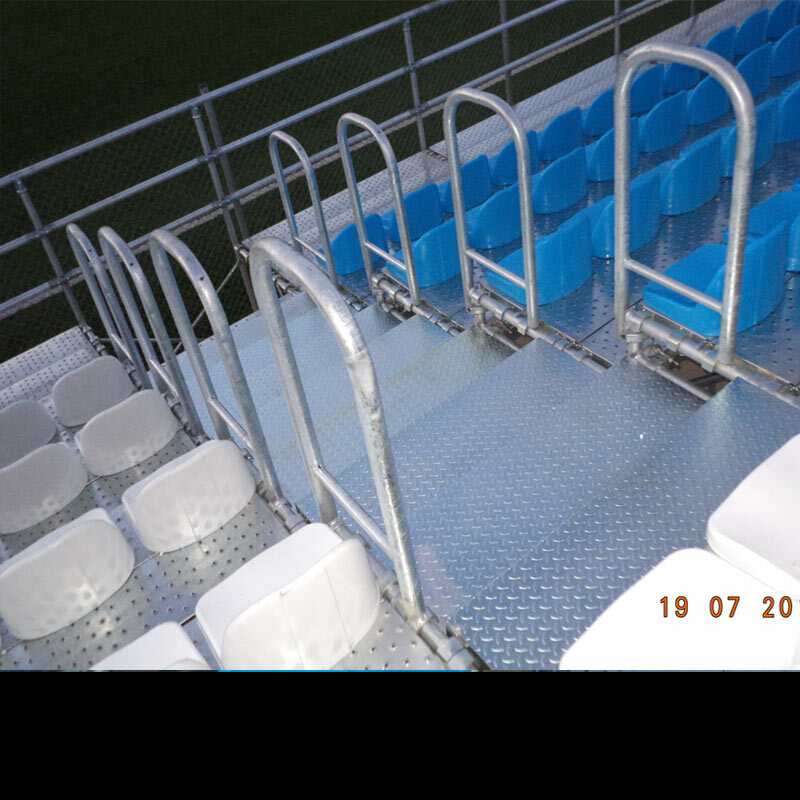 PROJECT: Placement of a metallic tribune with plastic seats at the Stadium of Anoixi. 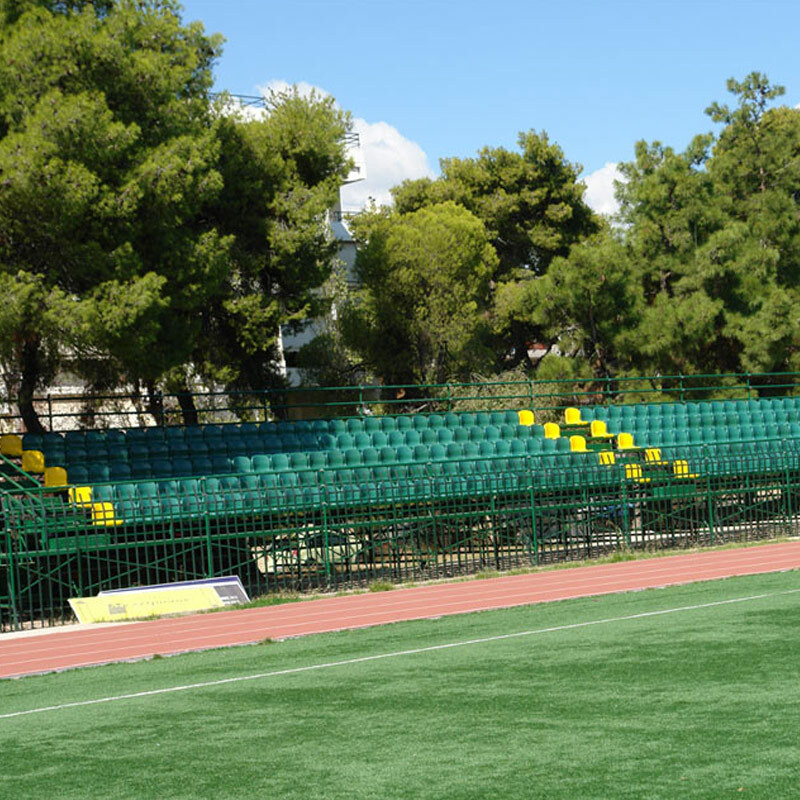 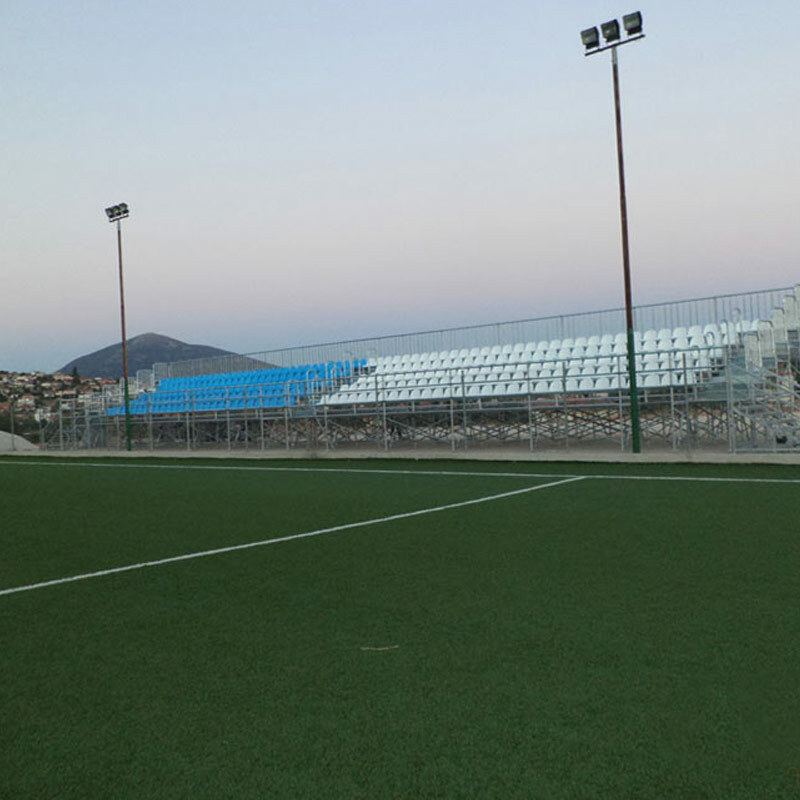 PROJECT: Placement of a metallic tribune with plastic seats at the Vrilissia Stadium. 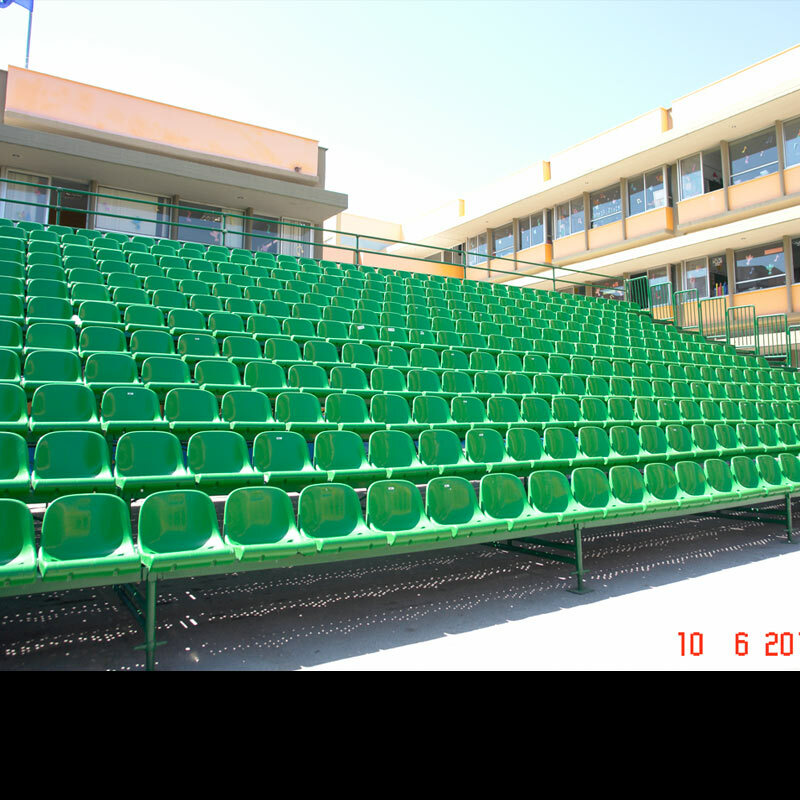 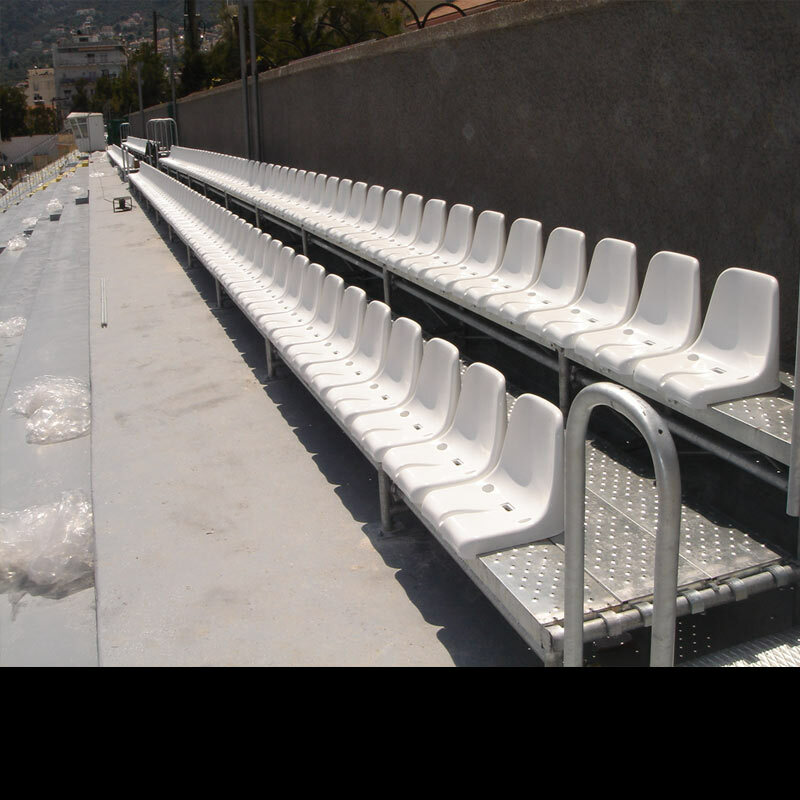 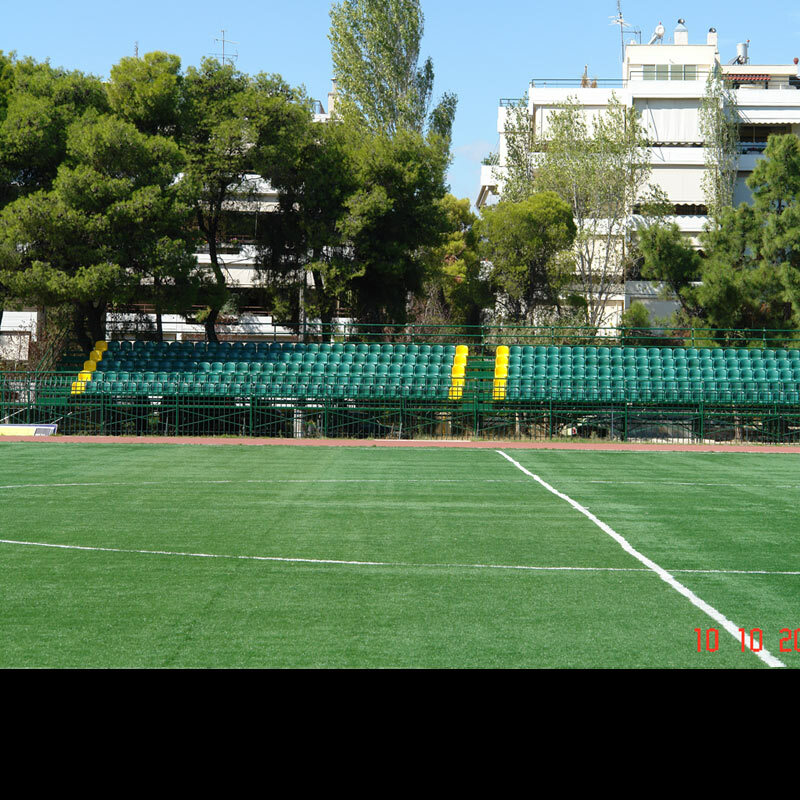 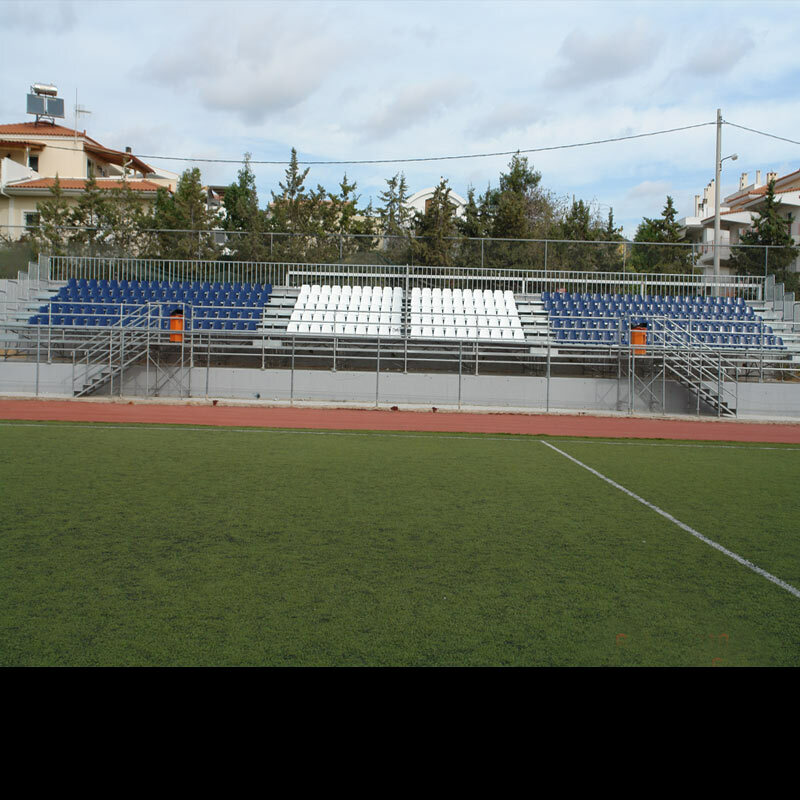 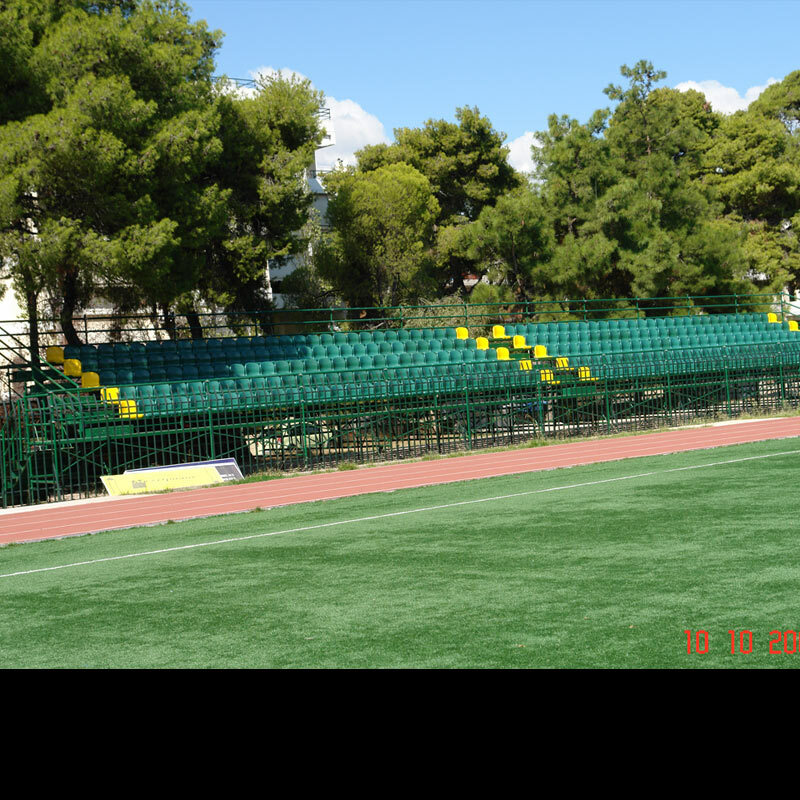 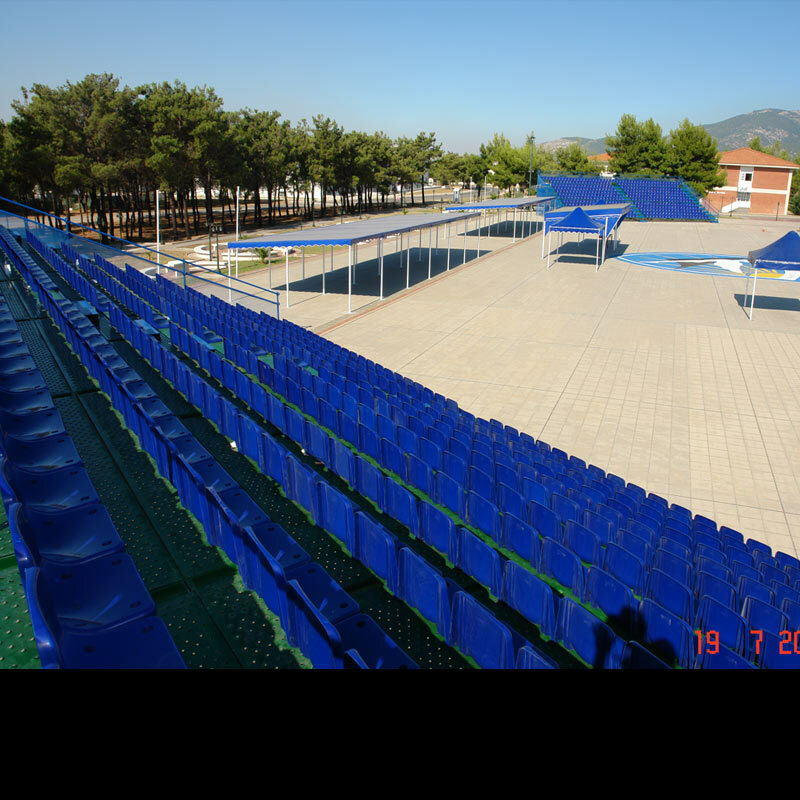 PROJECT: Settling, hiring and disassembling of a metallic tribune with plastic seats at Rafina High school. 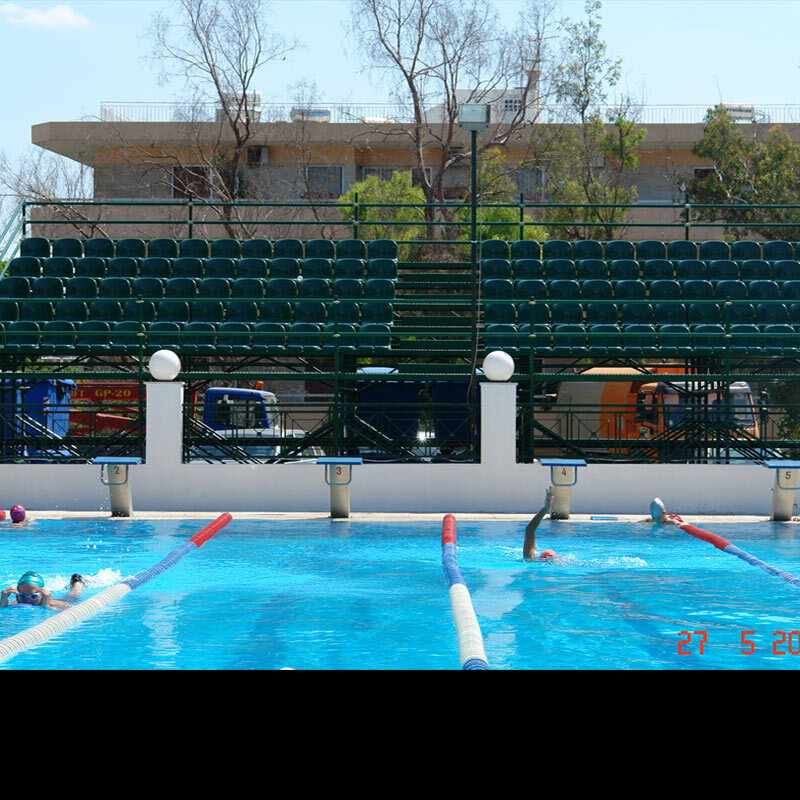 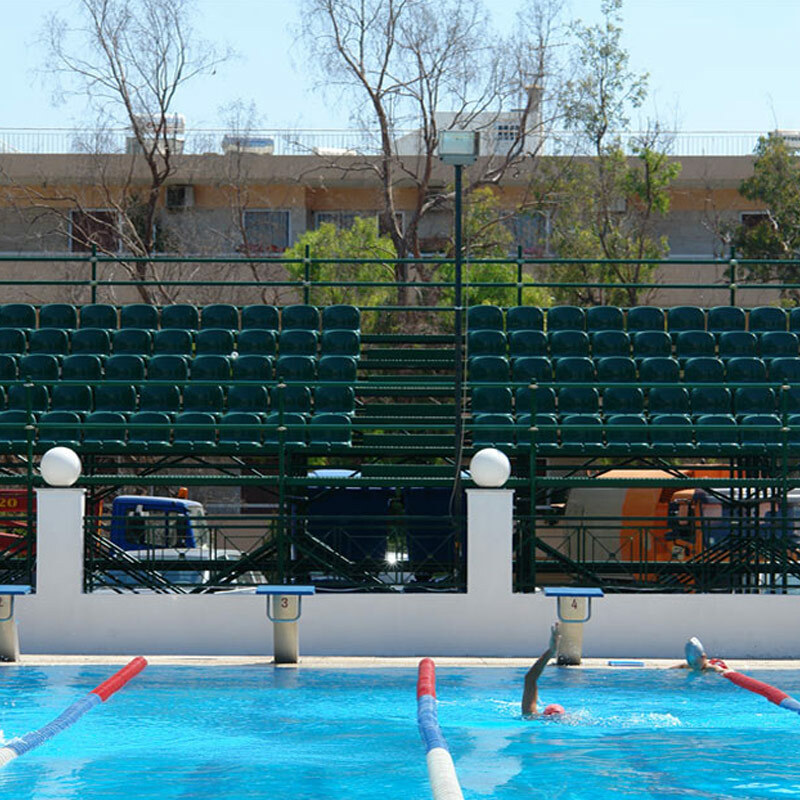 PROJECT: Placement of a metallic tribune with plastic seats at the public swimming pool of Pefki. 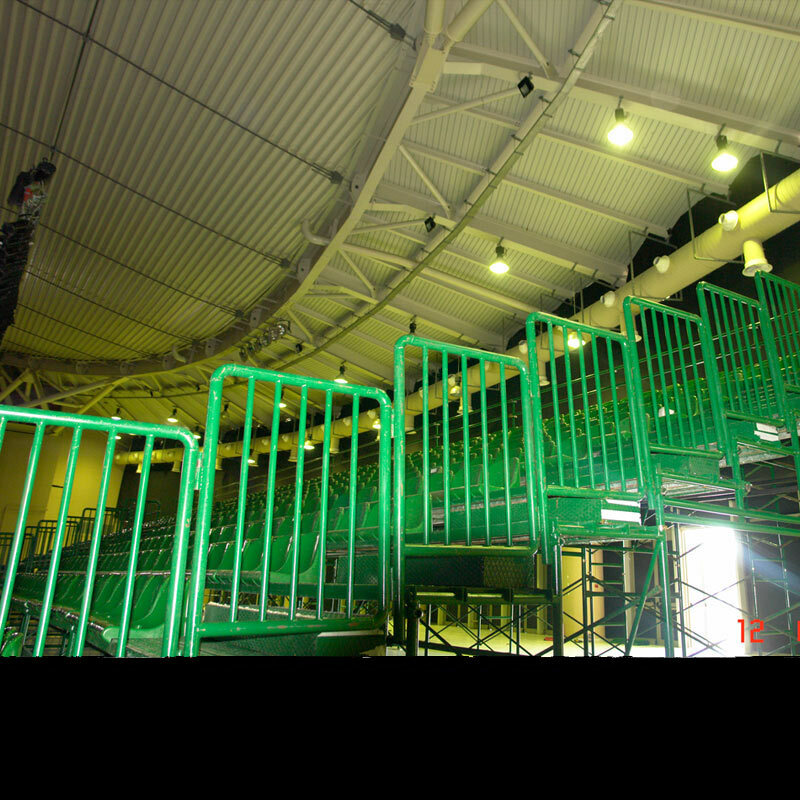 PROJECT: Settling, hiring and disassembling of a metallic tribune with plastic seats for the MAD Video Music Awards 2010. 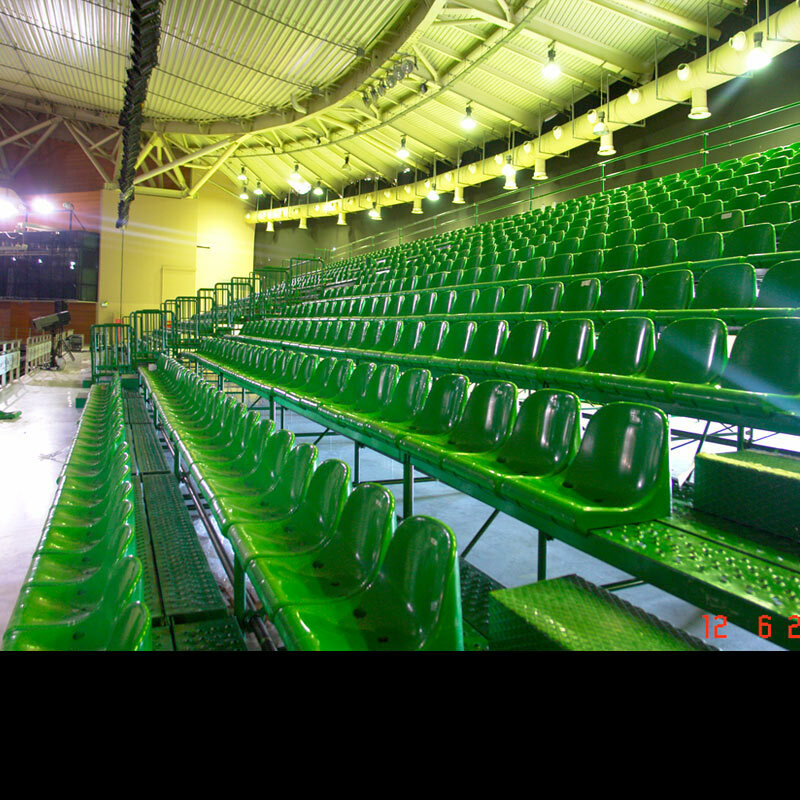 PROJECT: Settling, hiring and disassembling of a metallic tribune with plastic seats at Marathonas. 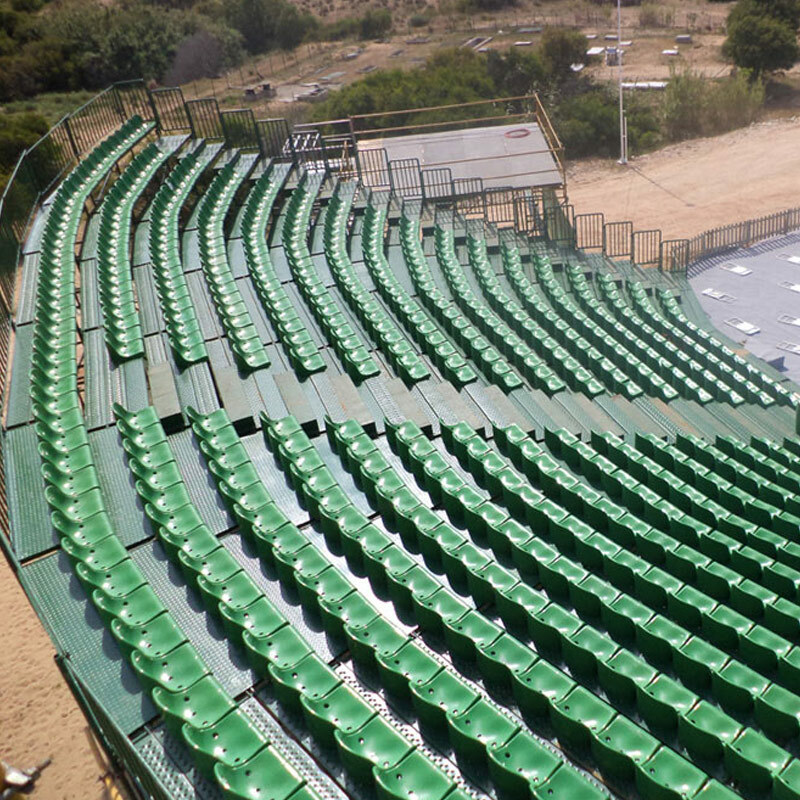 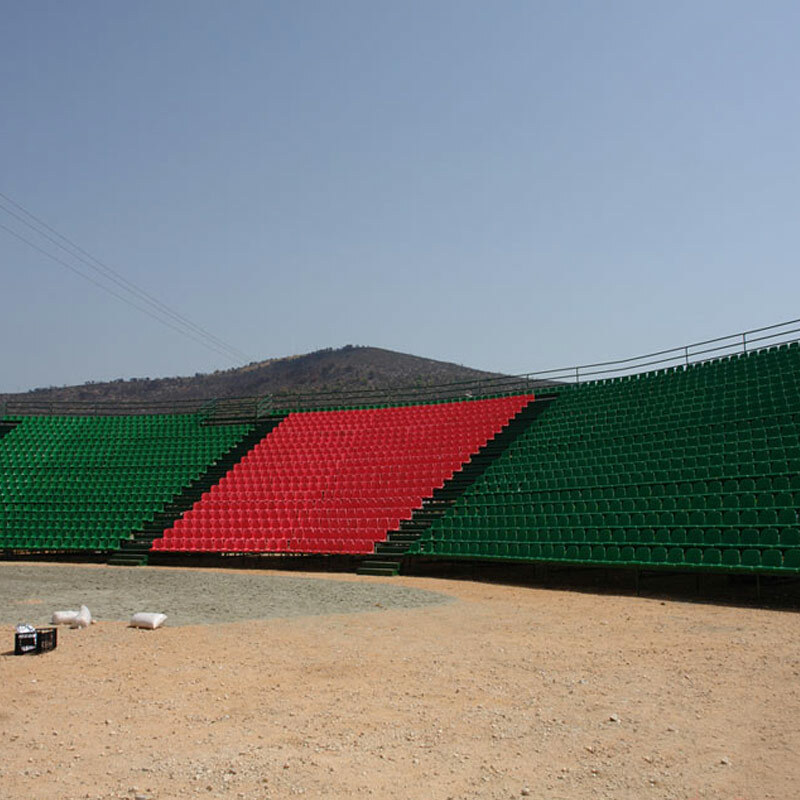 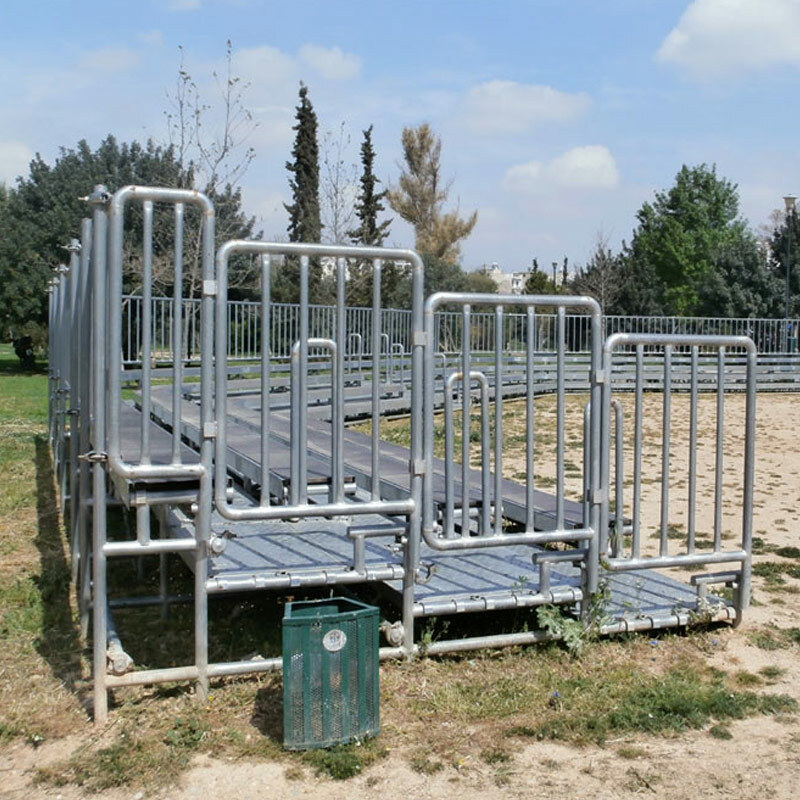 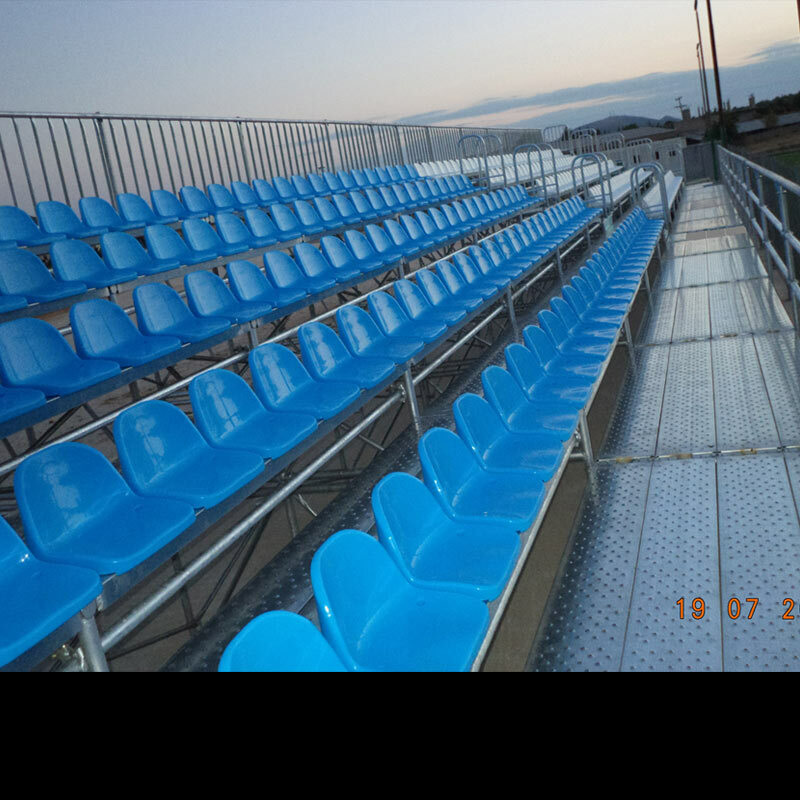 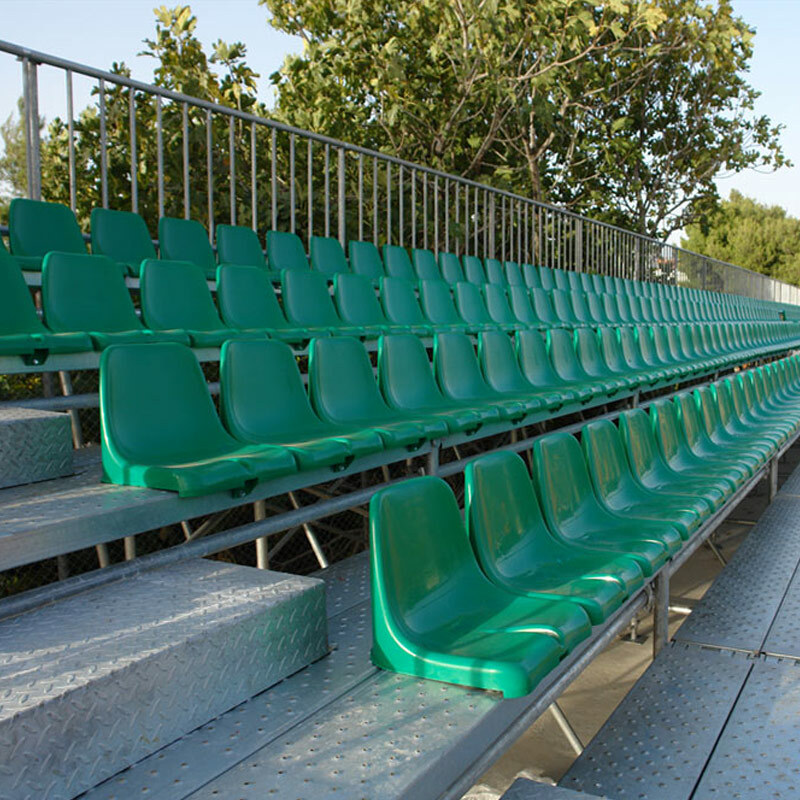 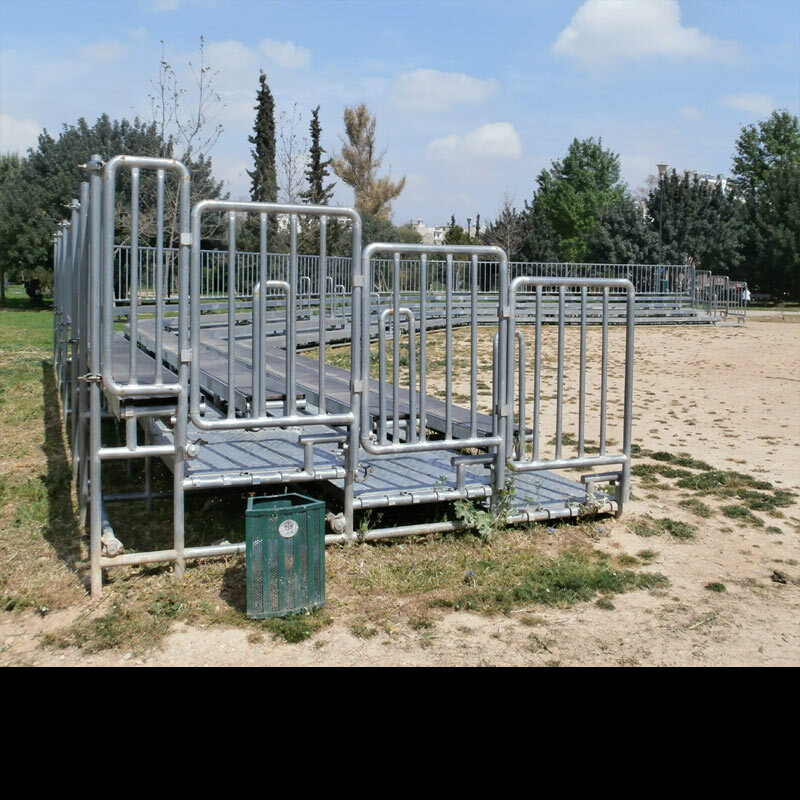 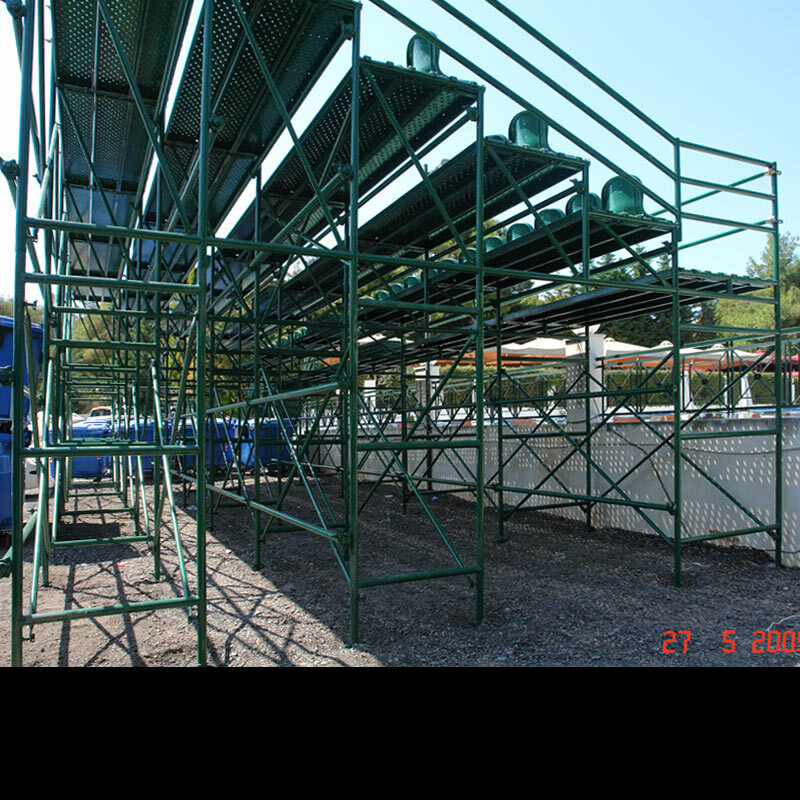 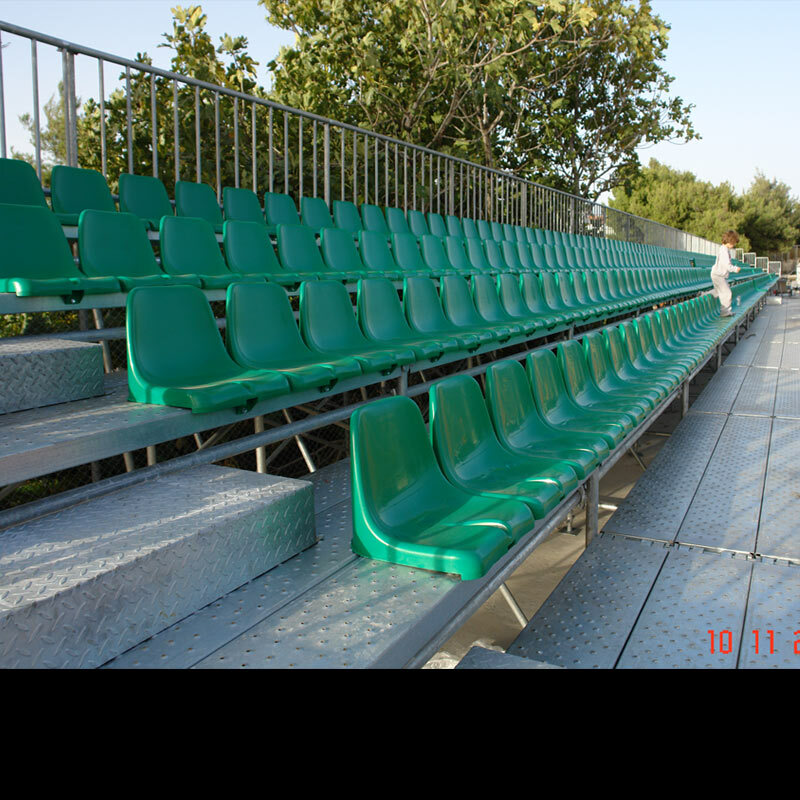 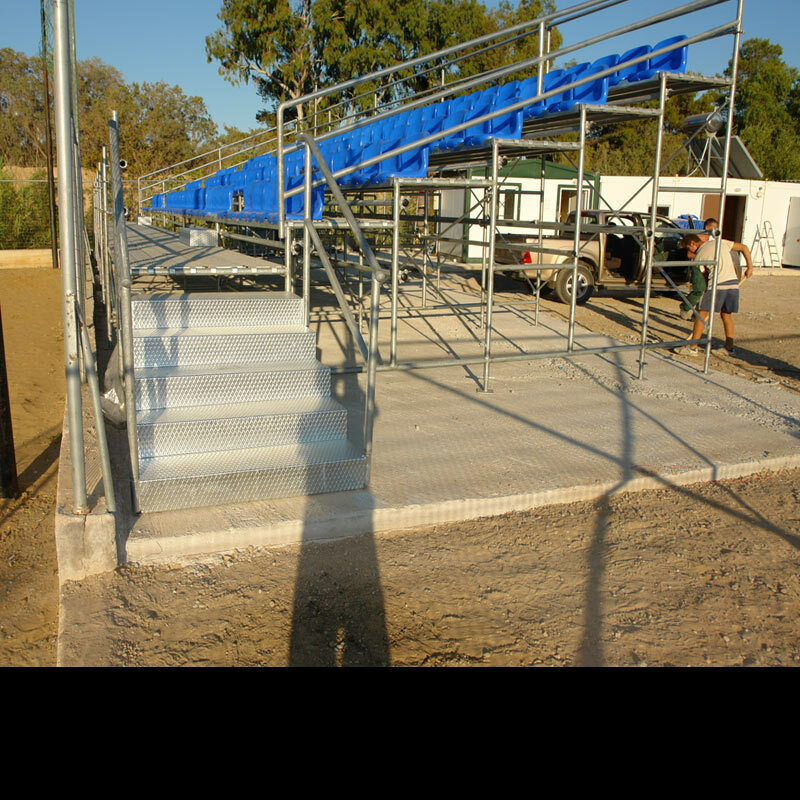 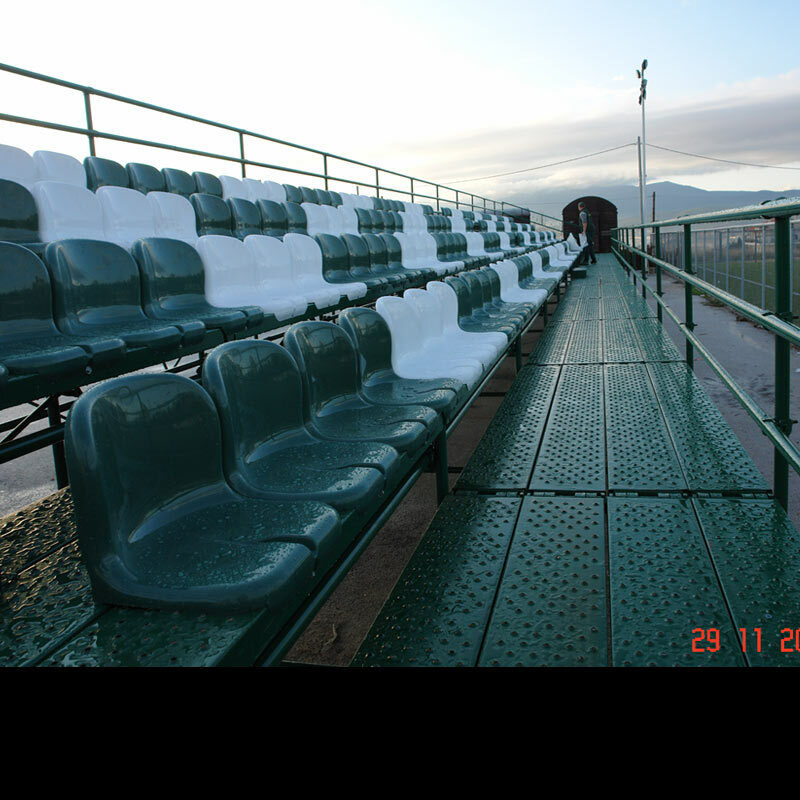 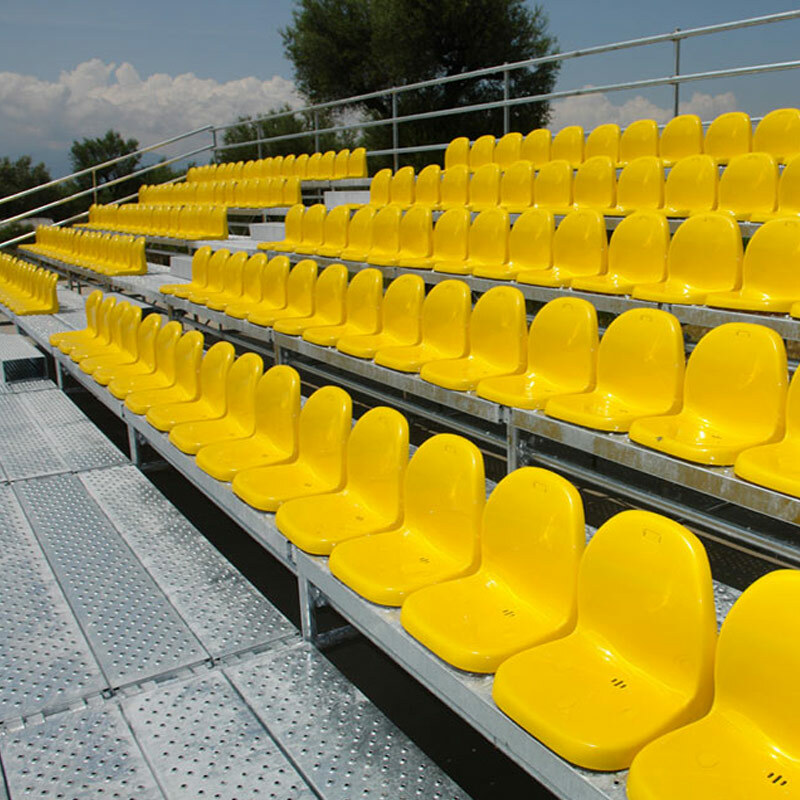 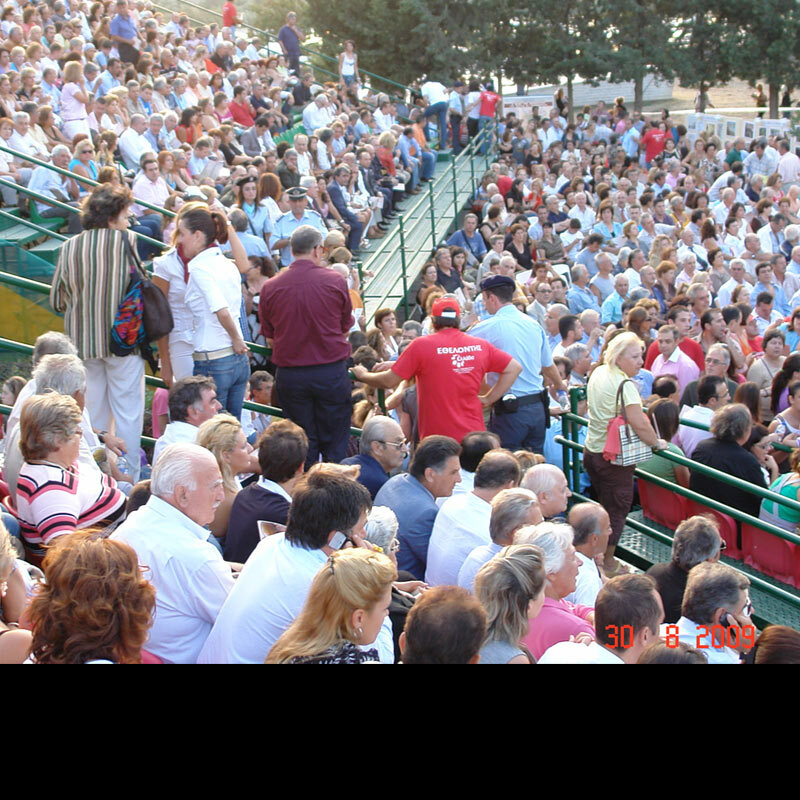 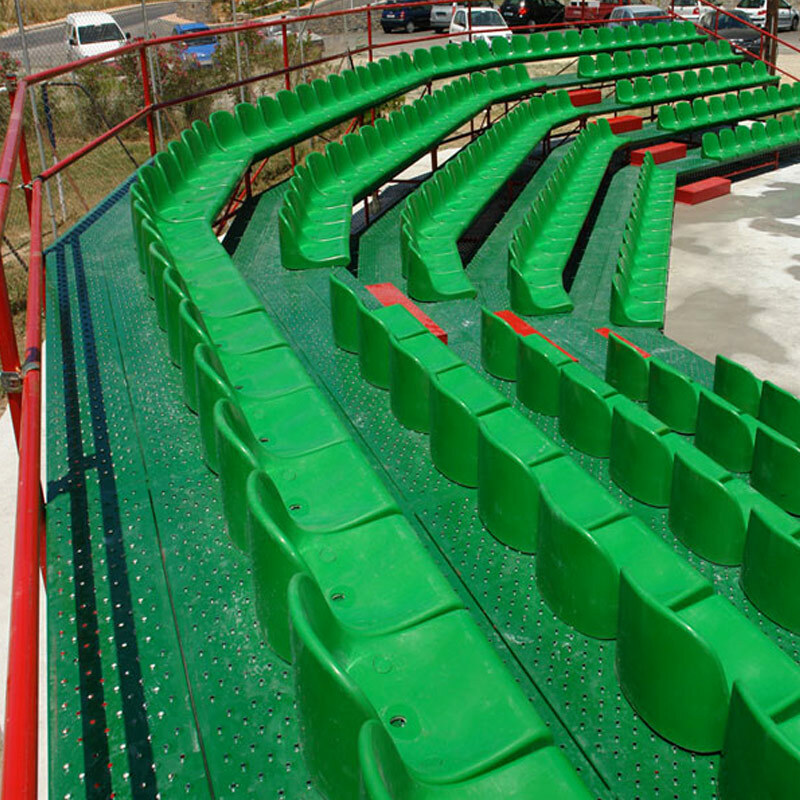 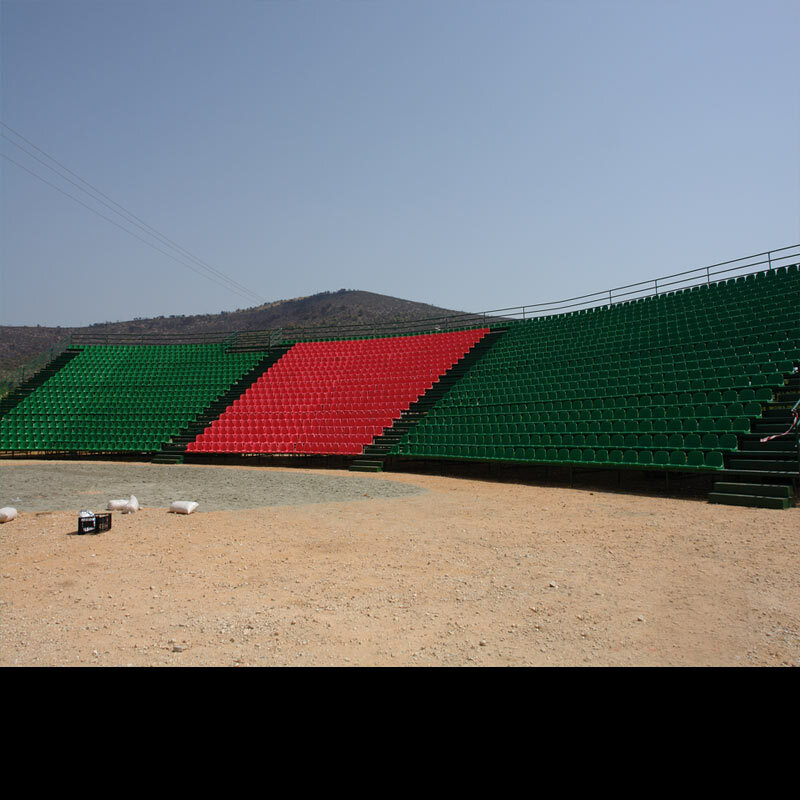 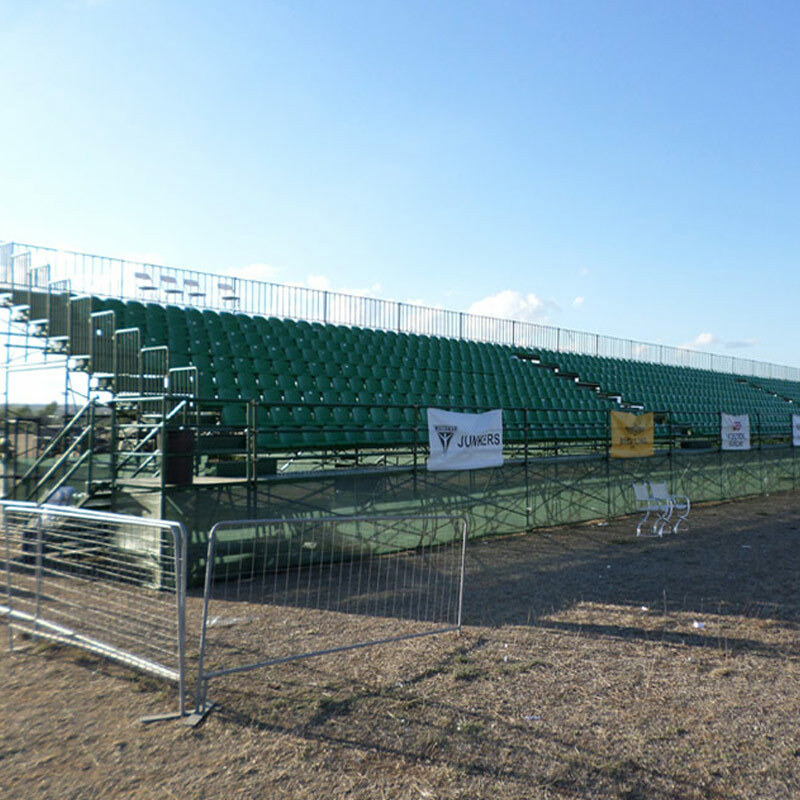 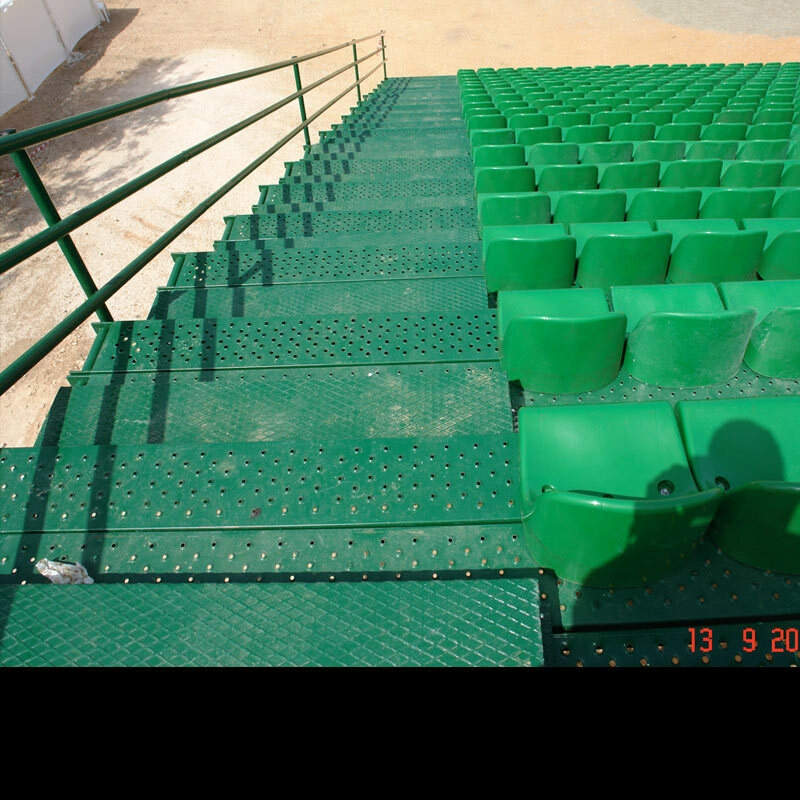 PROJECT: Placement of a metallic tribune with plastic seats at the horse racetrack in Makropoulo. 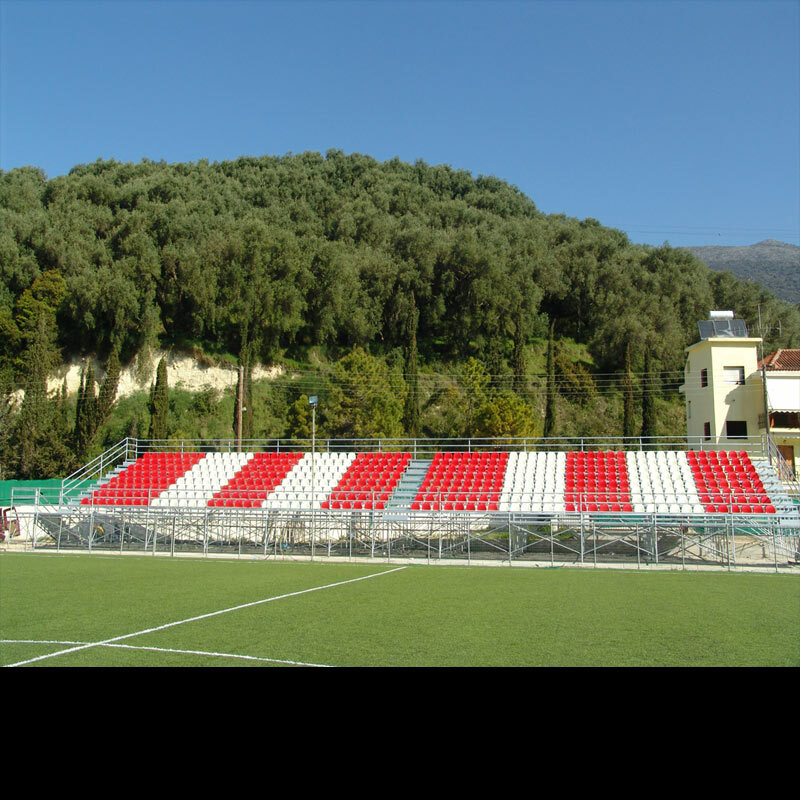 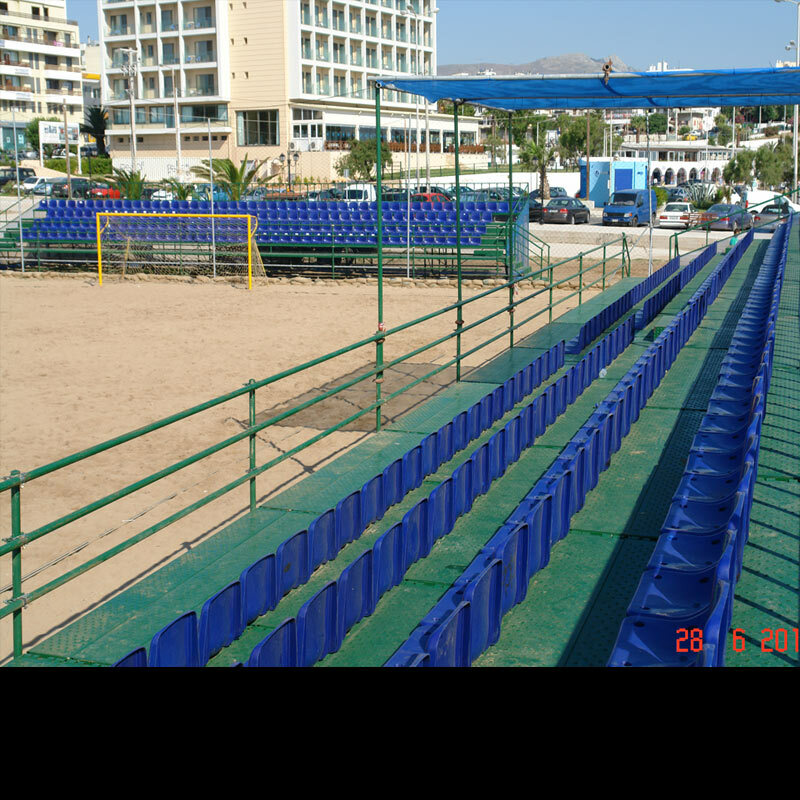 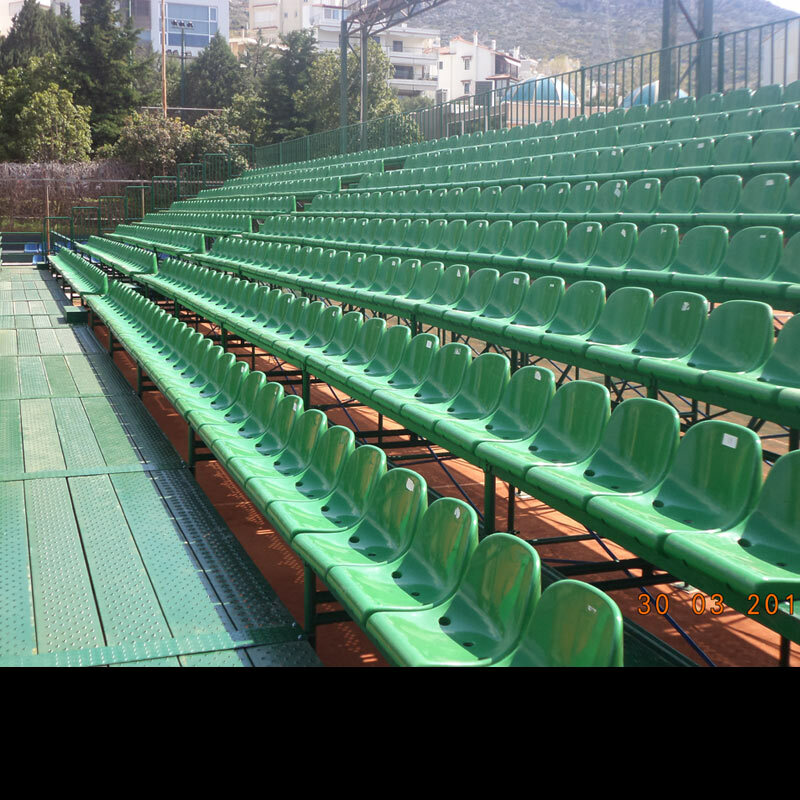 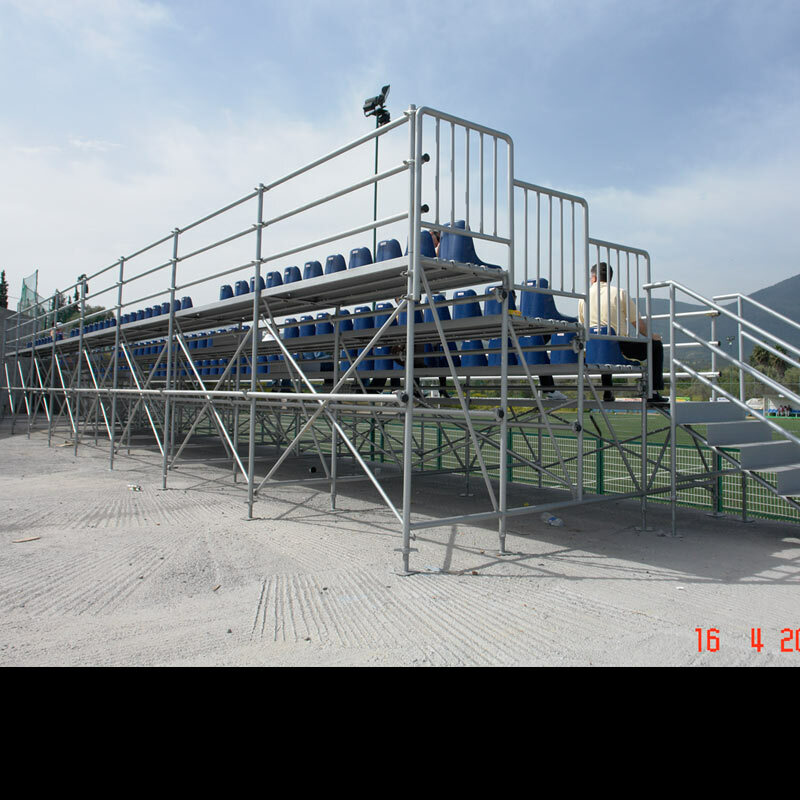 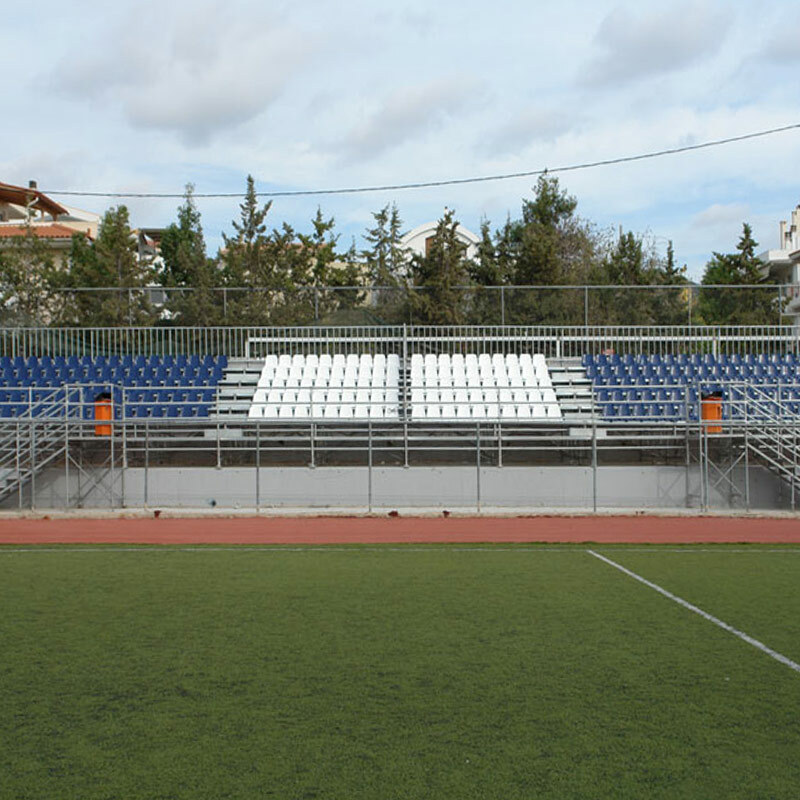 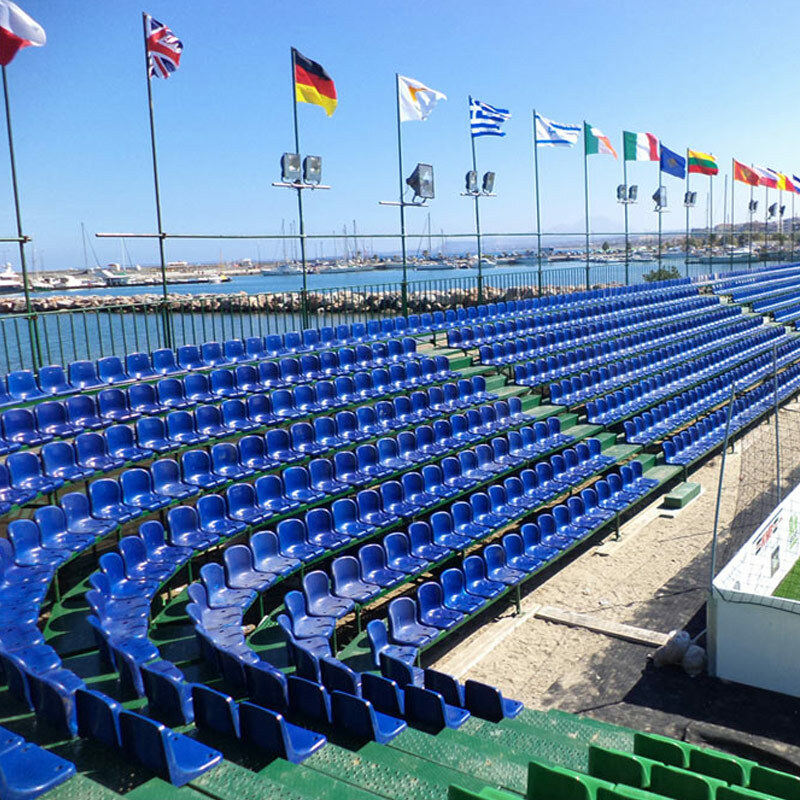 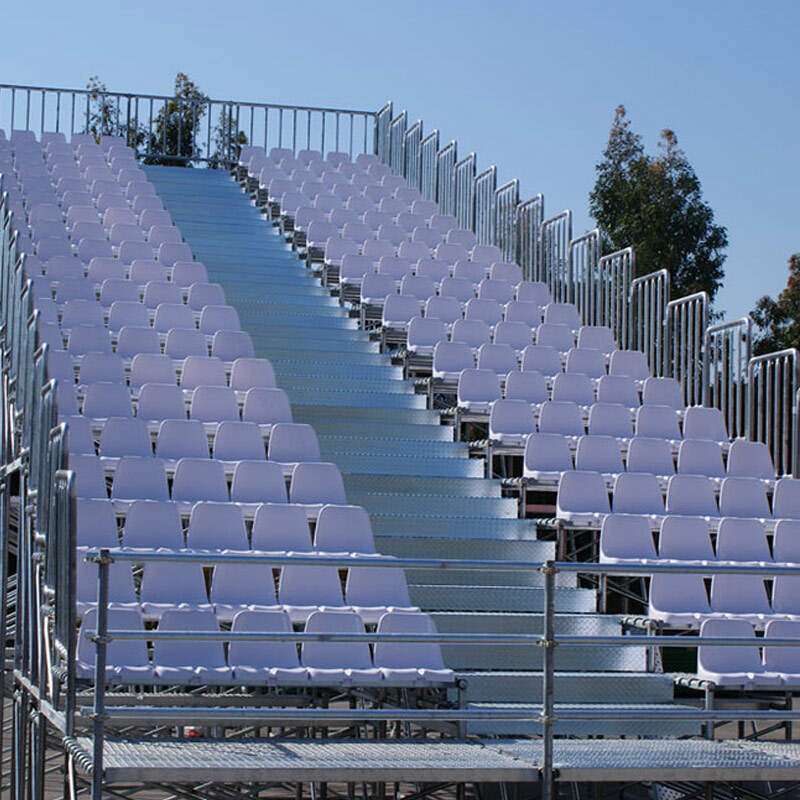 PROJECT: Settling, hiring and disassembling of a metallic tribune with plastic seats for the Soccer Championship Mini Euro 2013 at Rethimno, Crete..
PROJECT: Placement of a metallic galvanized tribune with plastic seats at the Mitilini Stadium. 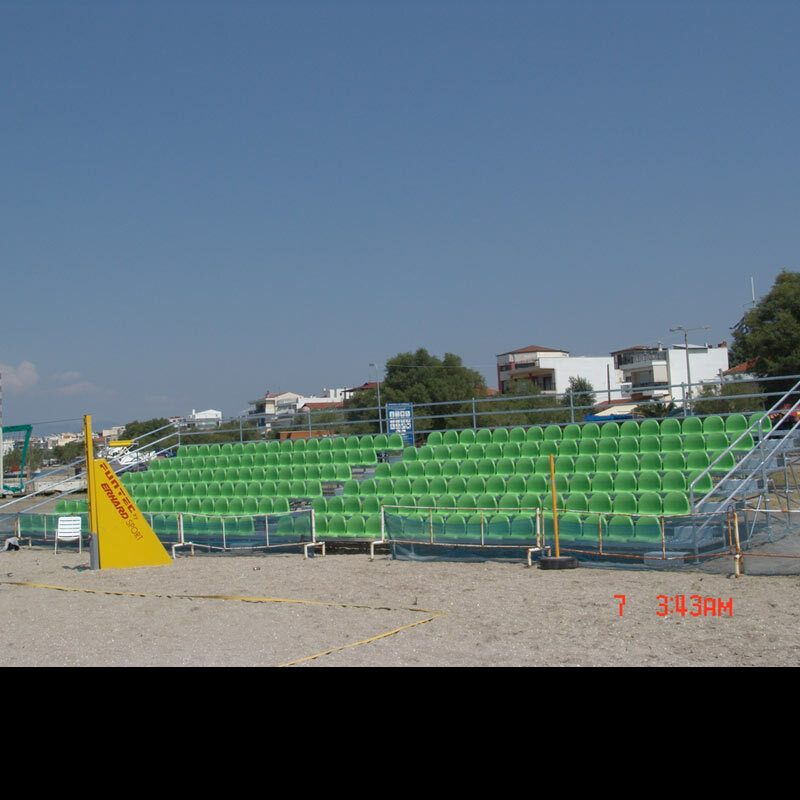 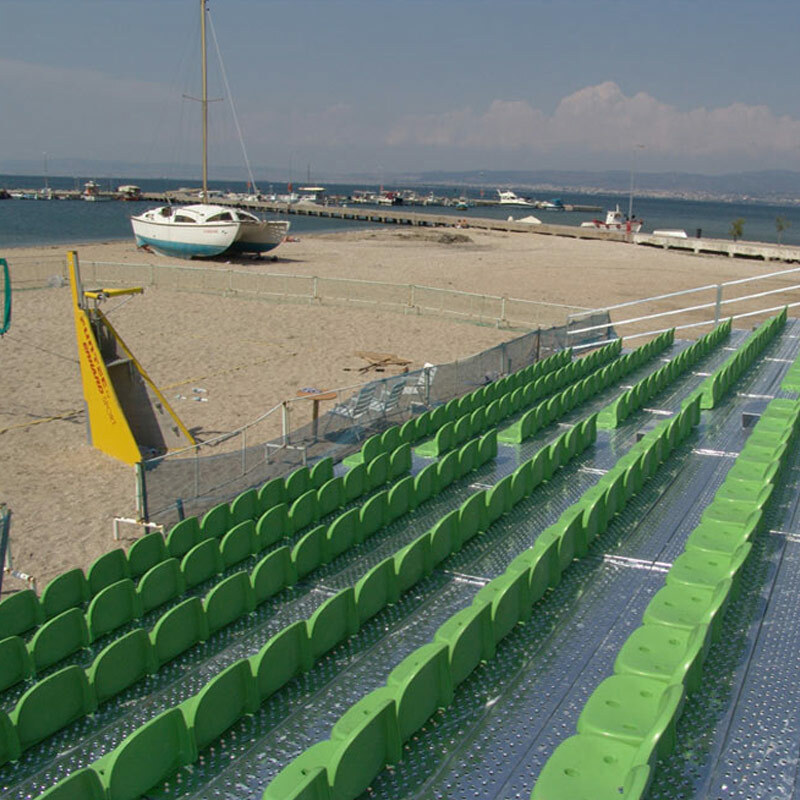 PROJECT: Placement of a metallic galvanized tribune with plastic seats at the beach of Neoi Epivates in Thessaloniki. 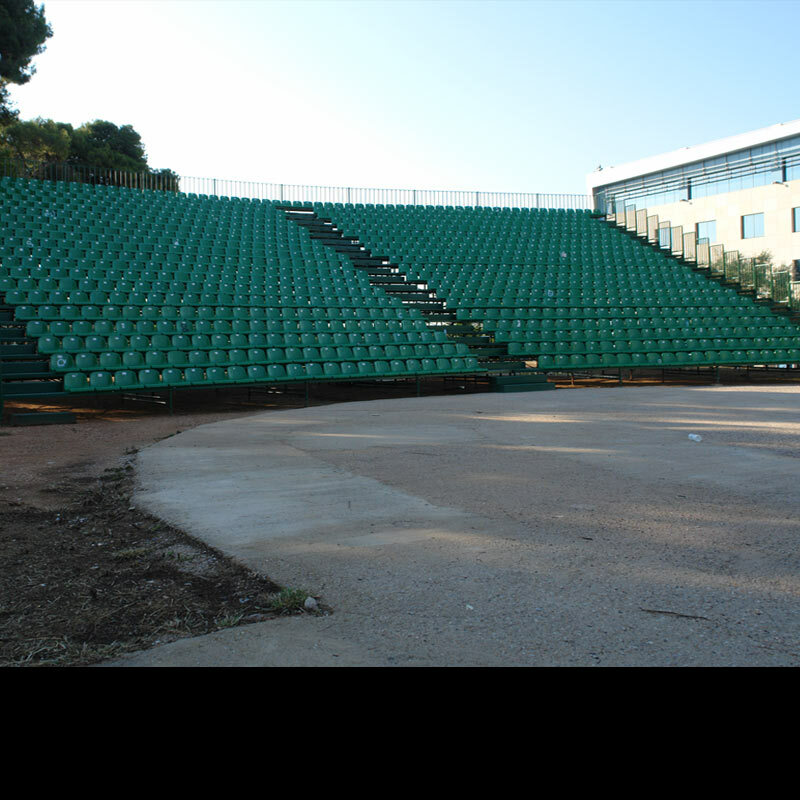 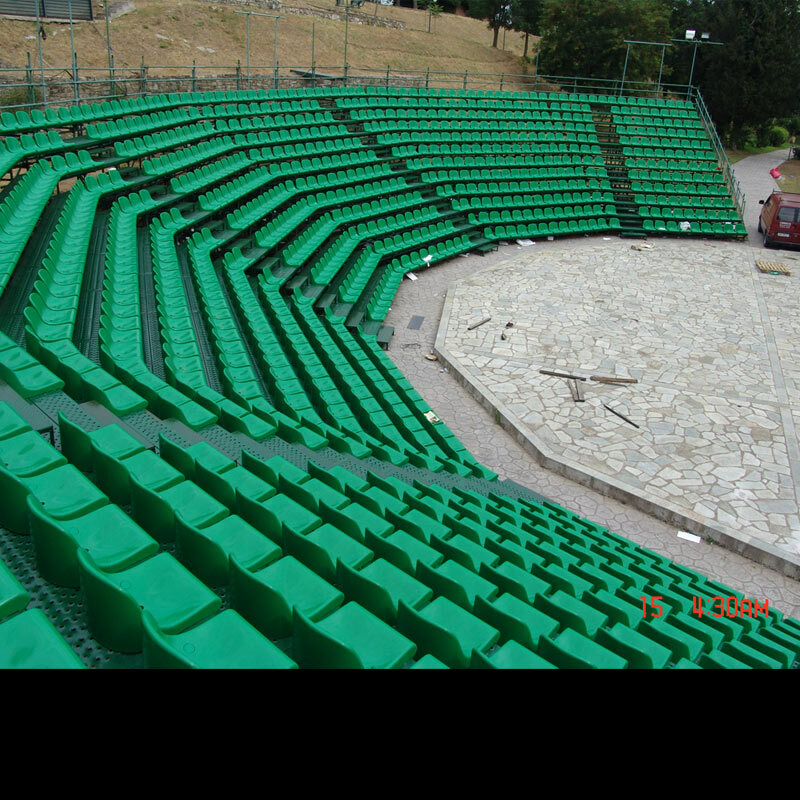 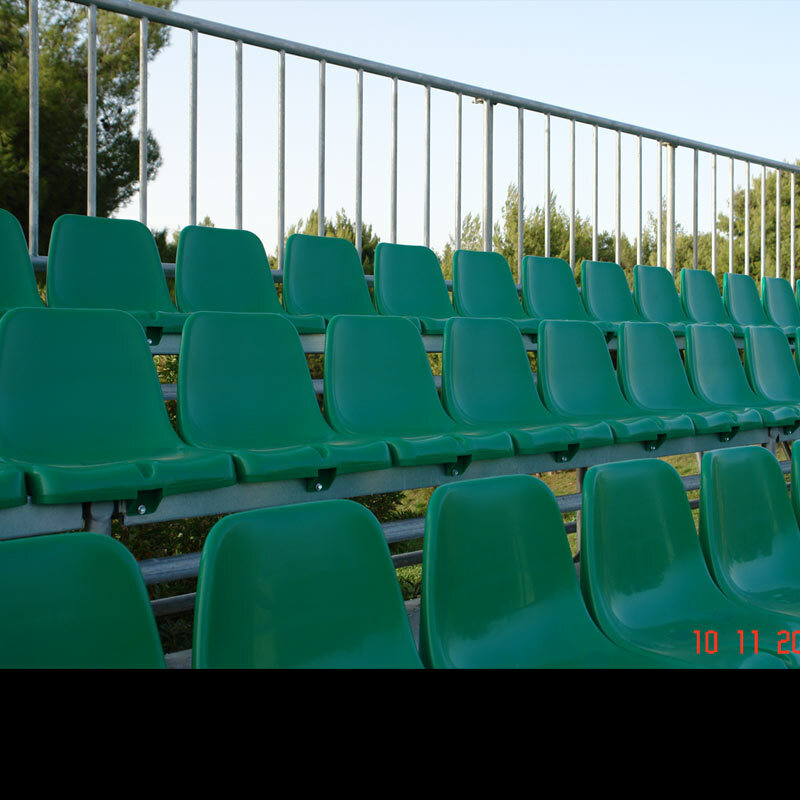 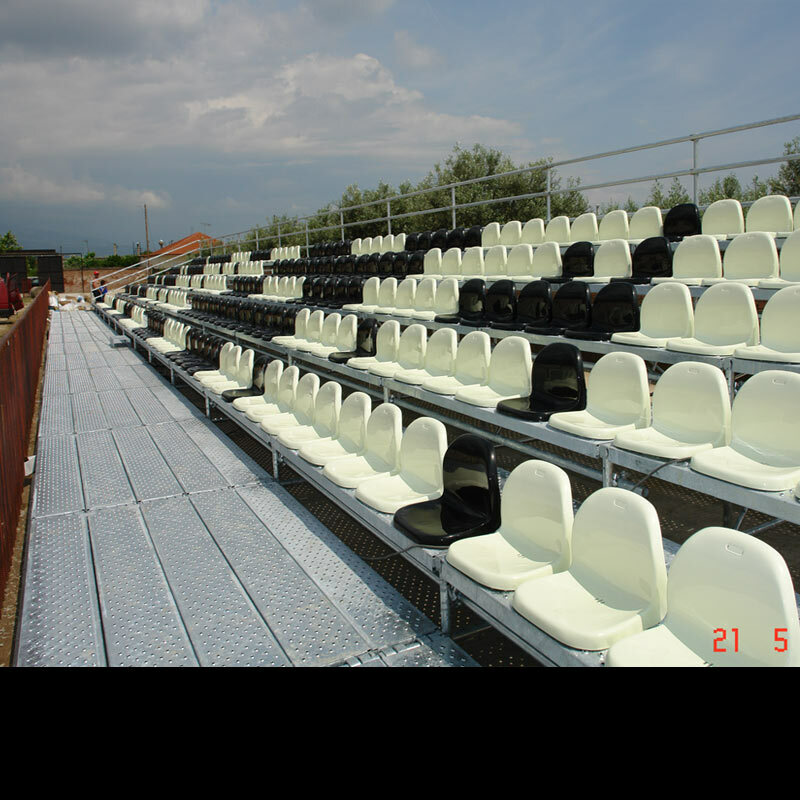 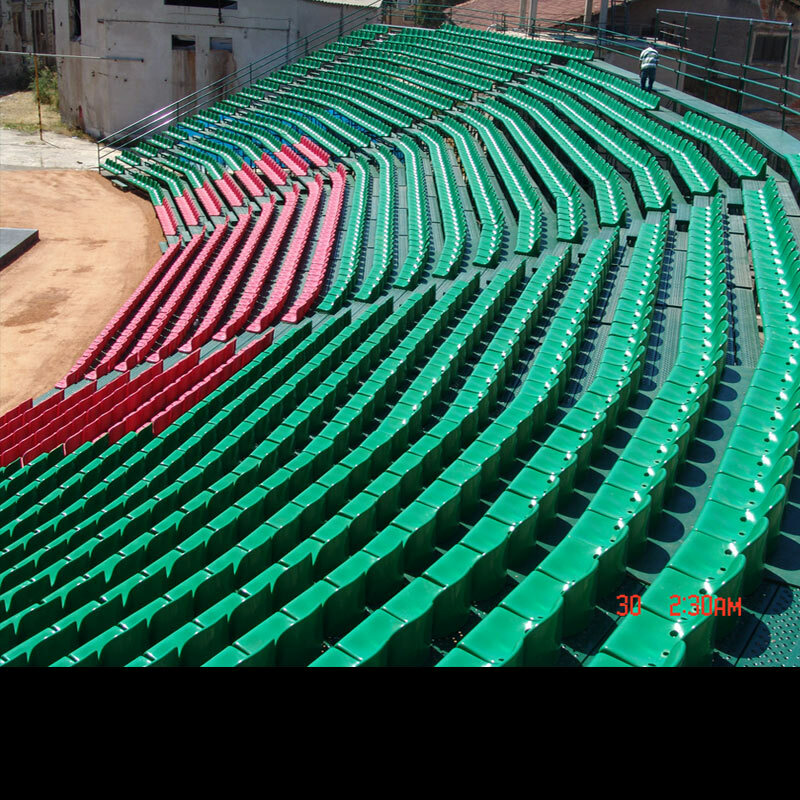 PROJECT: Placement of three metallic tribunes with plastic seats at the Aitoloakarnania County. 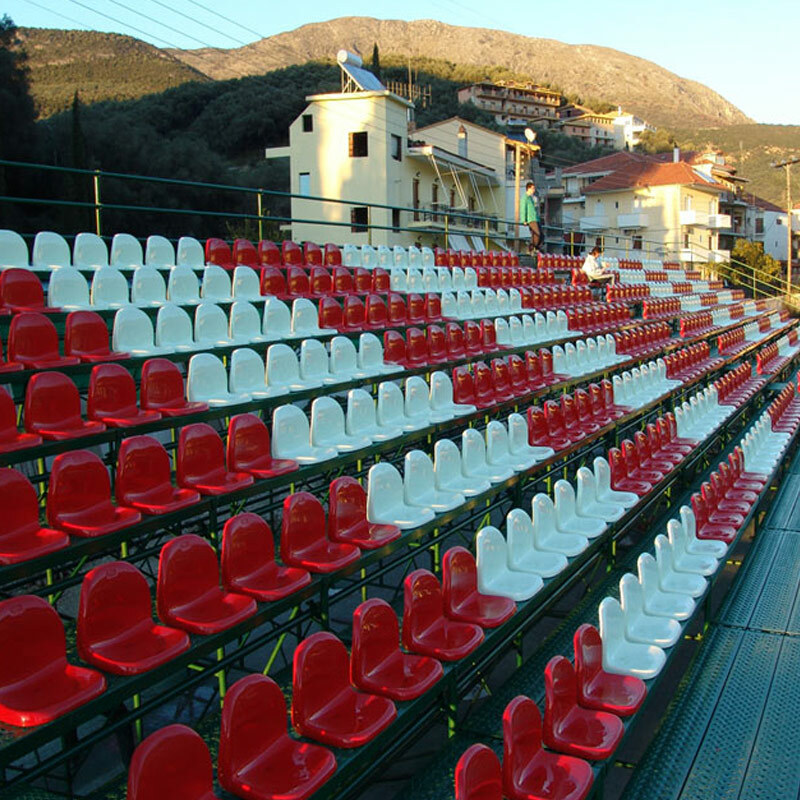 Specifically in the villages Panaitolio (white and red seats), Kainourio (white and black seats) and Paravola (yellow seats). 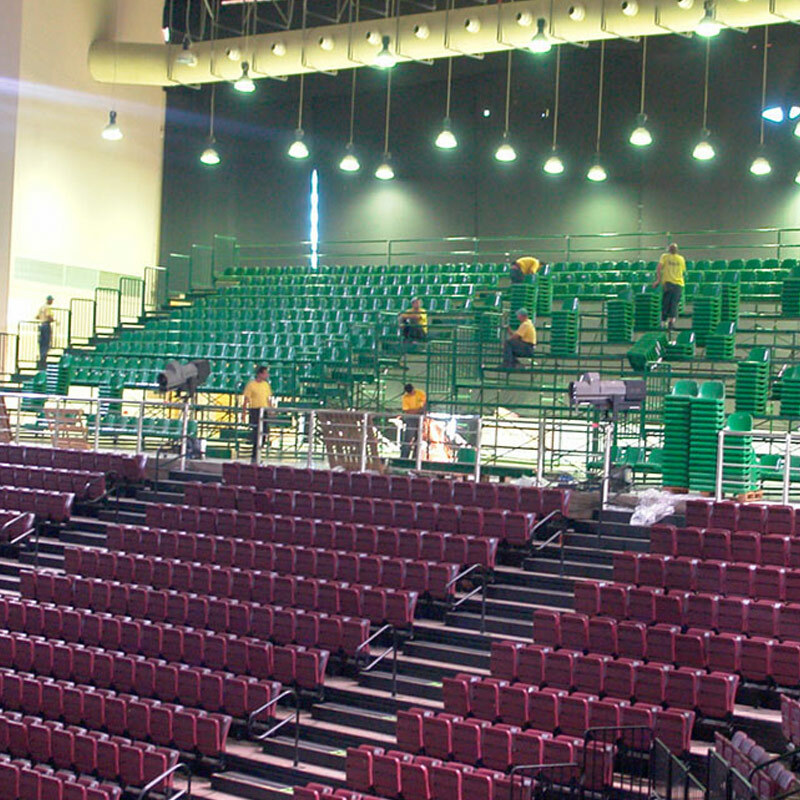 PROJECT: Settling, hiring and disassembling of a metallic tribune with plastic seats for the NIKE exhibition game dedicated to Kobe Bryant of the Los Angeles Lakers. 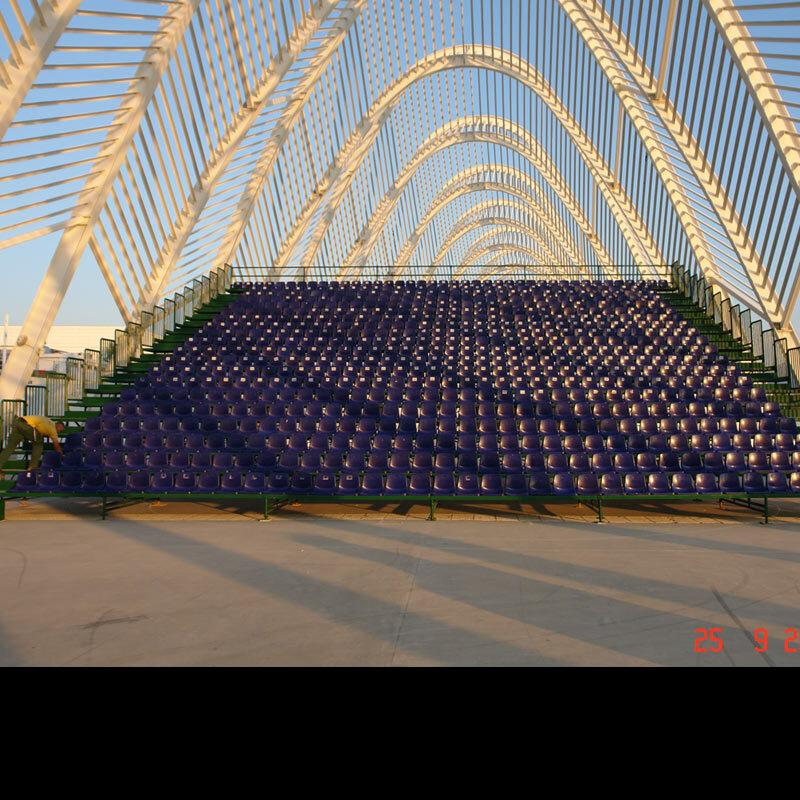 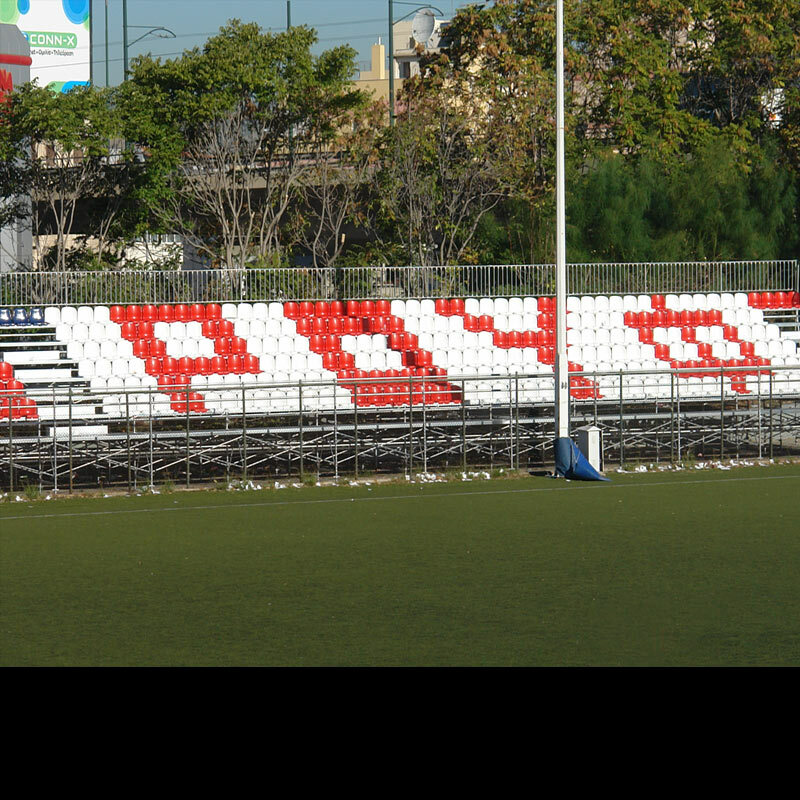 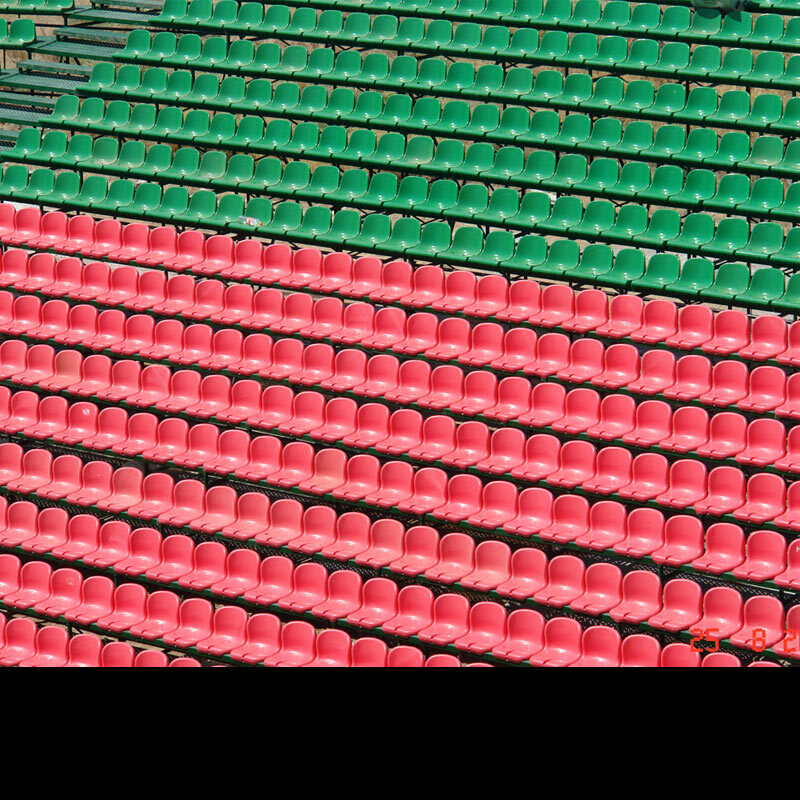 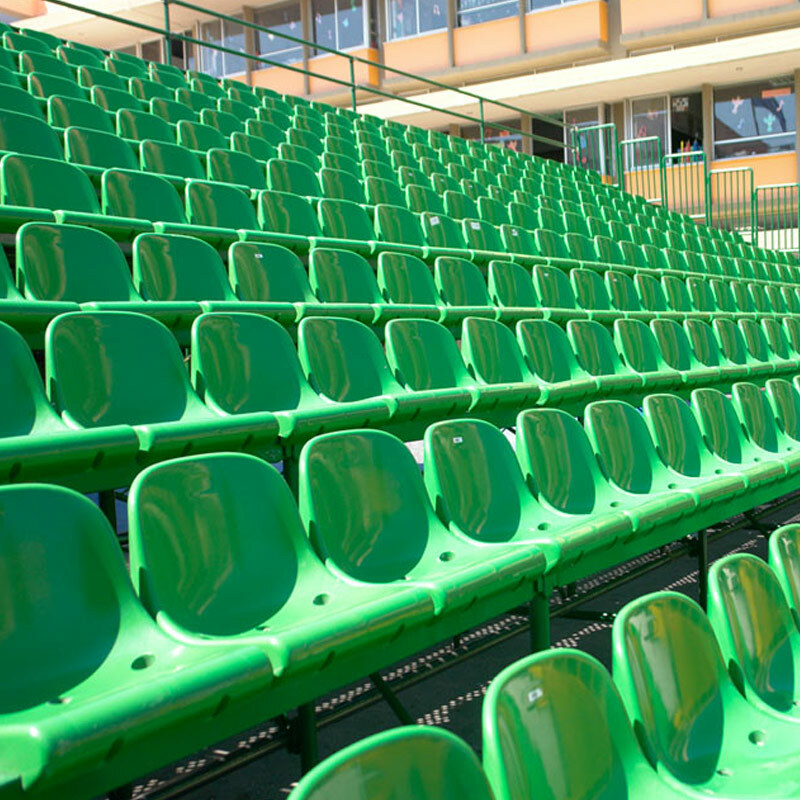 PROJECT: Placement of a metallic tribune with plastic seats at the PAO ROYF Stadium. 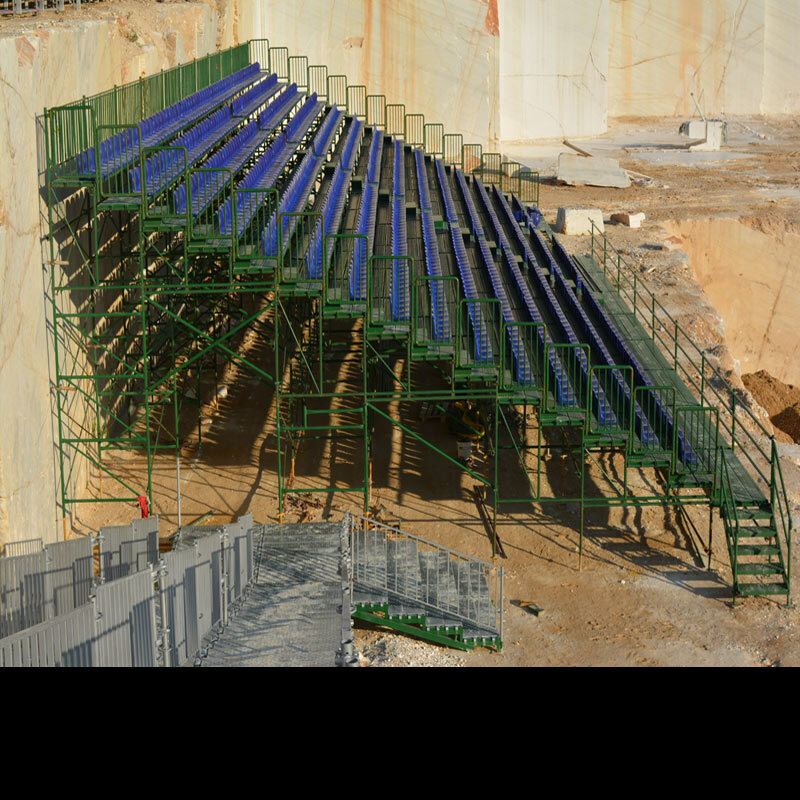 PROJECT: Settling, hiring and disassembling of a metallic tribune at the Parga Stadium. 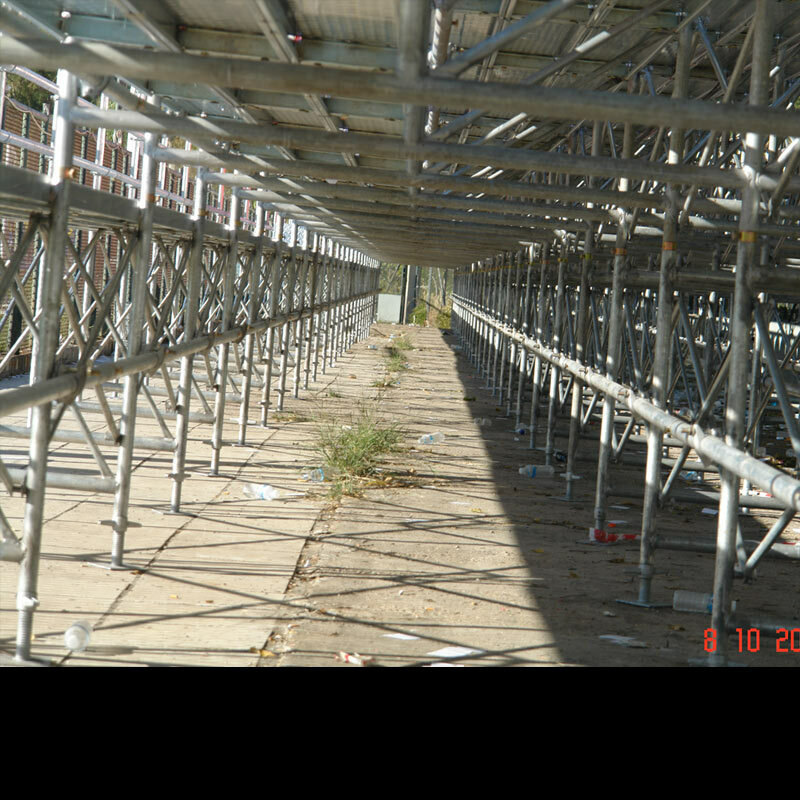 The tribune was initially painted but later was galvanized for better consistency against time. 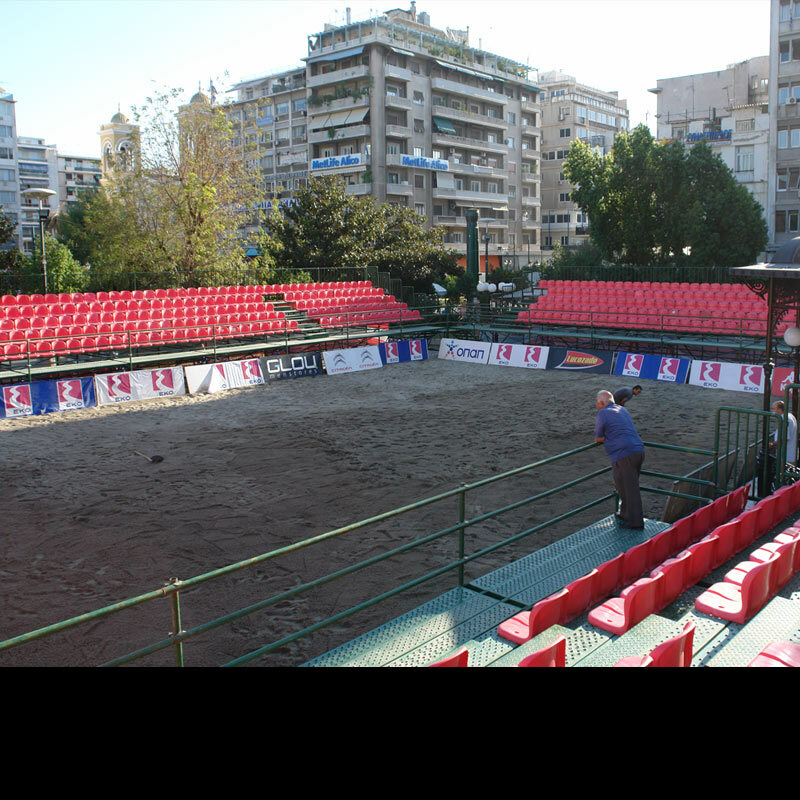 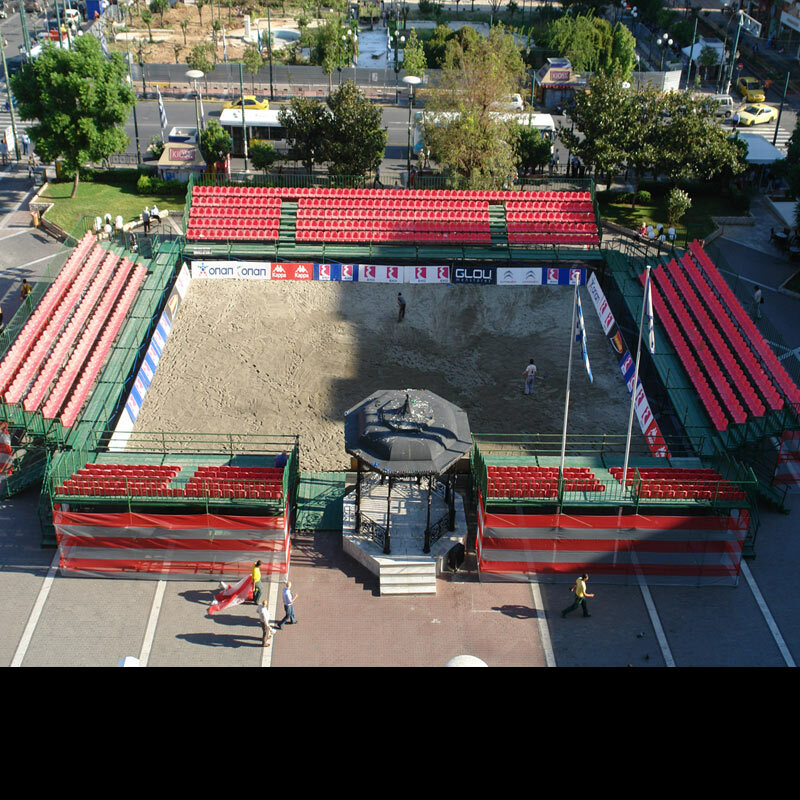 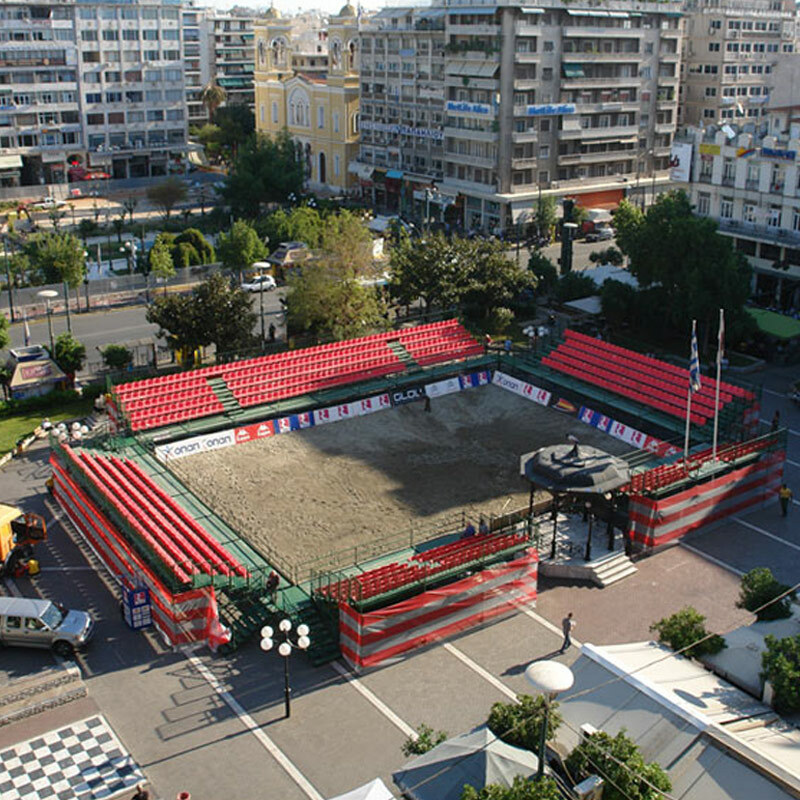 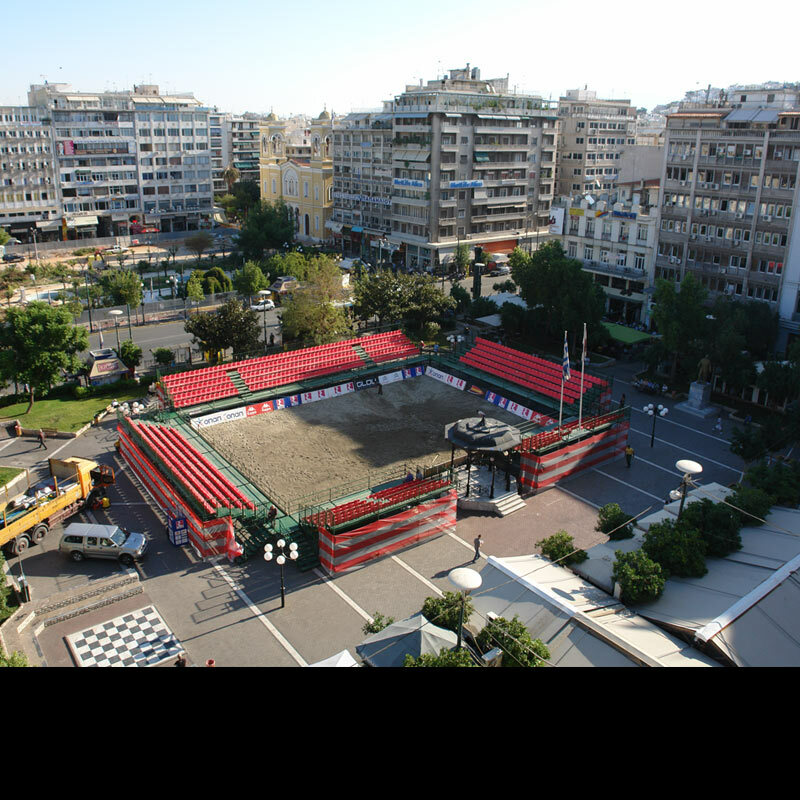 PROJECT: Settling, hiring and disassembling of metallic tribunes for the exhibition game dedicated to the former Ace of Olympiacos, Giovanni Silva De Oliveira in the Square in front of the Piraeus City Hall. 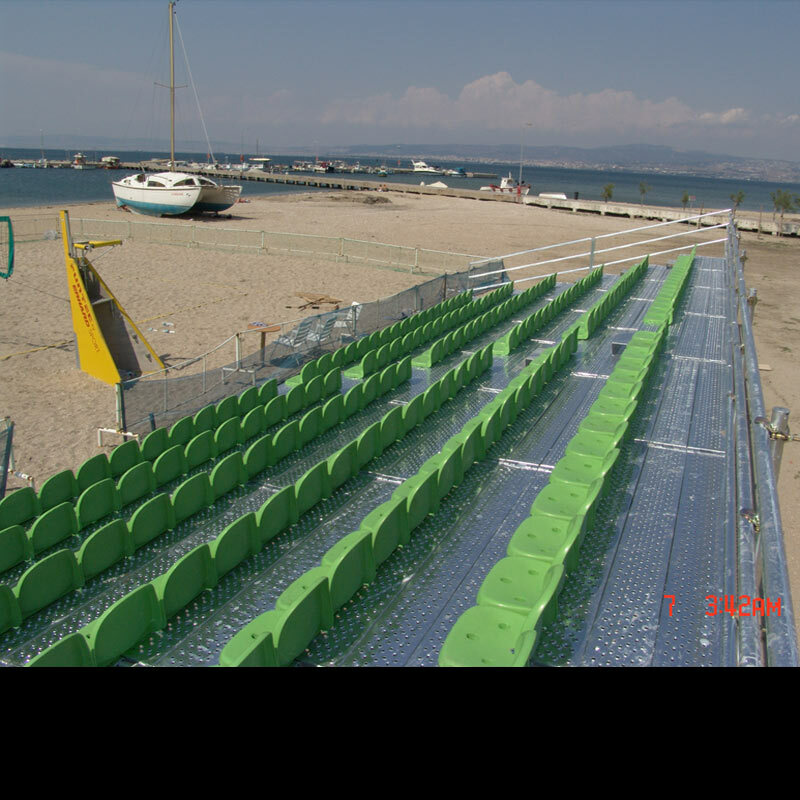 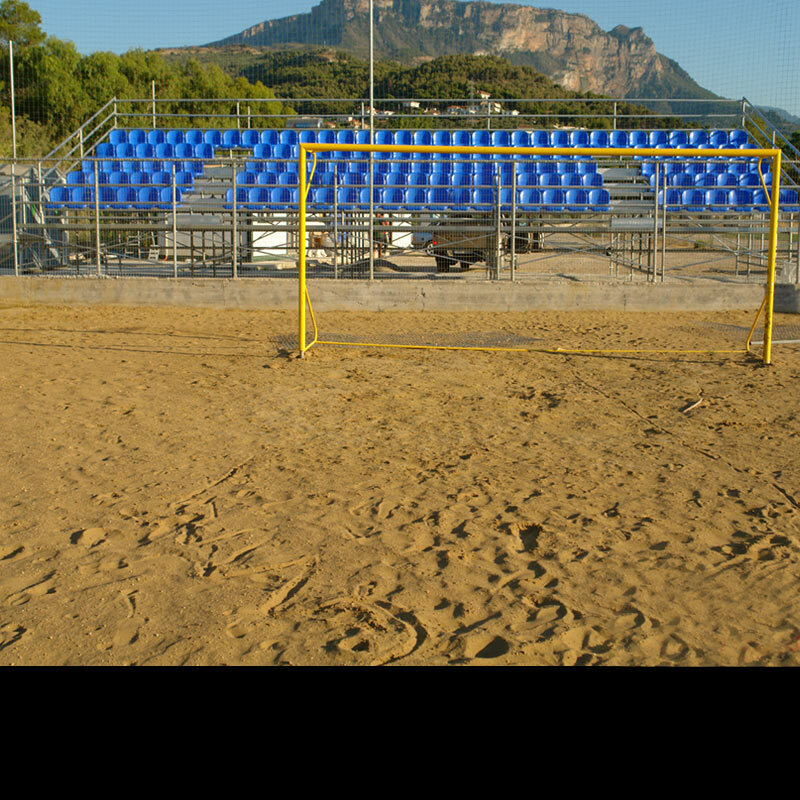 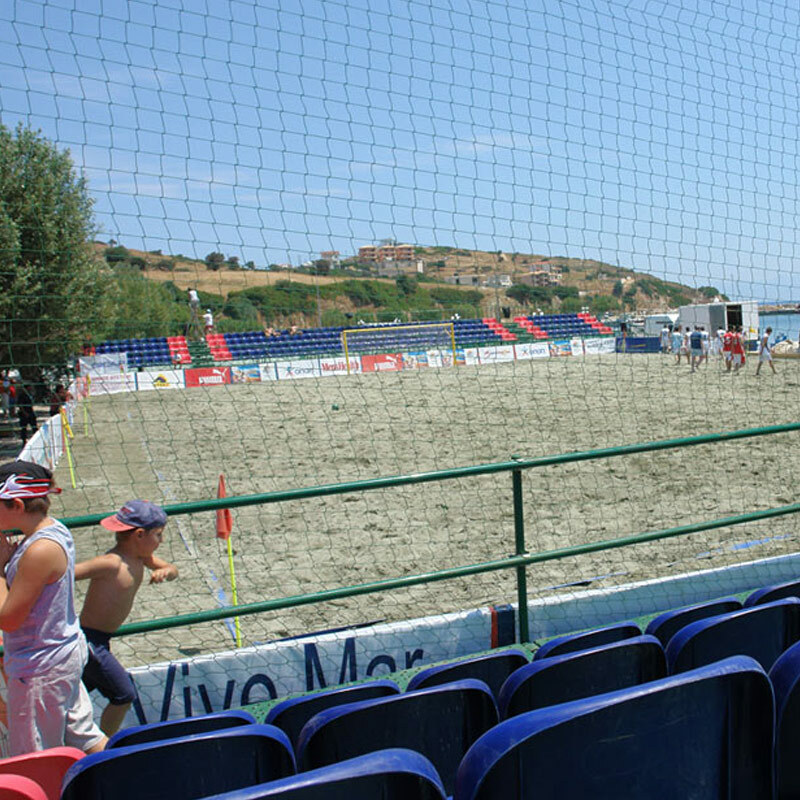 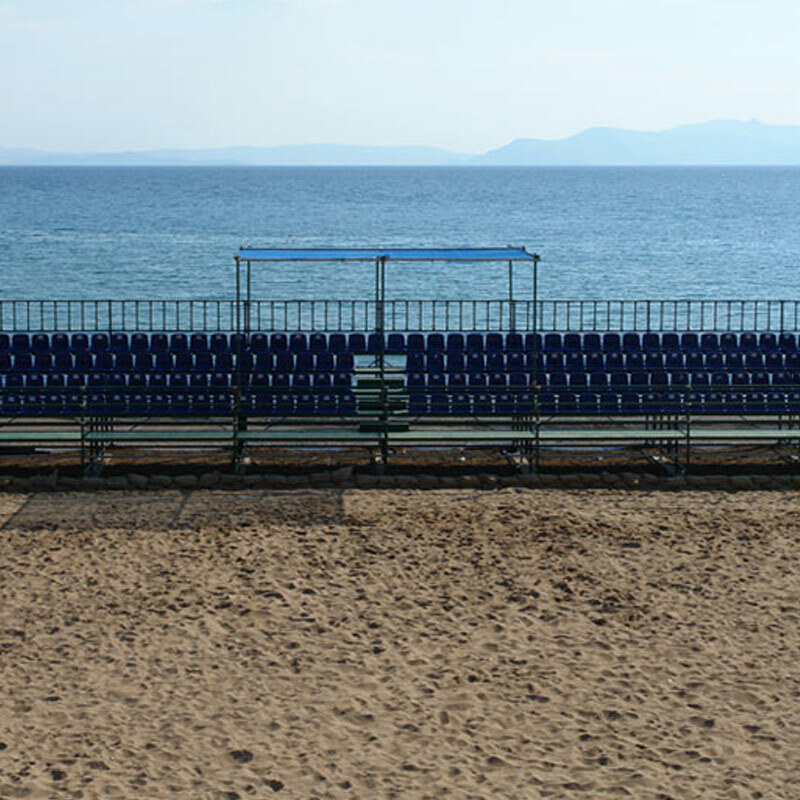 PROJECT: Settling, hiring and disassembling of a metallic tribune with plastic seats for Beach Soccer matches at Petries beach in Evoia. 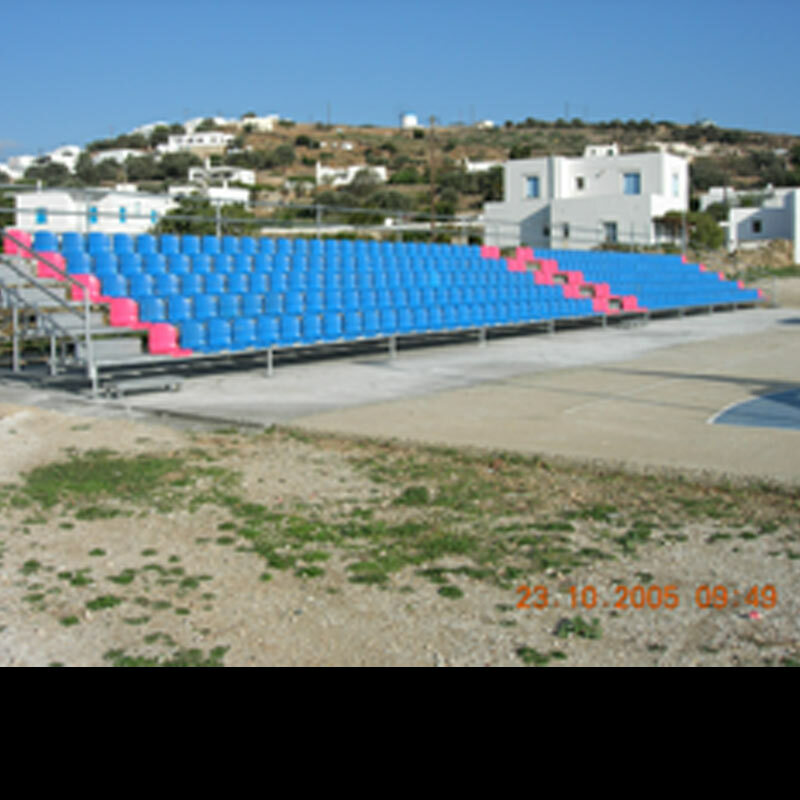 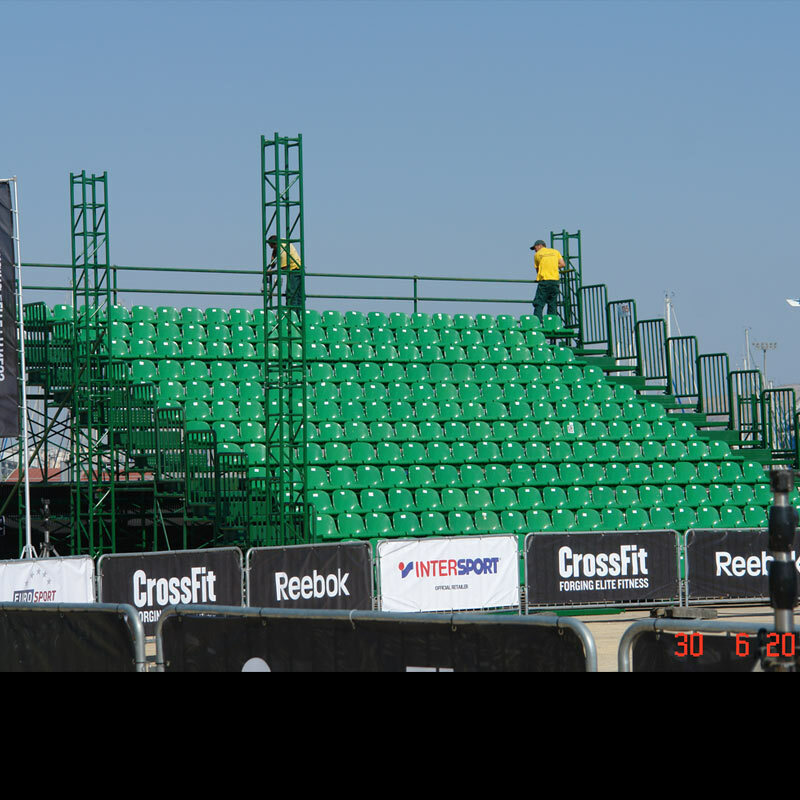 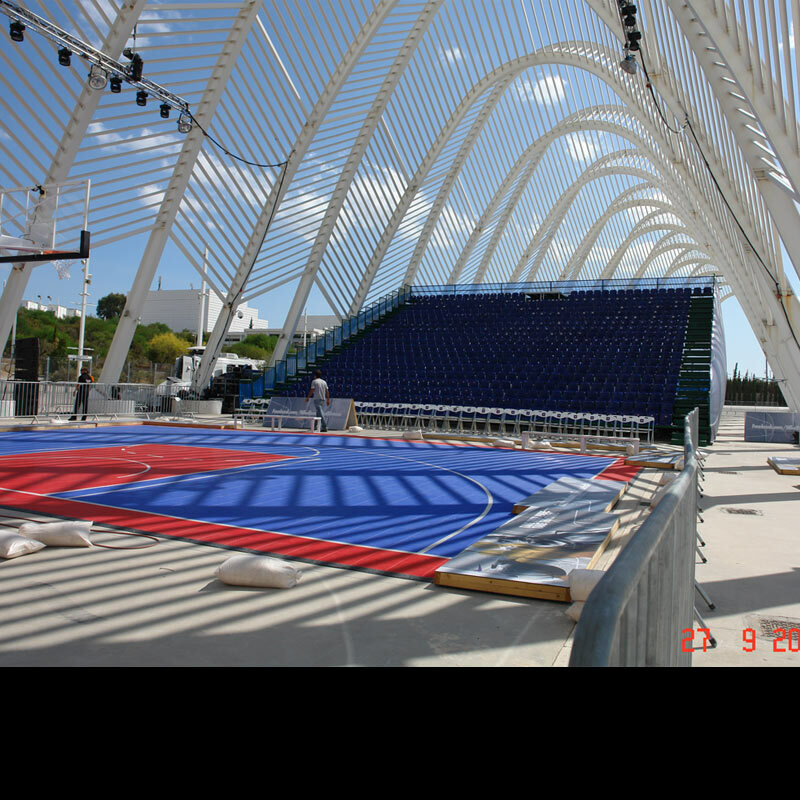 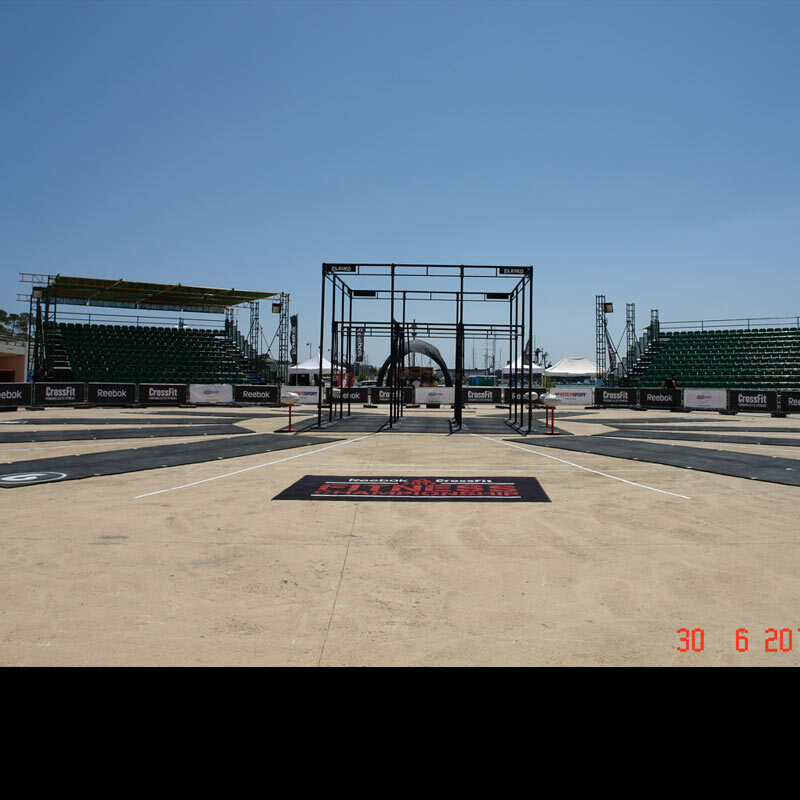 PROJECT: Settling, hiring and disassembling of two metallic tribunes with plastic seats for Cross-Fit Games at Palaio Faliro. 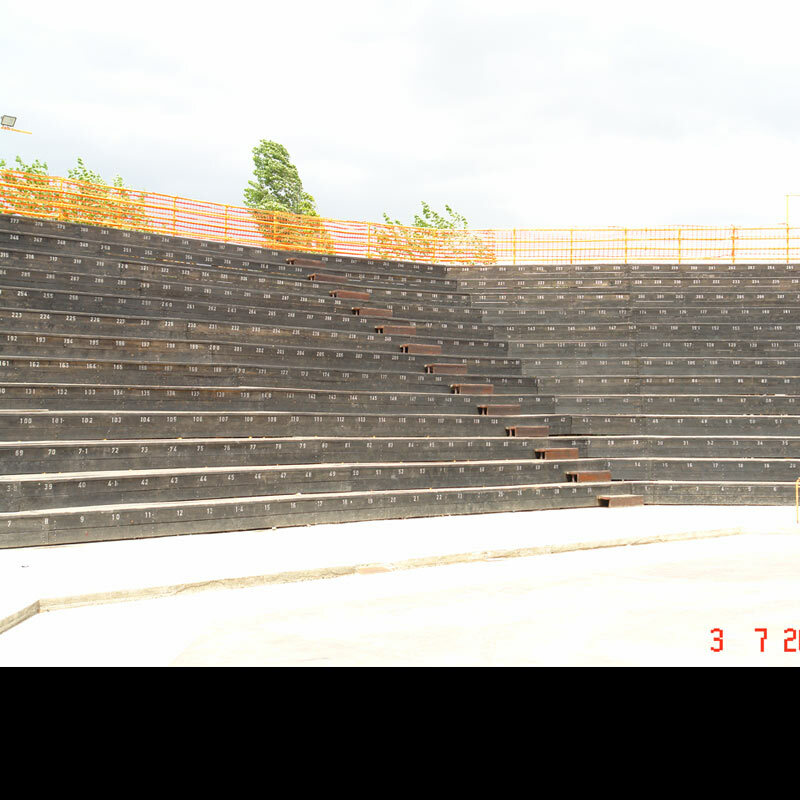 PROJECT: Placement of a metallic tribune with plastic seats at the Cultural Center of Halkidona. 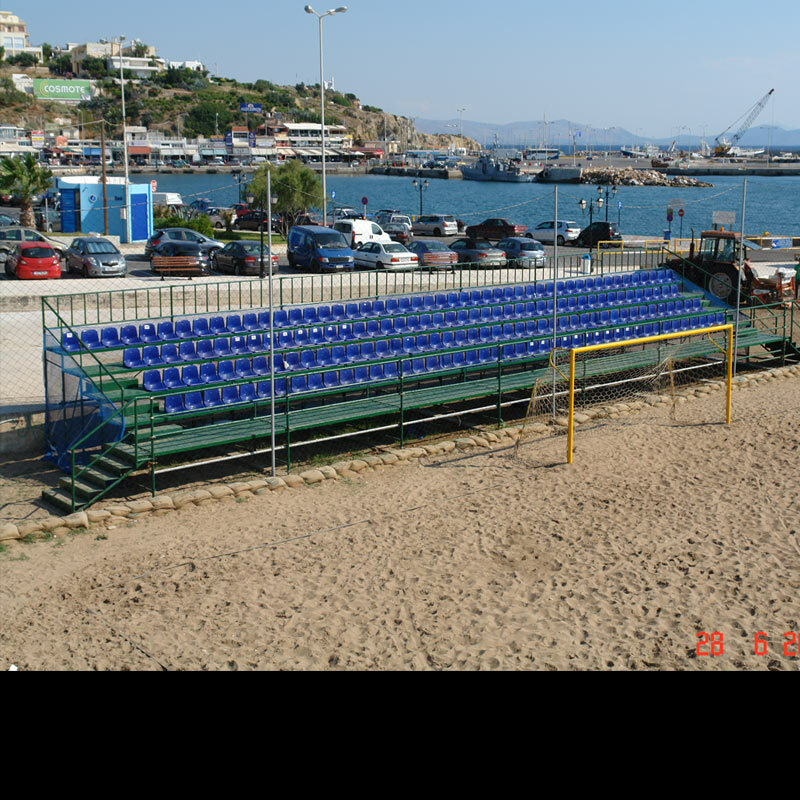 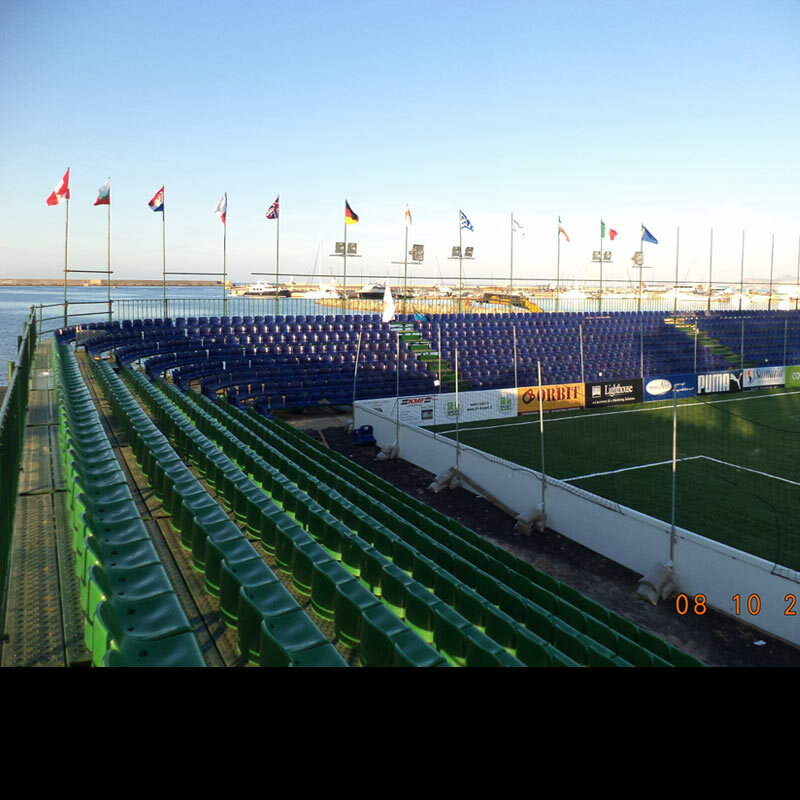 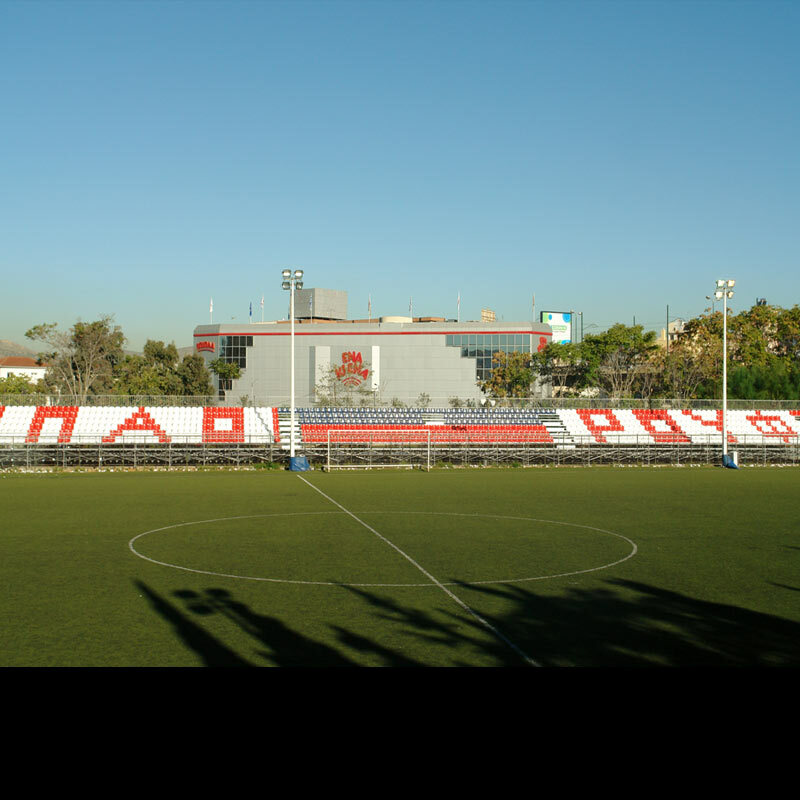 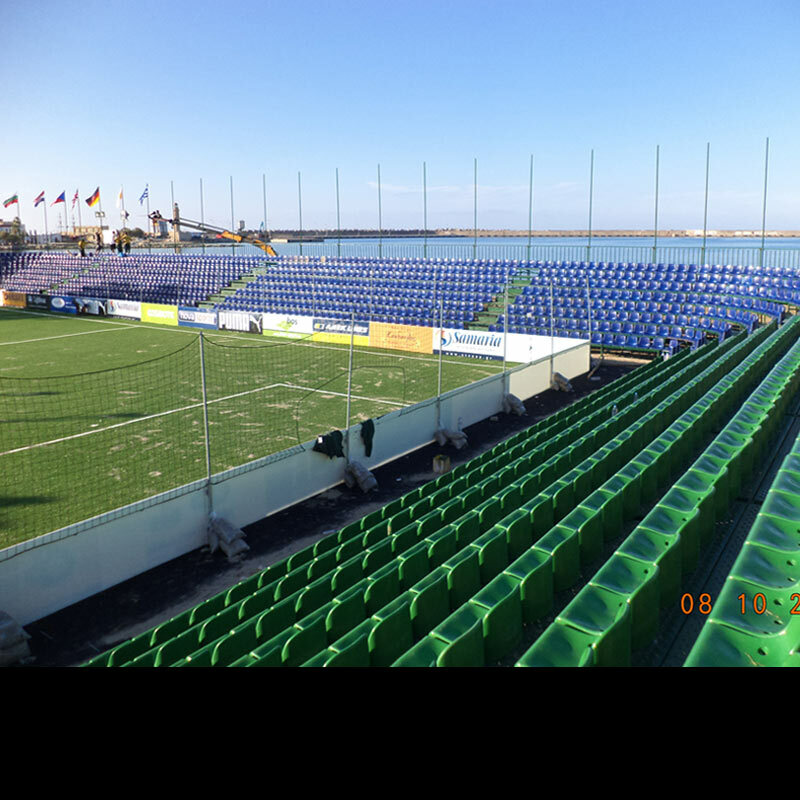 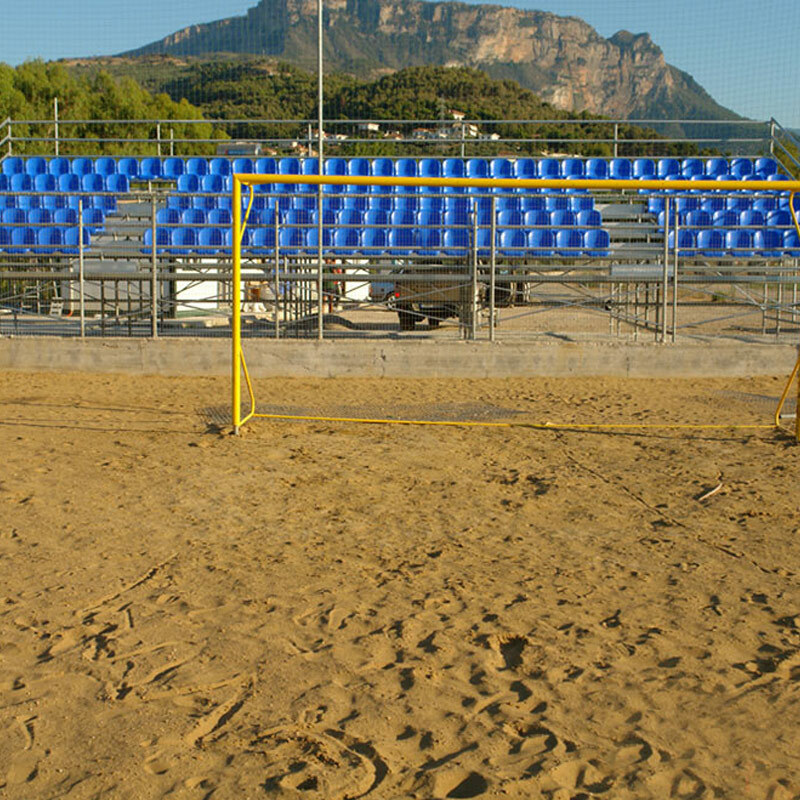 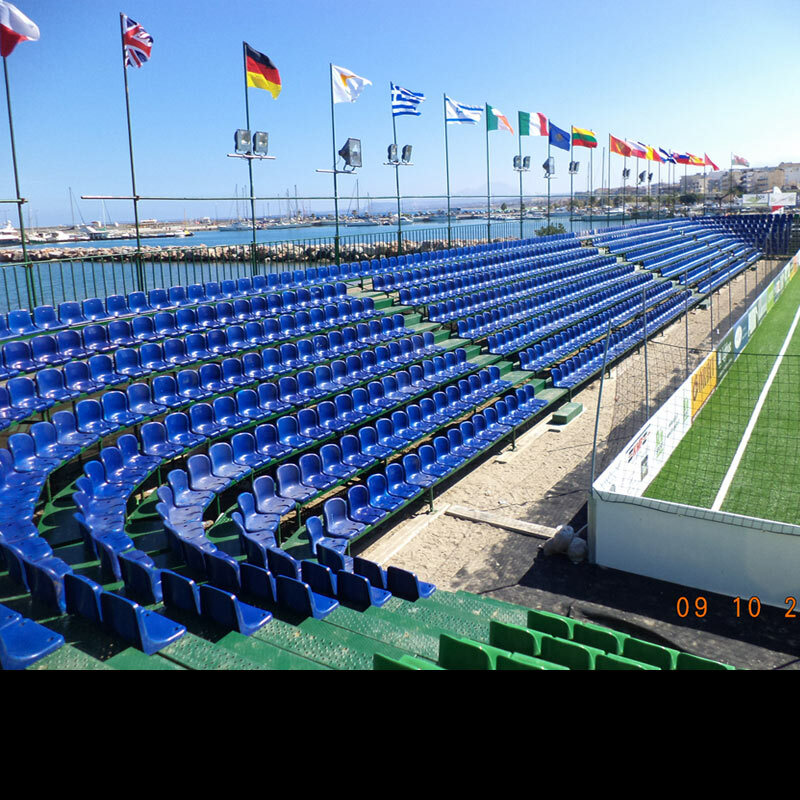 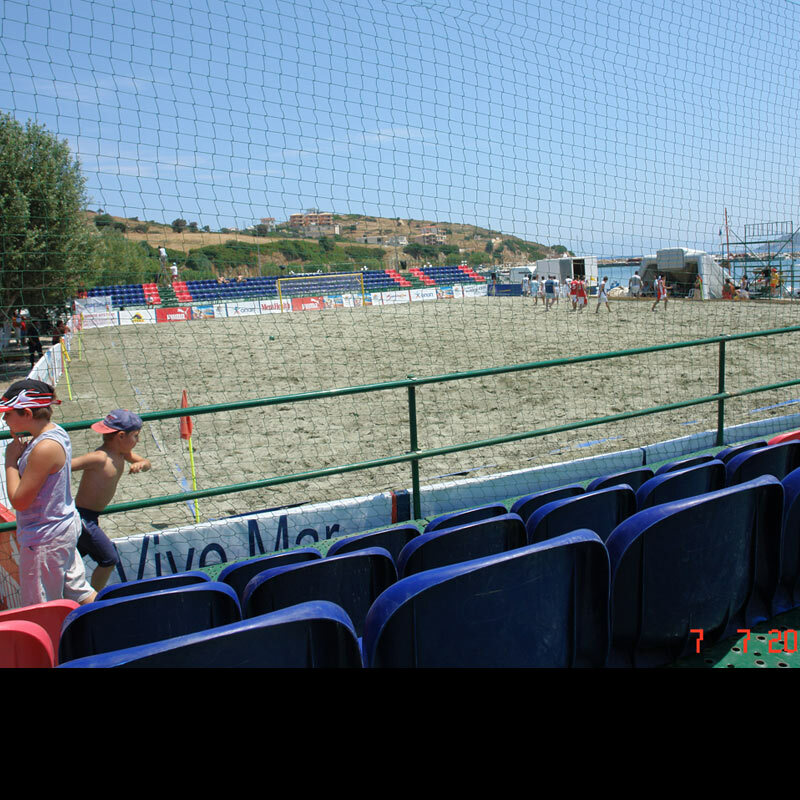 PROJECT: Settling, hiring and disassembling of three metallic tribunes with plastic seats for Beach Soccer matches next to the Rafina Port. 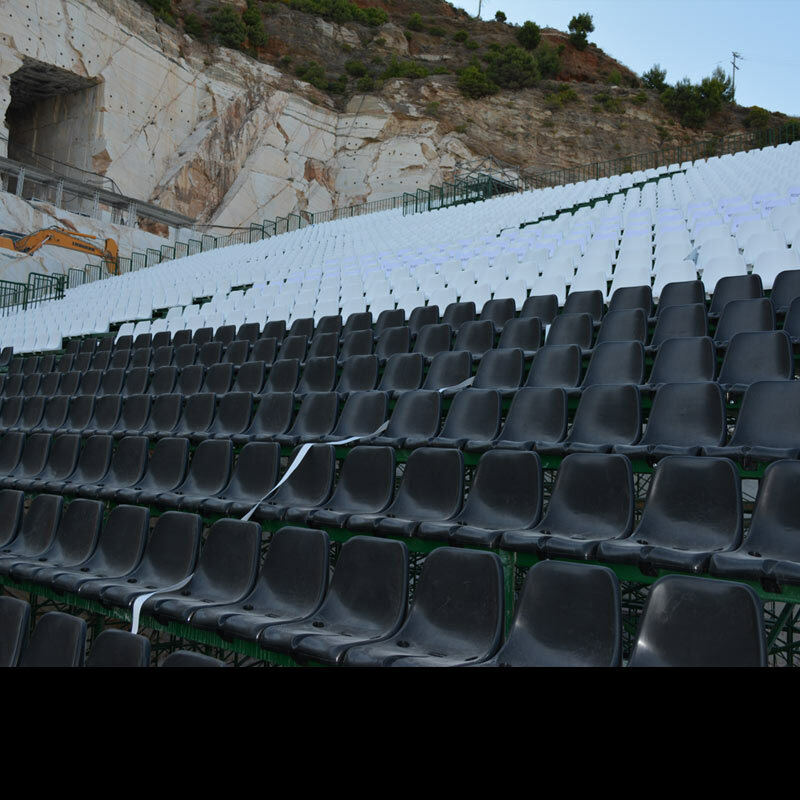 PROJECT: Placement of a metallic tribune with plastic seats at Sifnos Island. 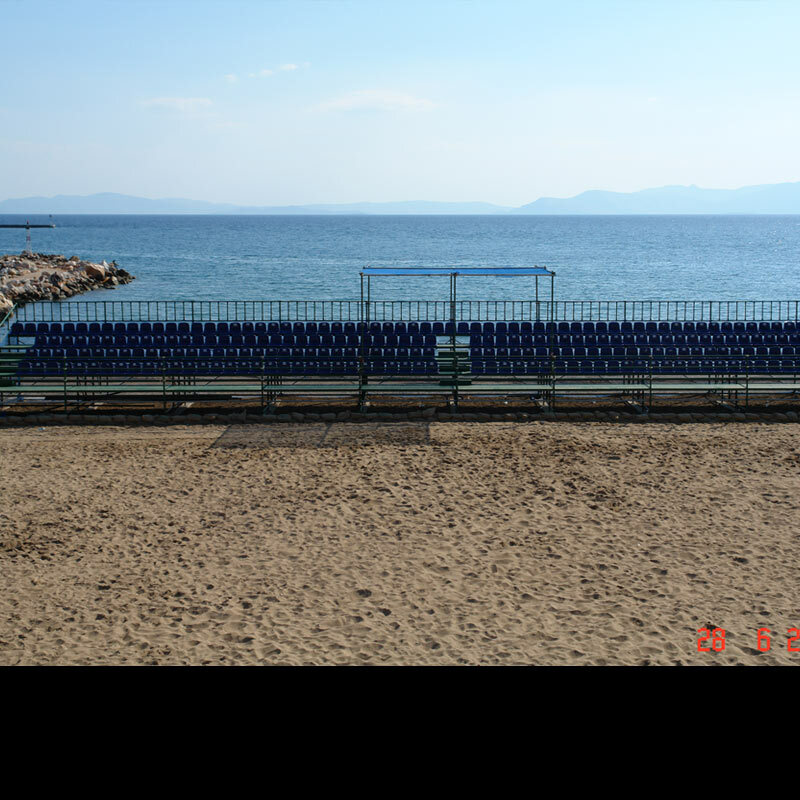 PROJECT: Placement of an amphitheatric metallic tribune with plastic seats at SITEIA BEACH HOTEL. 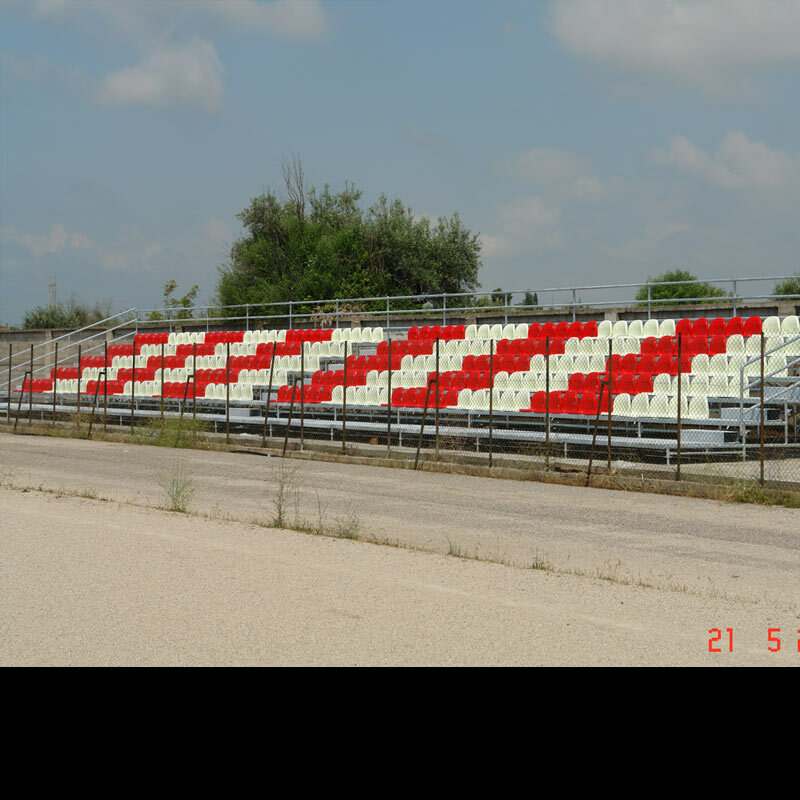 PROJECT: Settling, hiring and disassembling of two metallic tribunes with plastic seats at the Hellenic Air Force Academy. 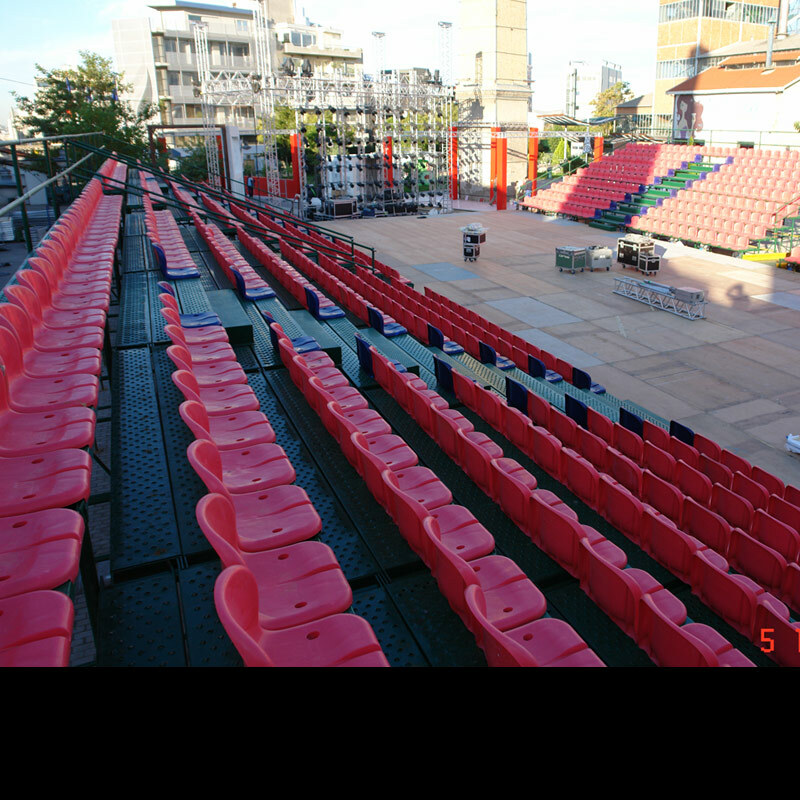 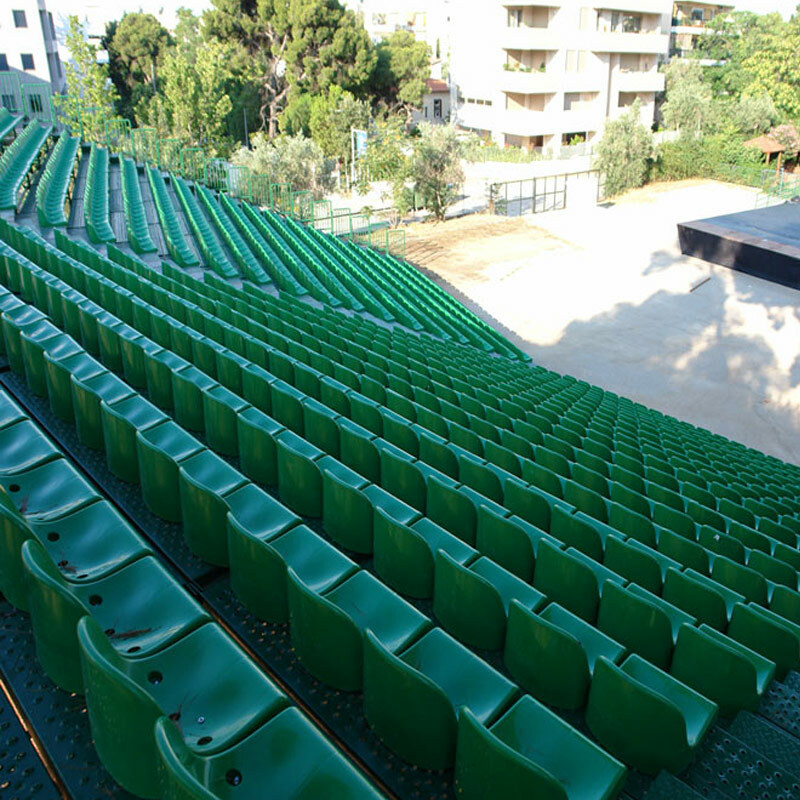 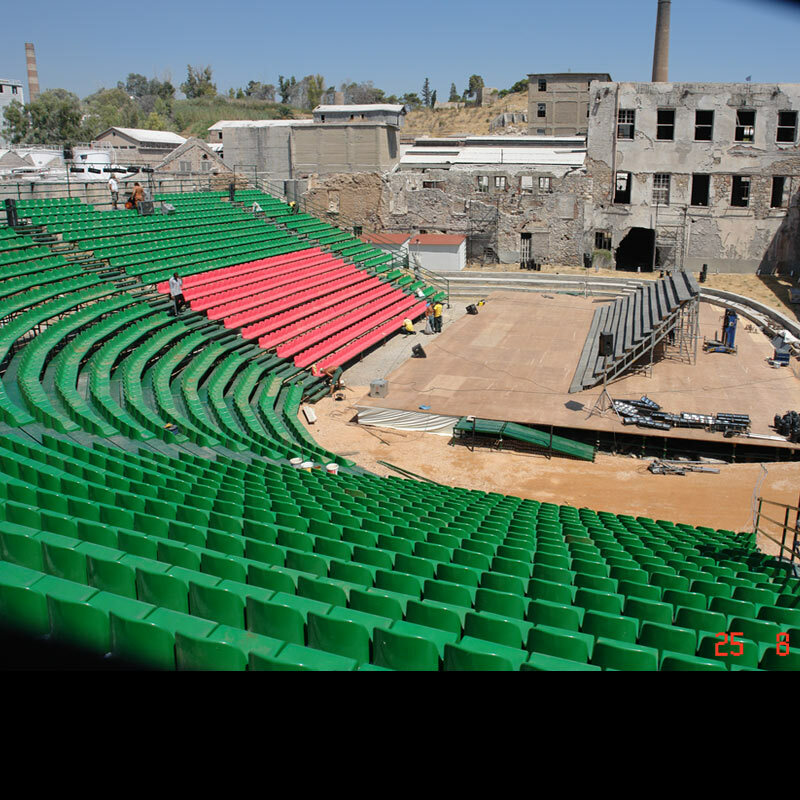 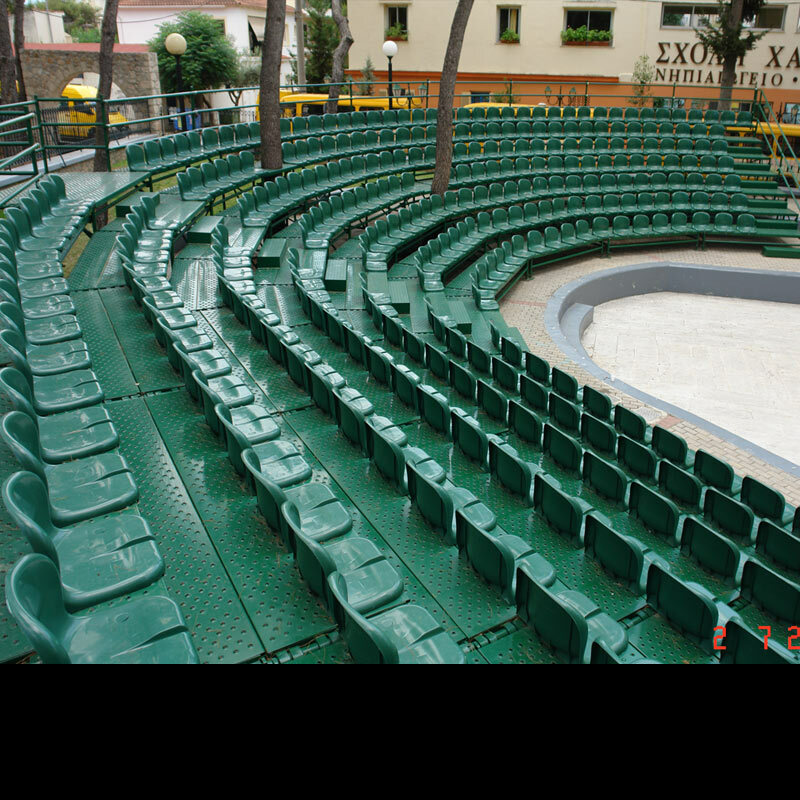 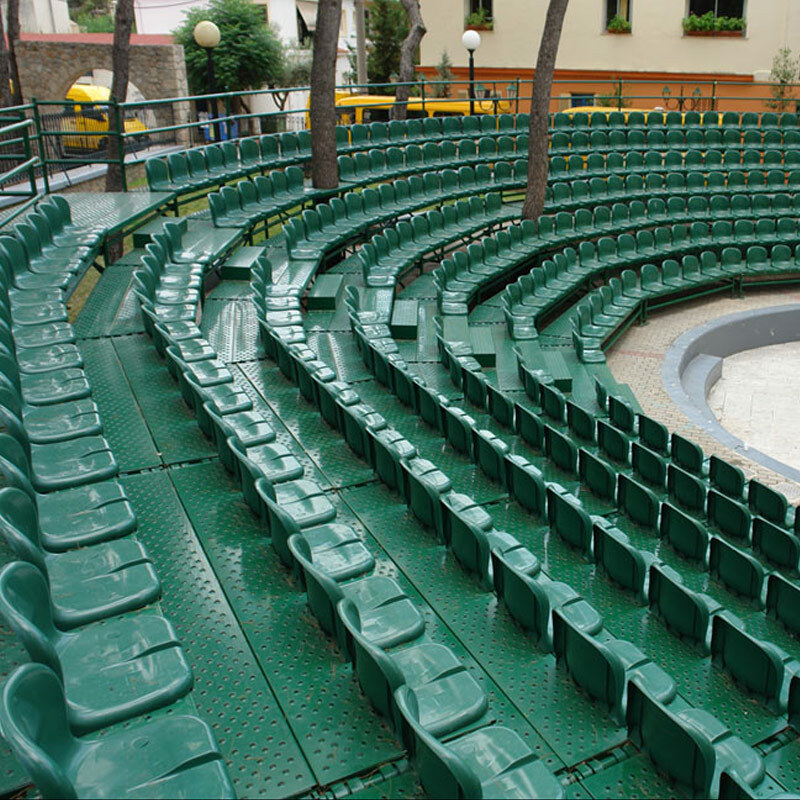 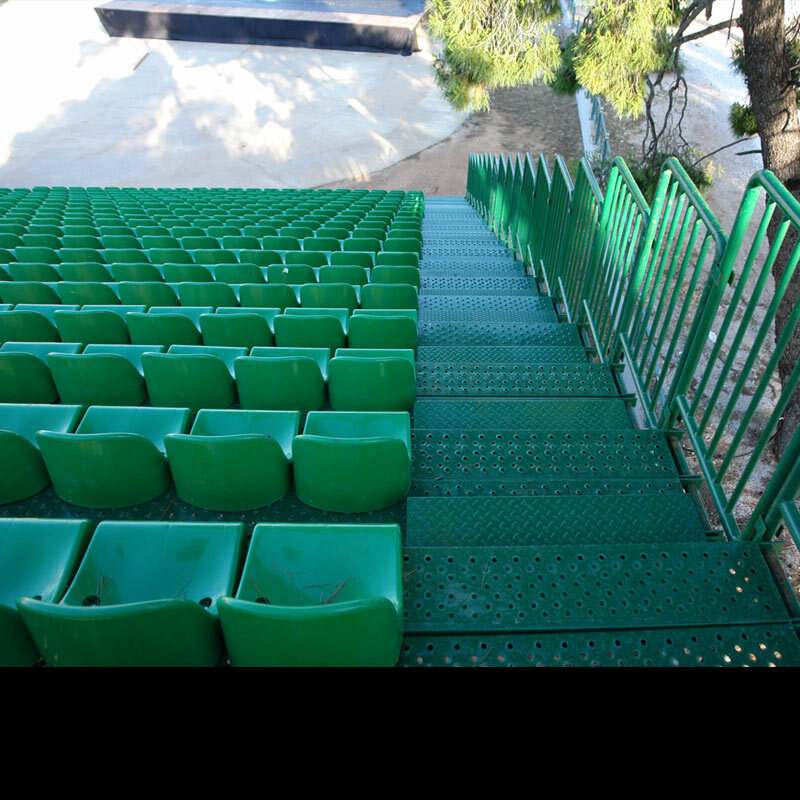 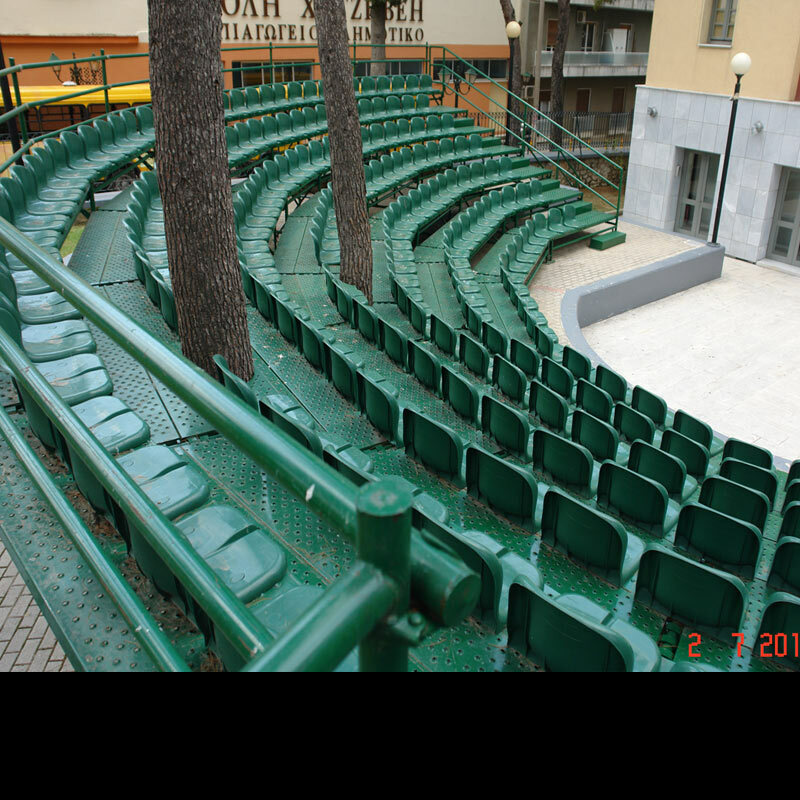 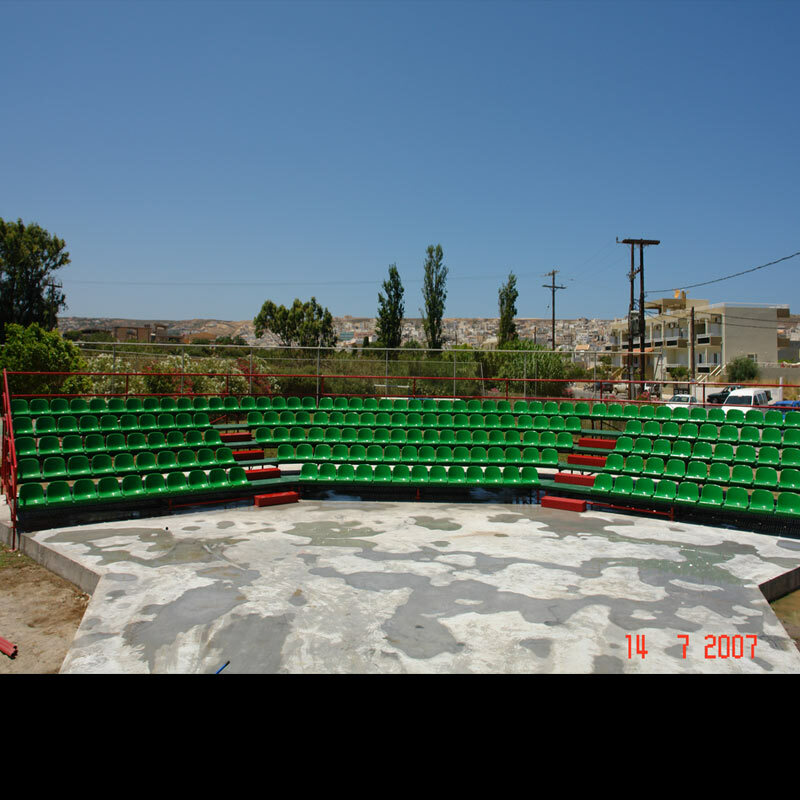 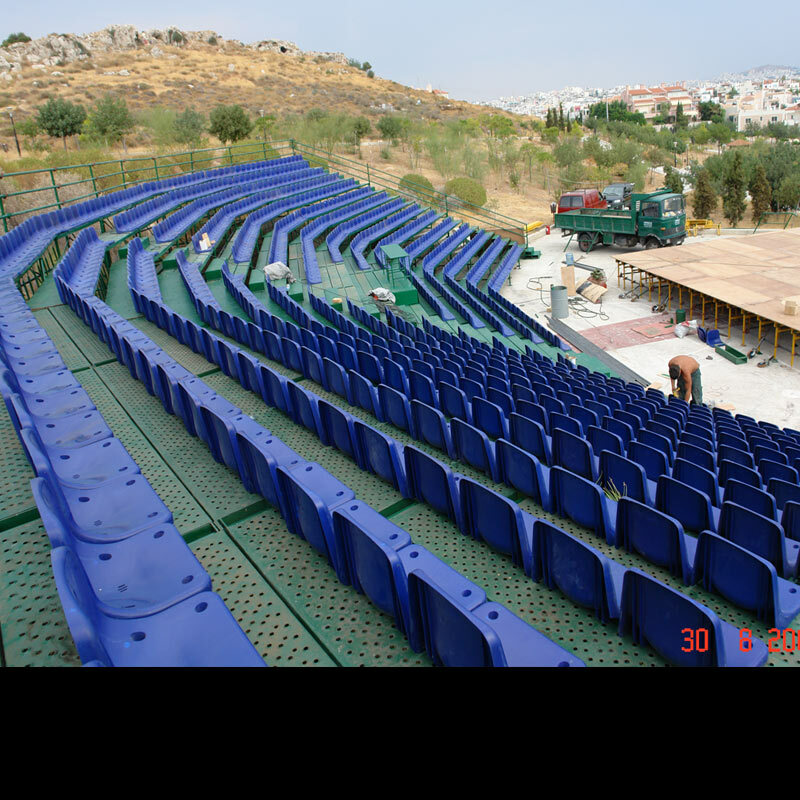 PROJECT: Placement of plastic seats at the Kintis Theatre at Ilioupoli. 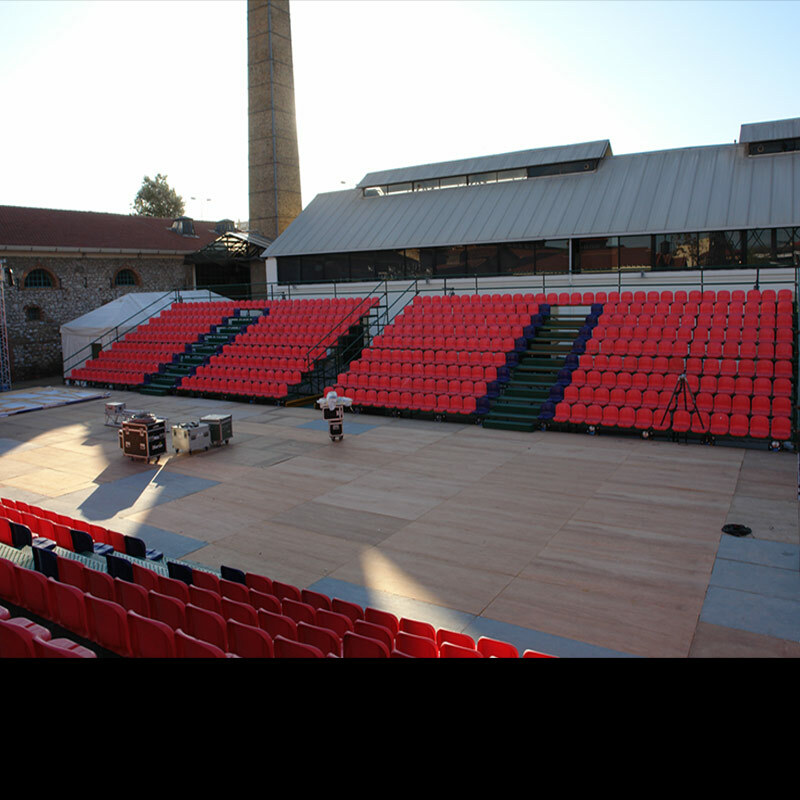 PROJECT: Reinforcement of the body of an already existing metallic tribune at the Trikala Theatre. 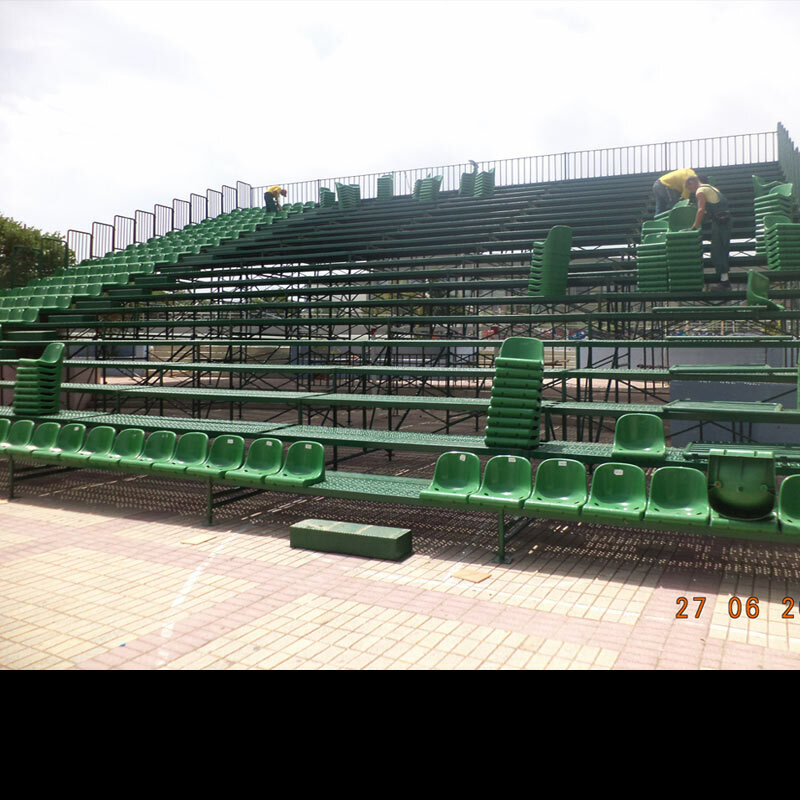 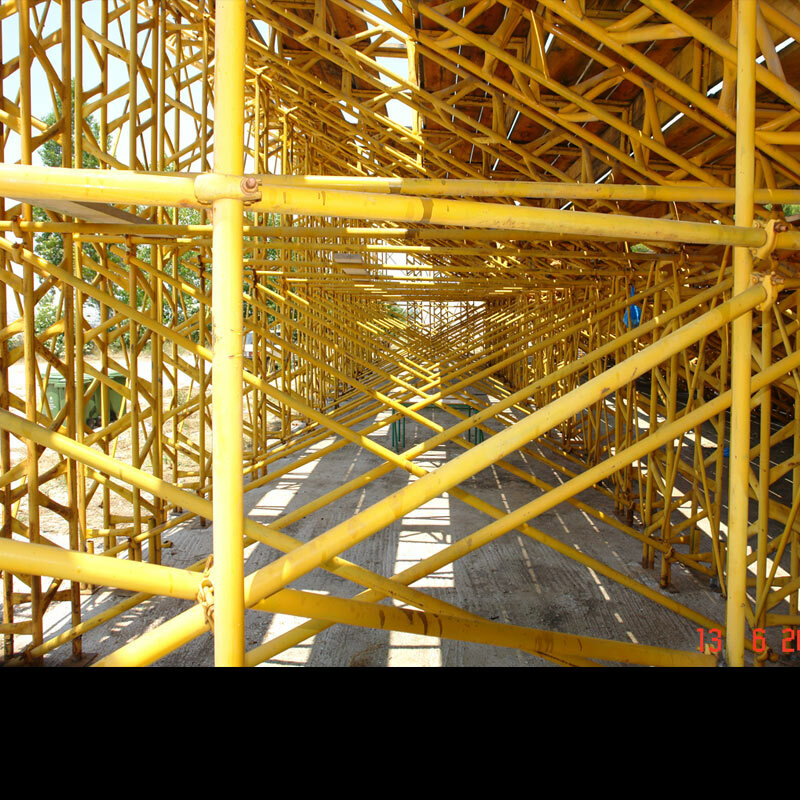 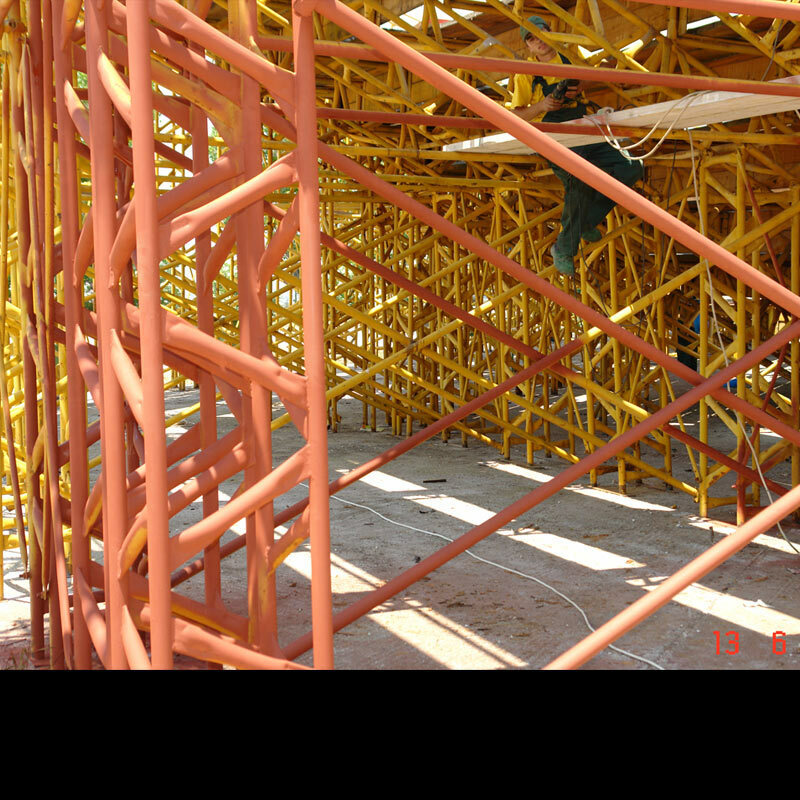 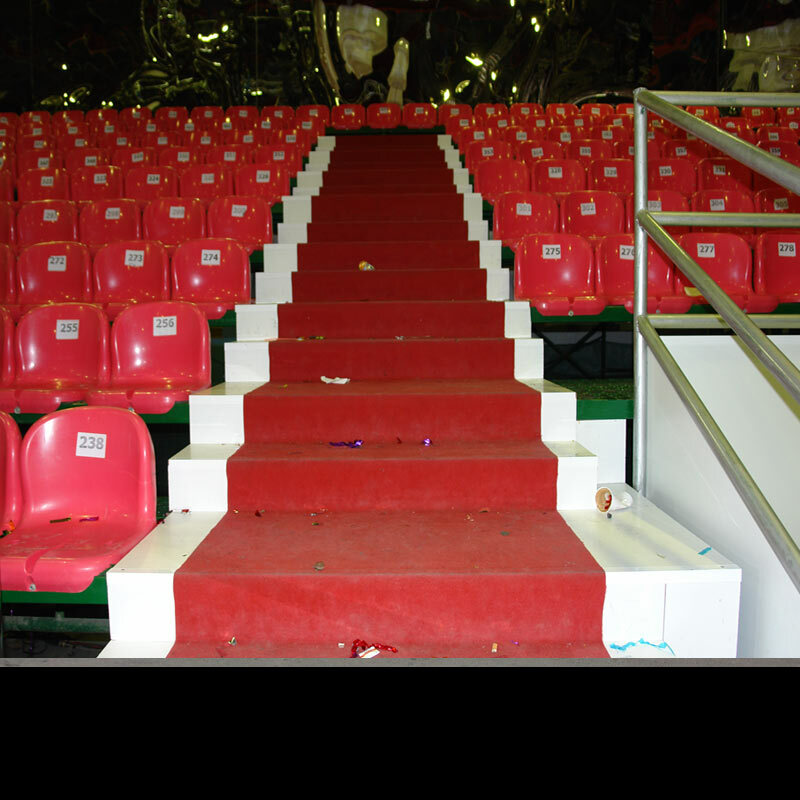 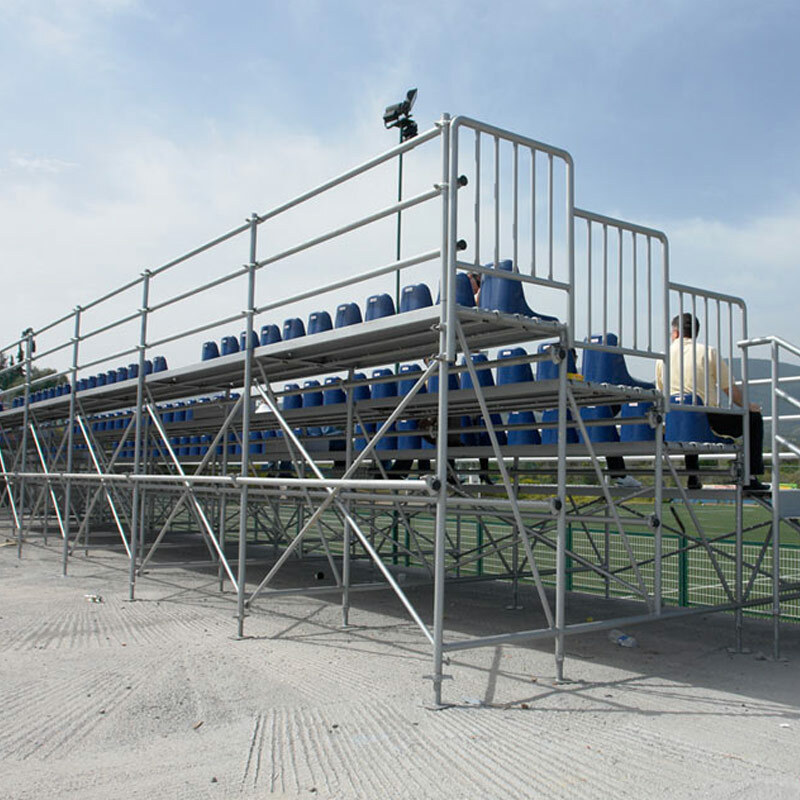 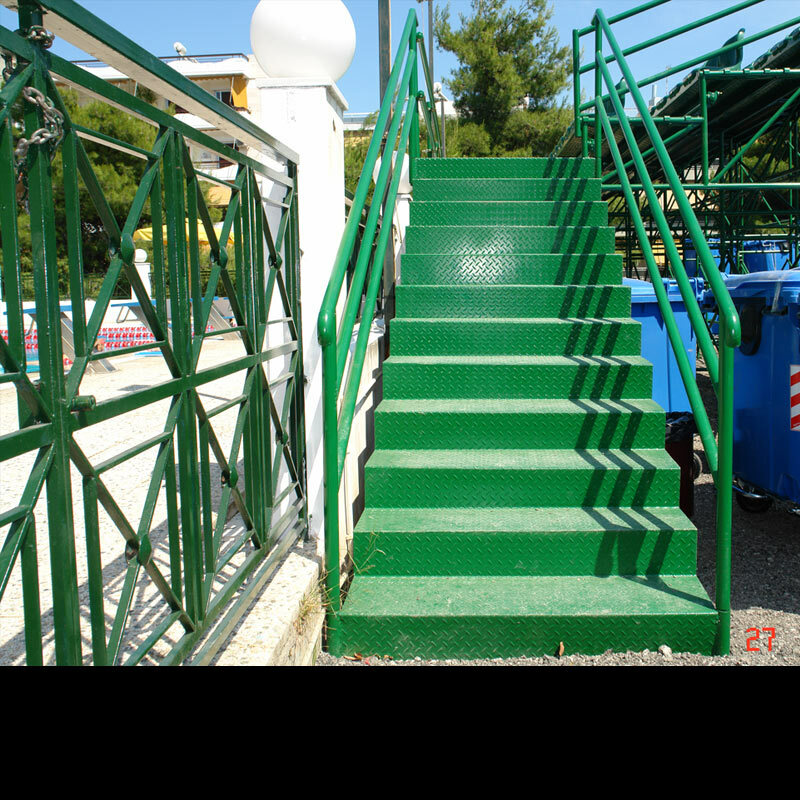 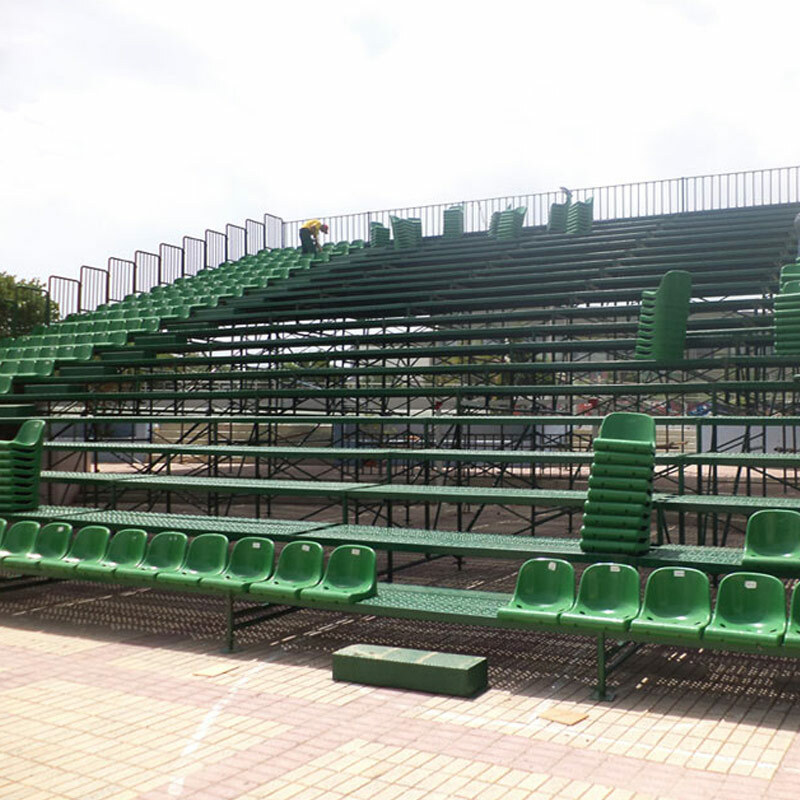 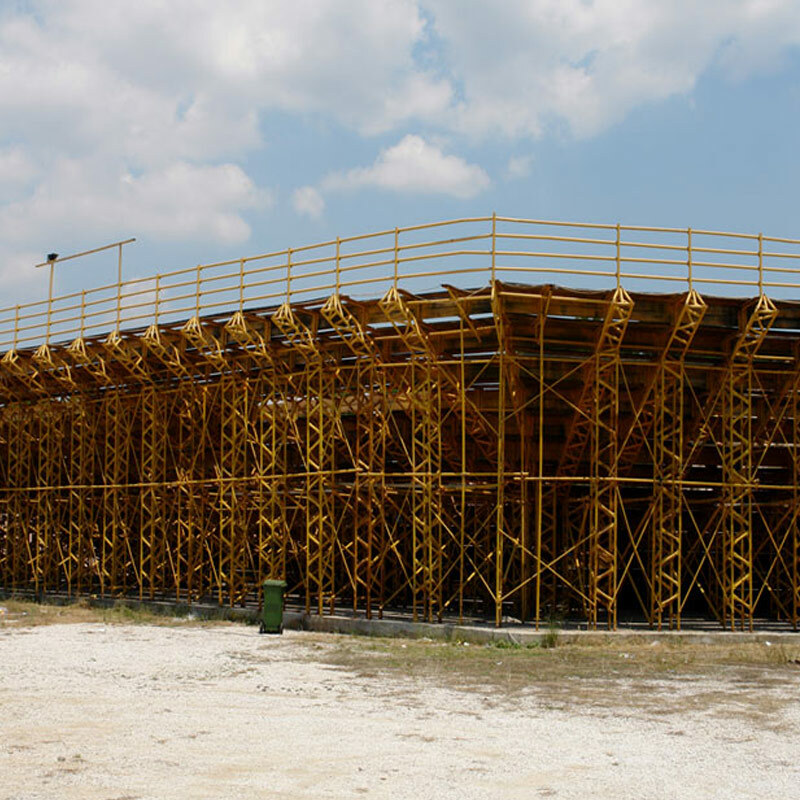 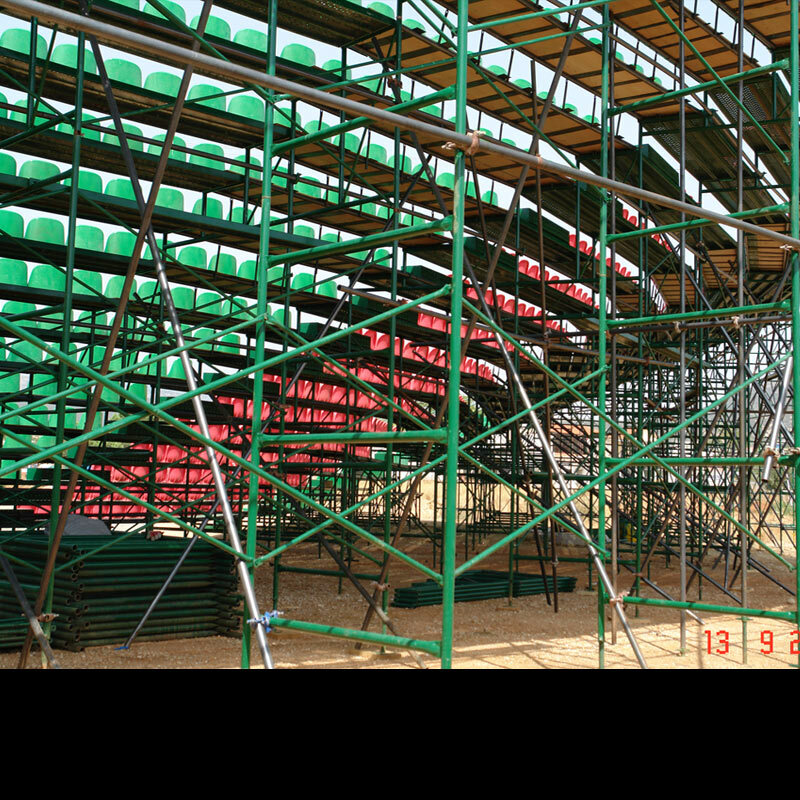 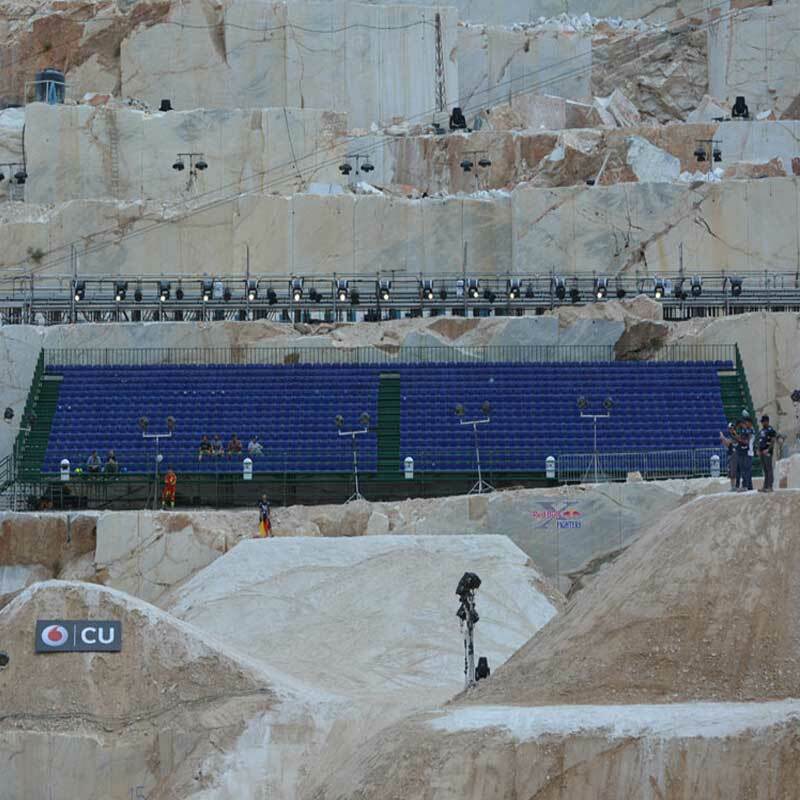 In 2005 our company took over the reinforcement of the body of an already existing tribune. 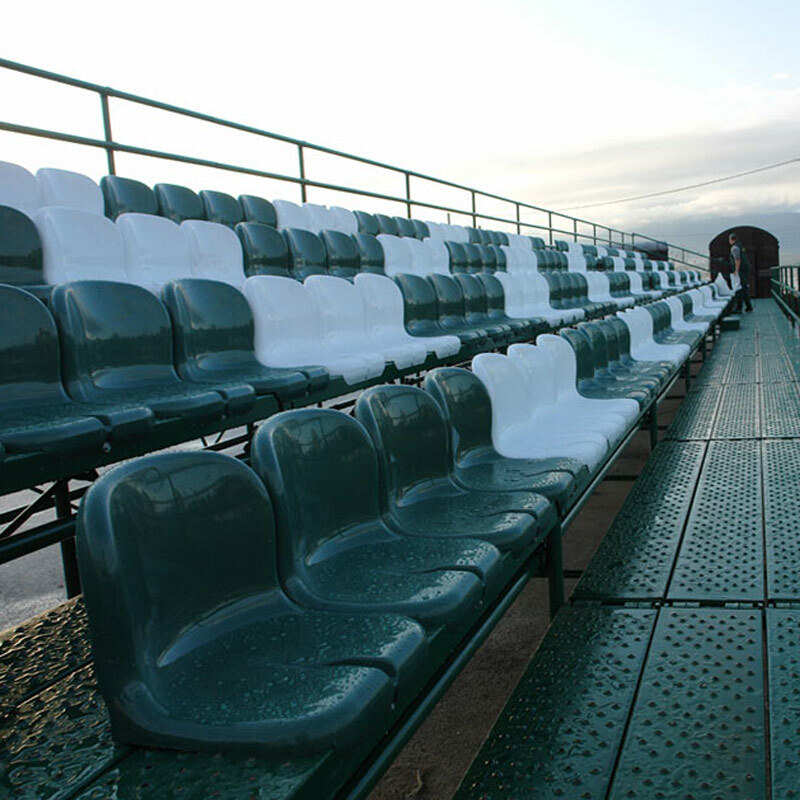 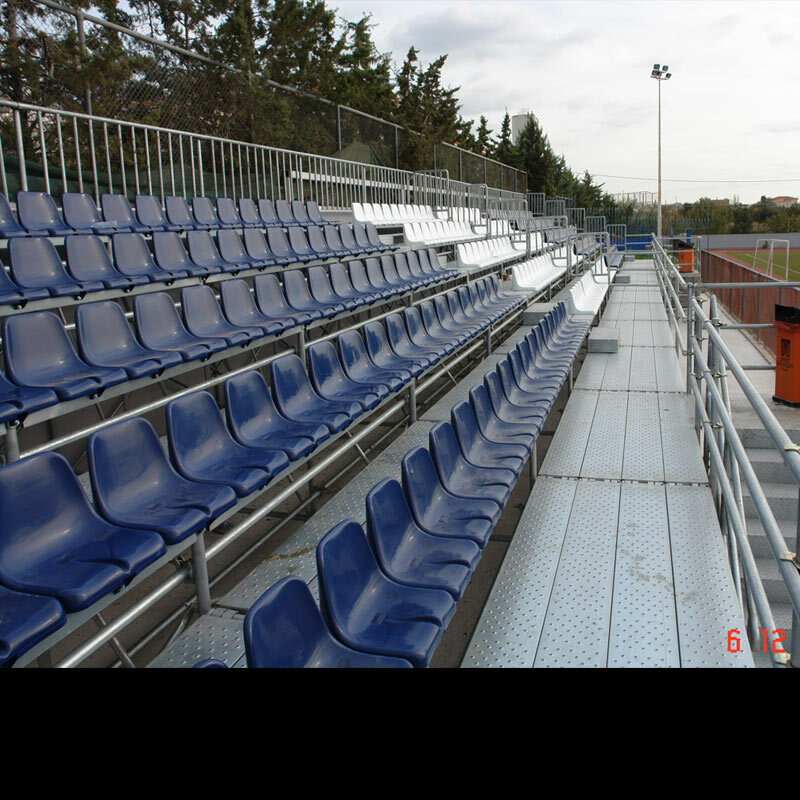 For the tribune’s better support, metal decks were placed as well as plastic seats. 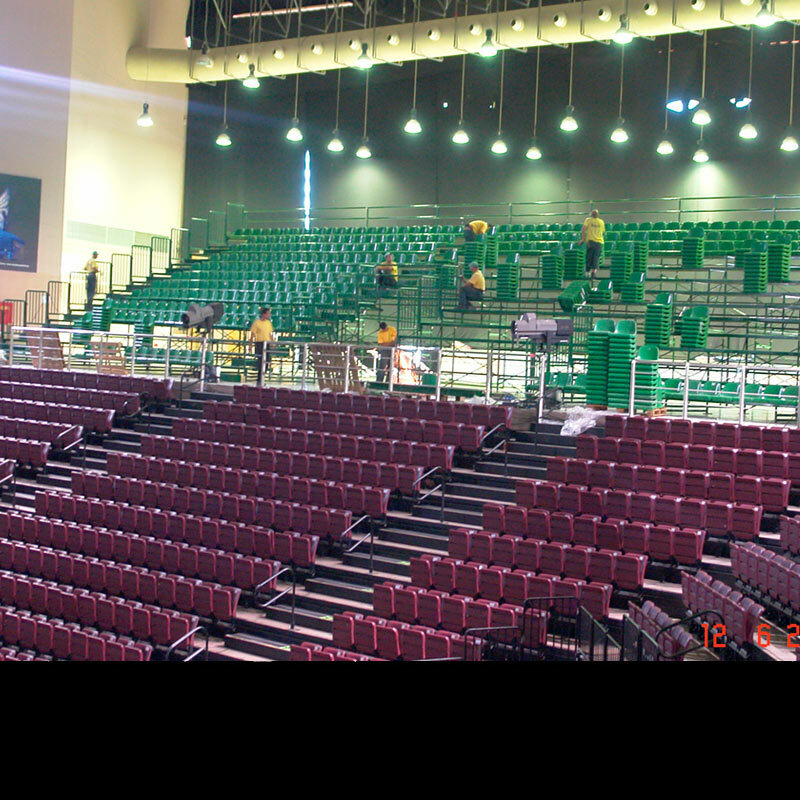 The tribune’s total capacity is 1200 people. 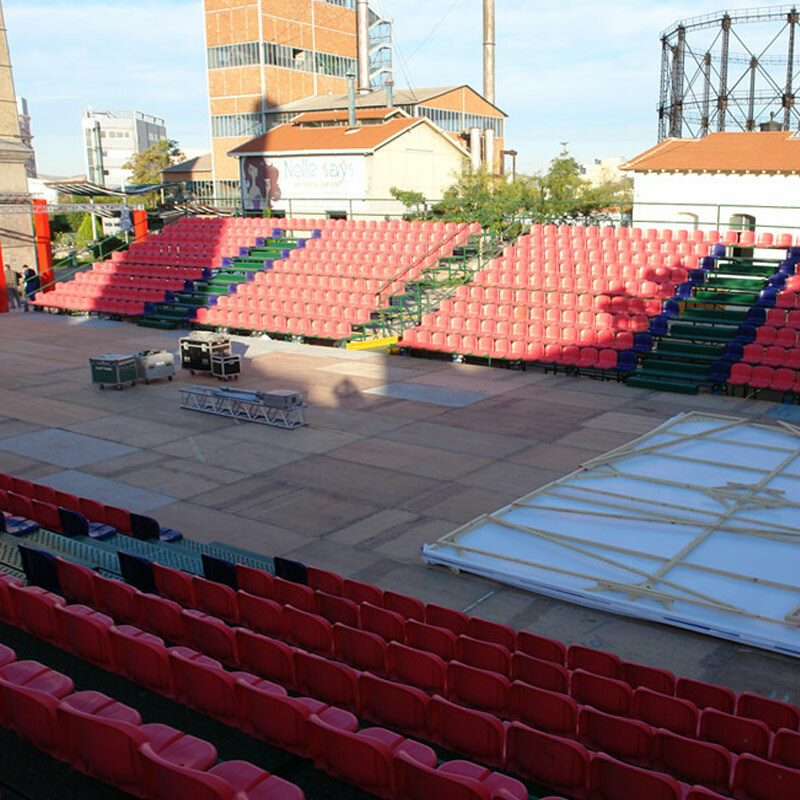 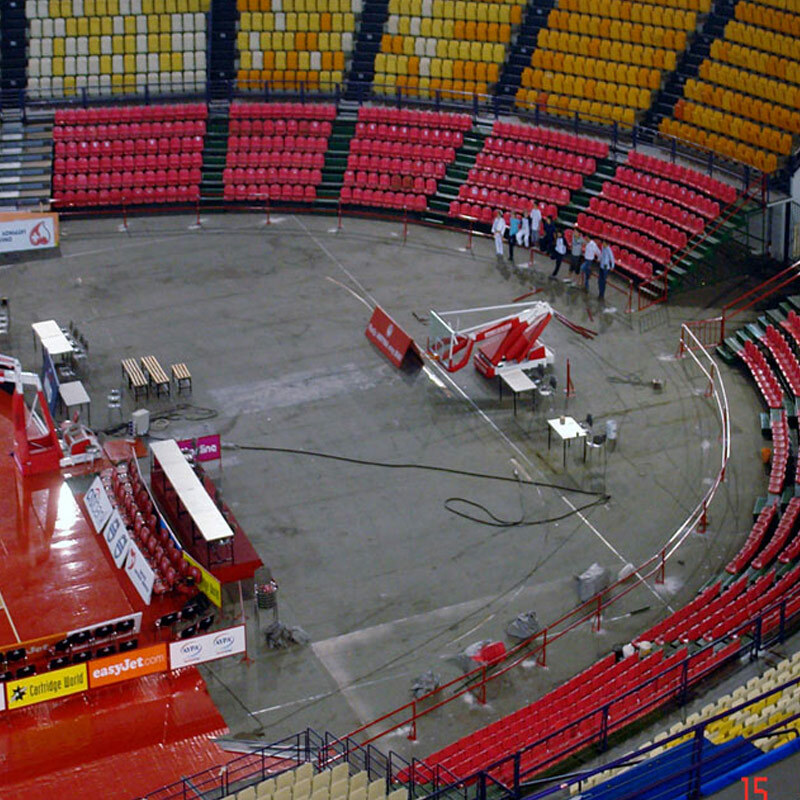 PROJECT: Settling, hiring and disassembling of three metallic tribunes with plastic seats for the show “Thermopileia” at Thermopiles in 2009. 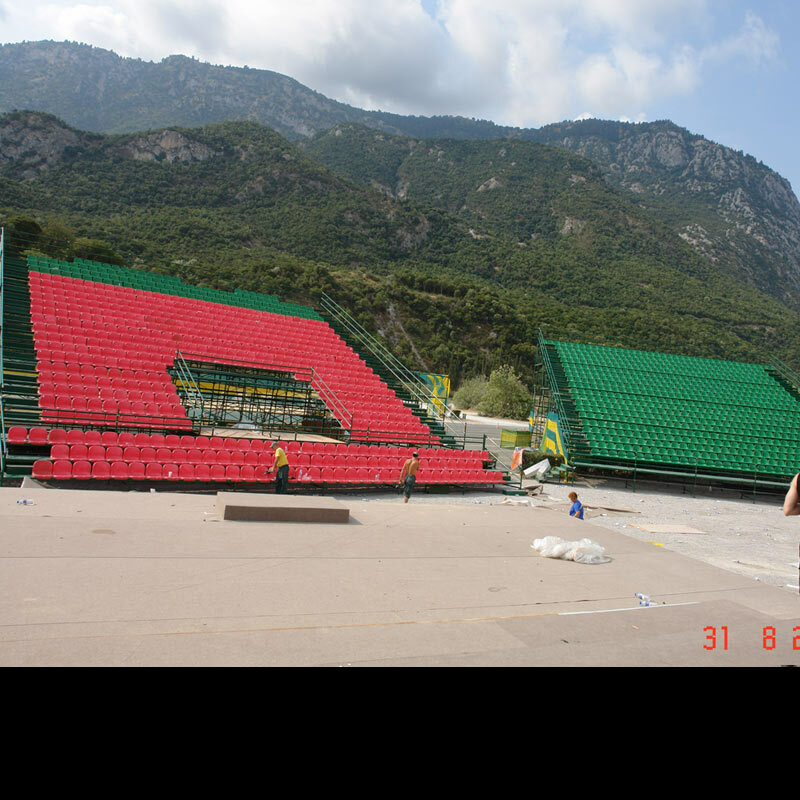 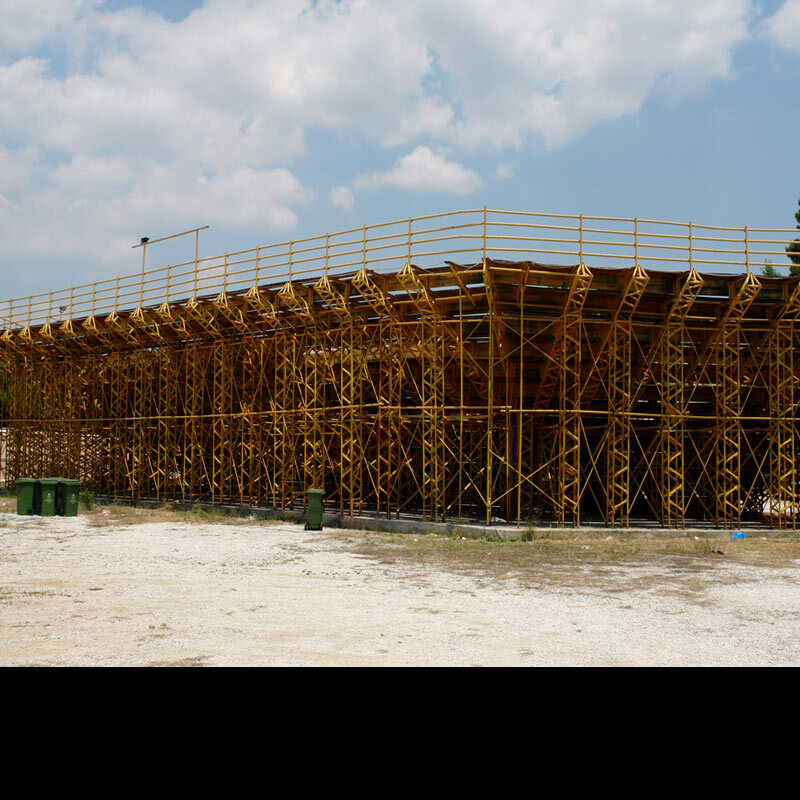 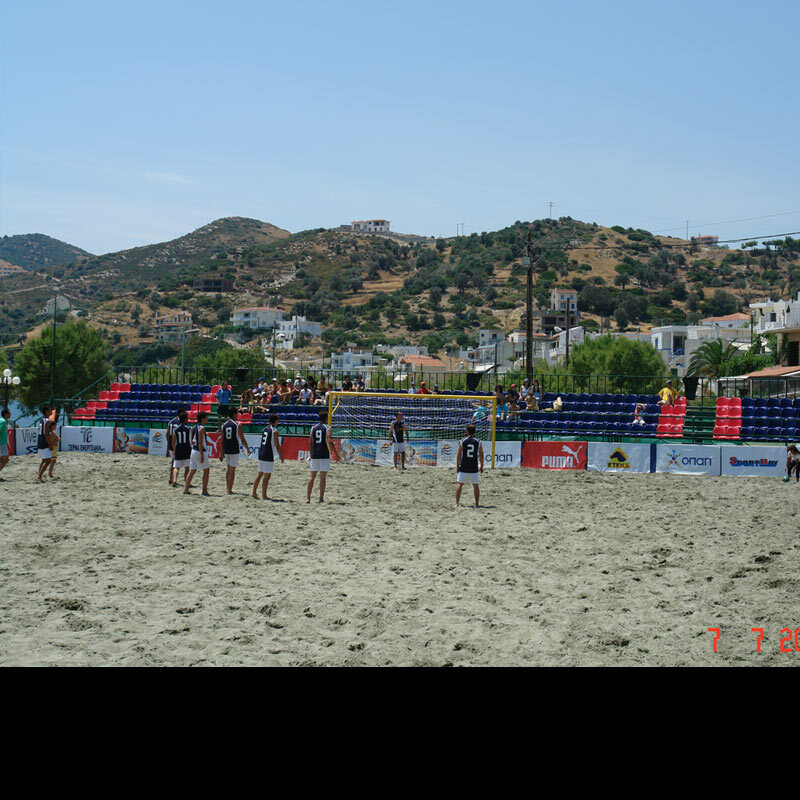 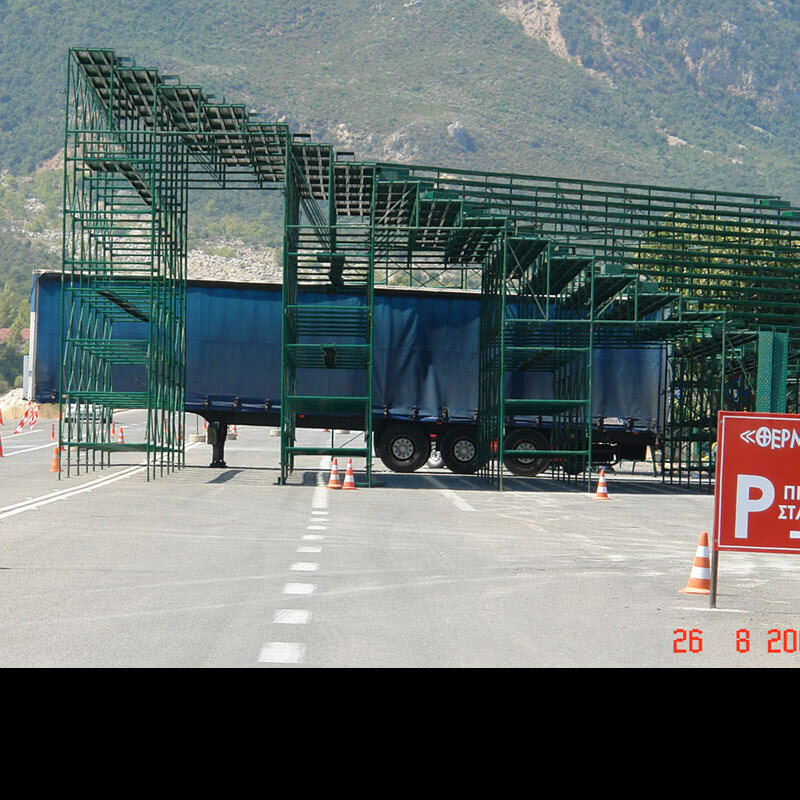 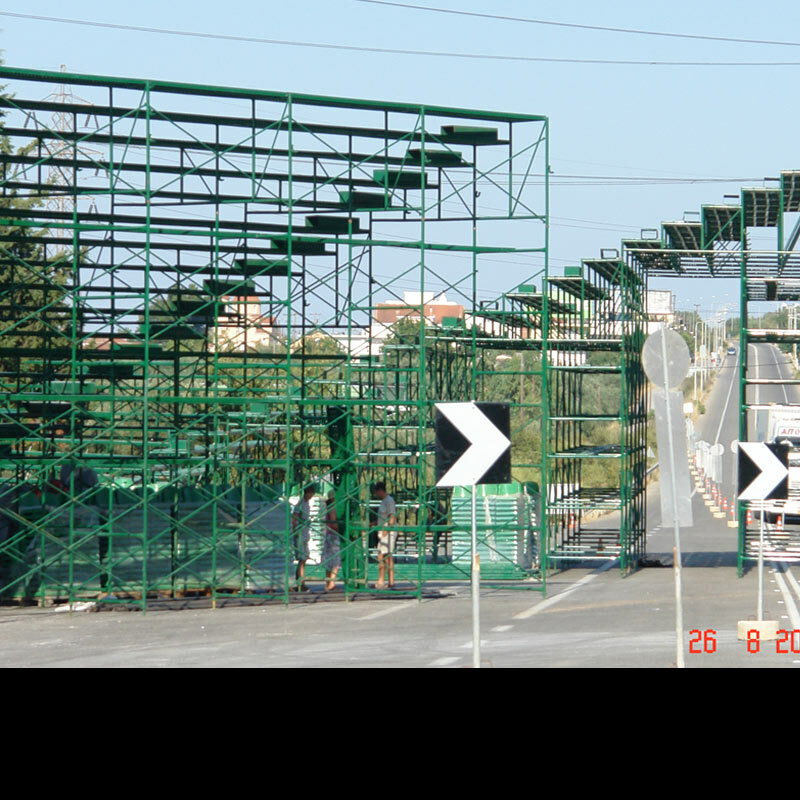 PROJECT: Placement of a wooden tribune at Vrilissia in 2003. 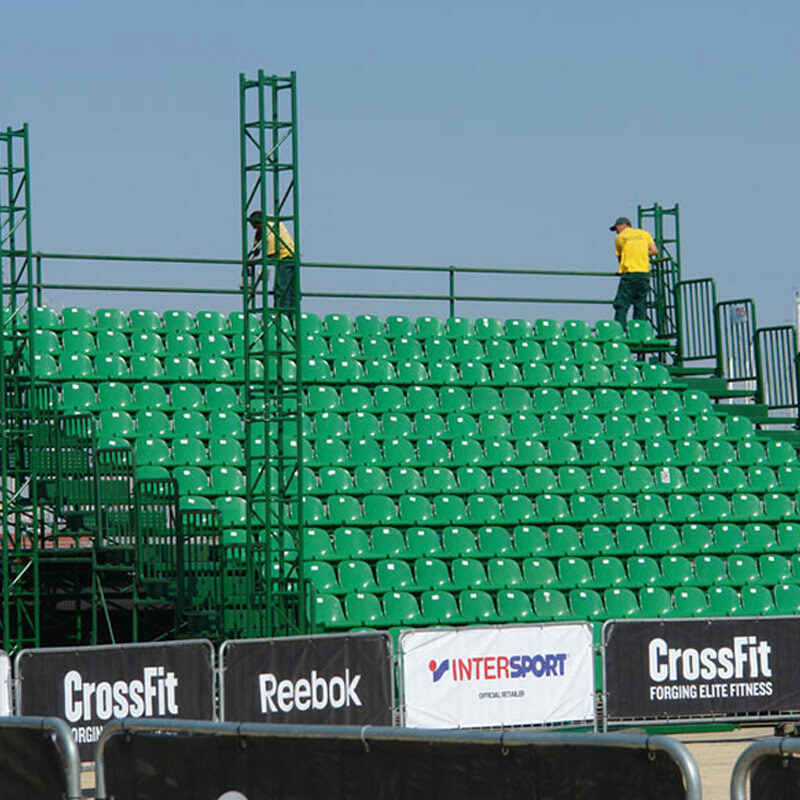 Later the tribune’s body was properly supported.